Pantone, the global color authority, believes our digitally-saturated, socially-isolated lives need a healthy dose of coral to comfort, connect, and soothe. 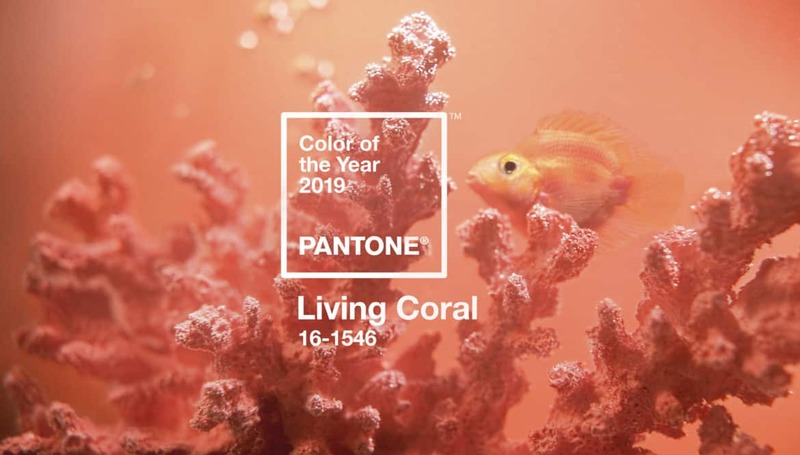 Pantone announced PANTONE 16-1546 Living Coral as its Color of the Year 2019, described as an animating and life-affirming shade of orange with a golden undertone. 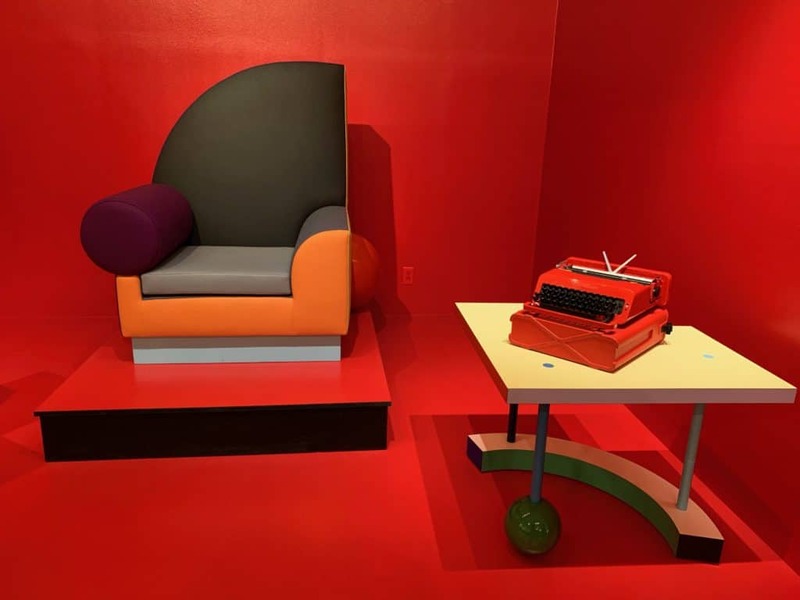 “With consumers craving human interaction and social connection, the humanizing and heartening qualities displayed by the convivial Pantone Living Coral hit a responsive chord,” says Leatrice Eiseman, Executive Director of the Pantone Color Institute. 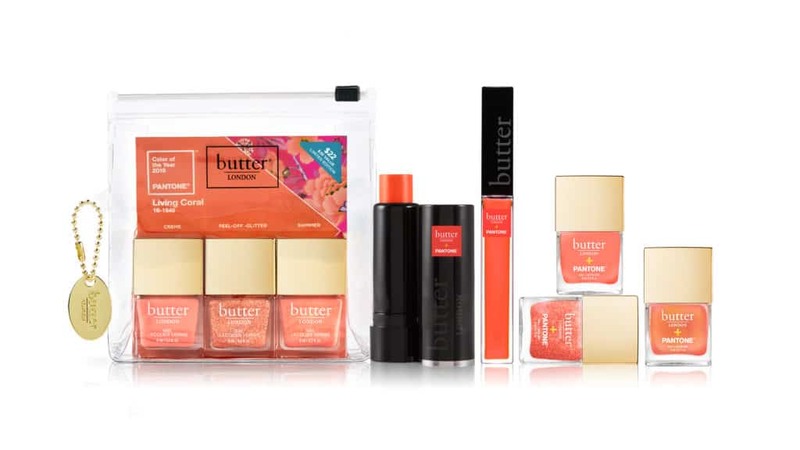 According to Pantone, coral is an antidote to the onslaught of digital technology and social media invading daily life. 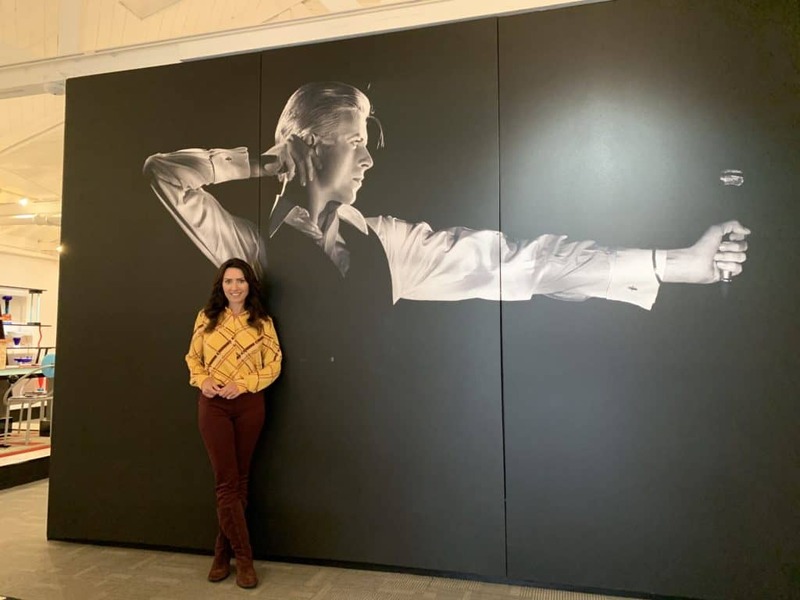 “We are seeking authentic and immersive experiences that enable connection and intimacy. 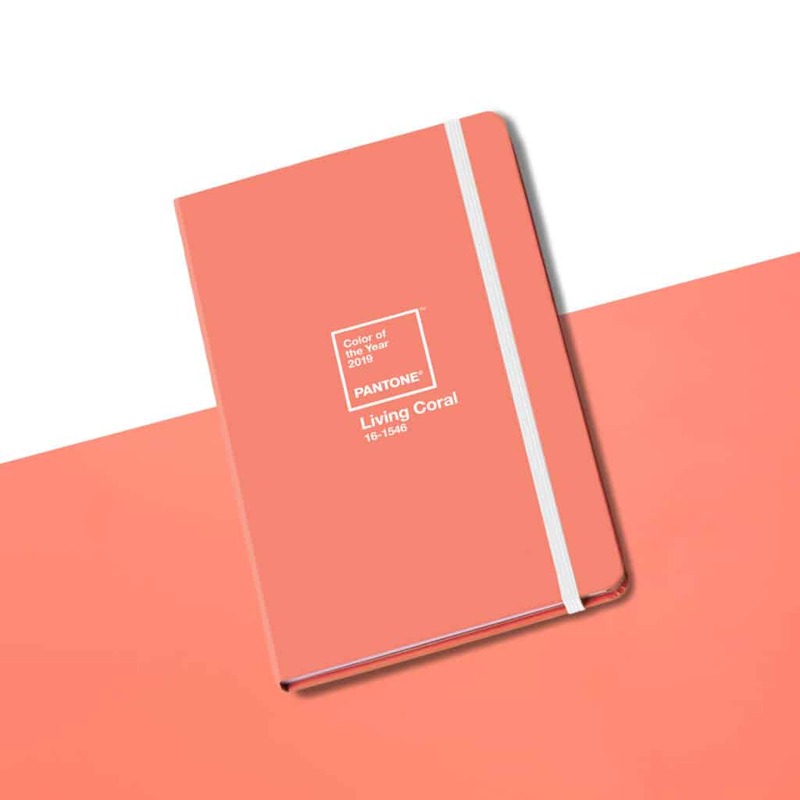 The engaging nature of PANTONE 16-1546 Living Coral welcomes and encourages lighthearted activity and symbolizes our innate need for optimism and joyful pursuits,” says Eiseman. 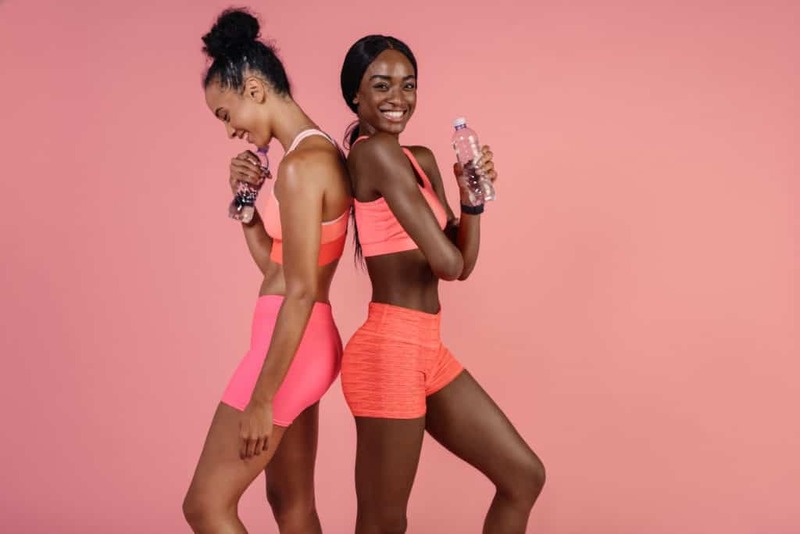 Adobe stock image of models wearing workout clothes in shades of coral. 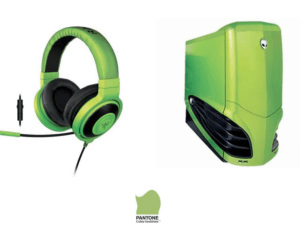 Each year, Pantone probes our collective psyche and pop culture to find out what colors are resonating in the minds and hearts of consumers. 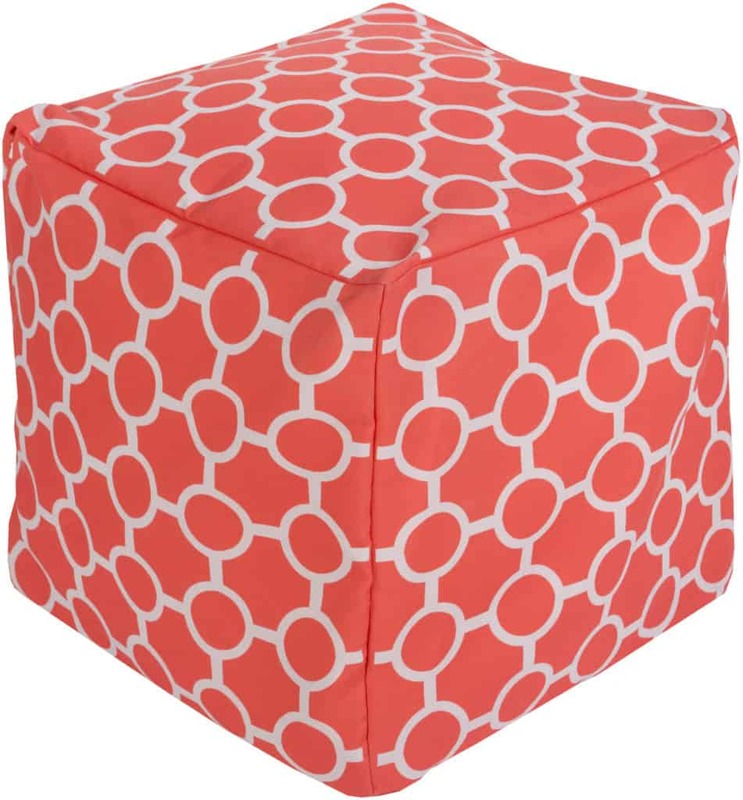 Pantone believes Living Coral embodies our desire for playful expression and represents the fusion of modern life. 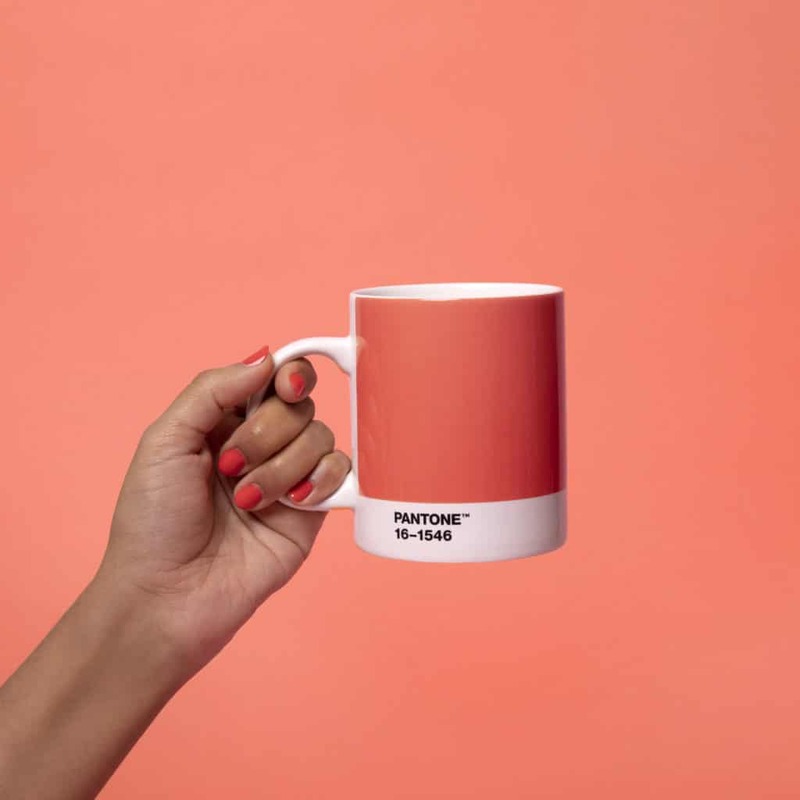 “Pantone Living Coral is a nurturing color that appears in our natural surroundings and at the same time, displays a lively presence within social media,” says Eiseman. 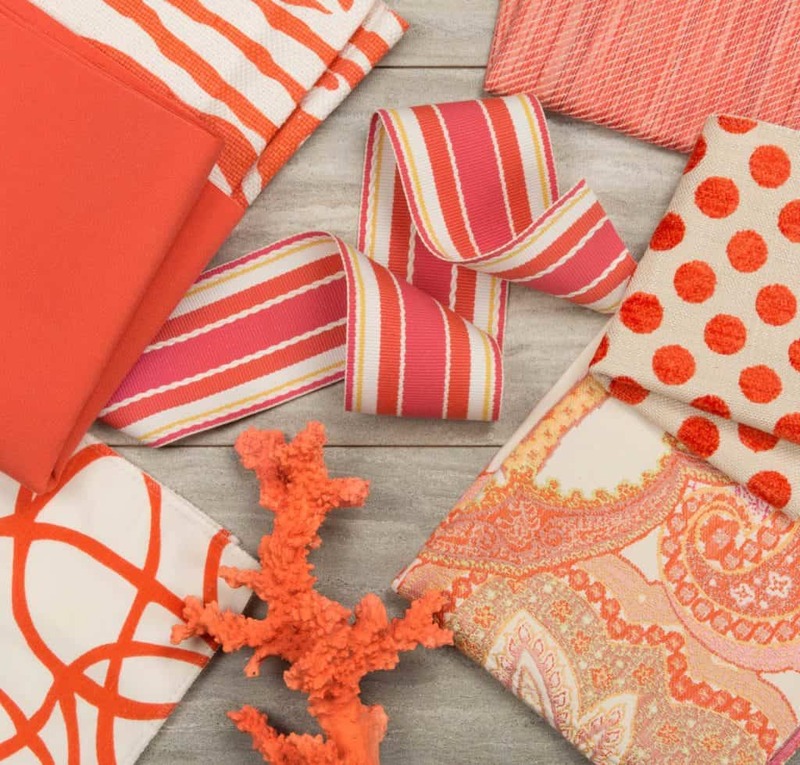 Expect to see Living Coral color in home interiors and consumer products ranging from makeup to stationery as designers and manufacturers interpret the 2019’s IT color. 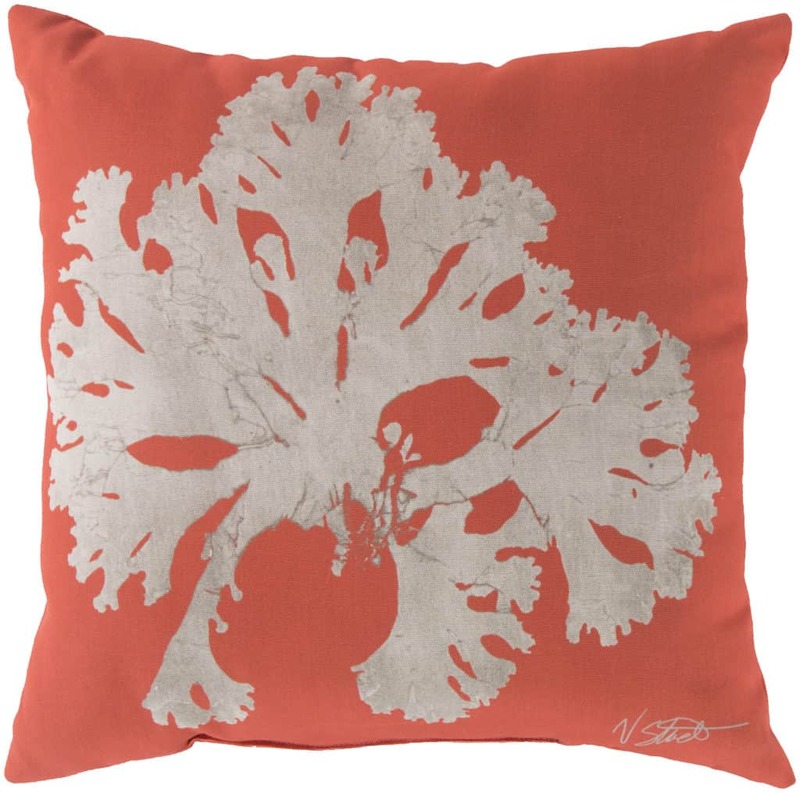 Pantone suggests for interior décor and furnishings to use Living Coral as a bold statement or a dramatic pop of color to any room setting whether in decorative accessories, tabletop, or on the wall. 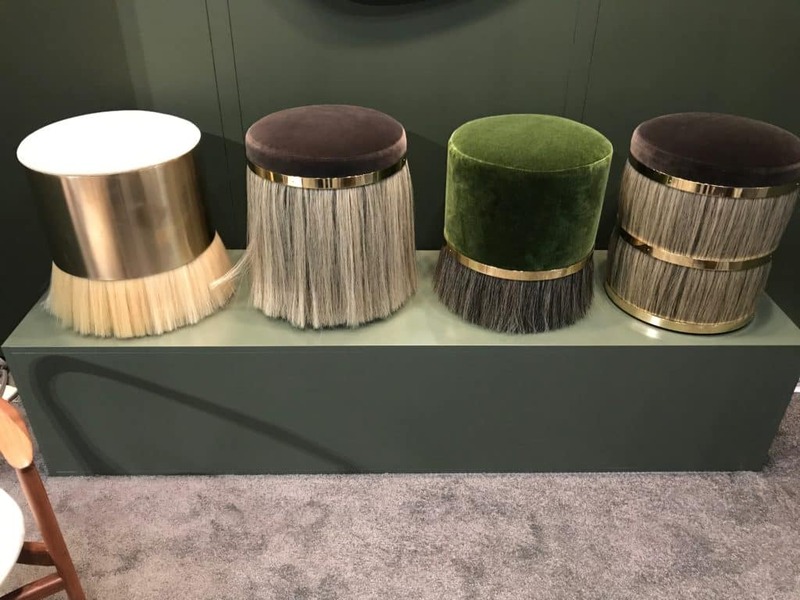 The color connotes tactility and human connection through accessories such as shag rugs, cozy blankets and lush upholsteries for a warm, comforting and nurturing feeling in the home. 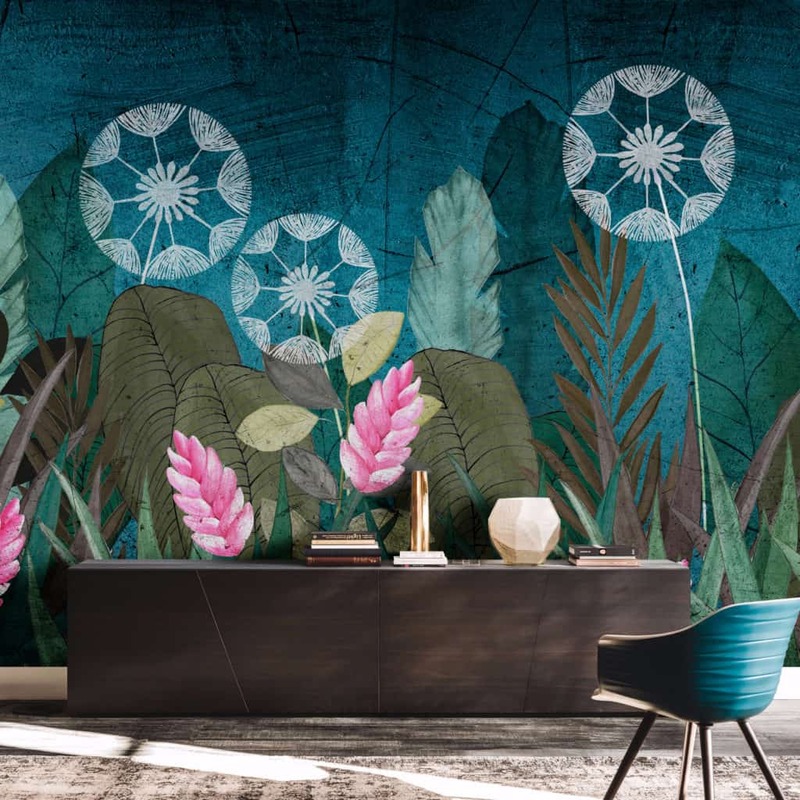 Home accessories company, Surya just announced its extensive line of coral-colored living space accents in over 100 Surya accessories across its product categories, including rugs, lighting, textiles, accent furniture, wall decor, and more. 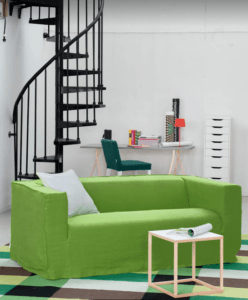 I’m always on the lookout for innovative design finds and my latest discovery is the Two Way Chaise Lounge because it offers a better way to sunbathe. 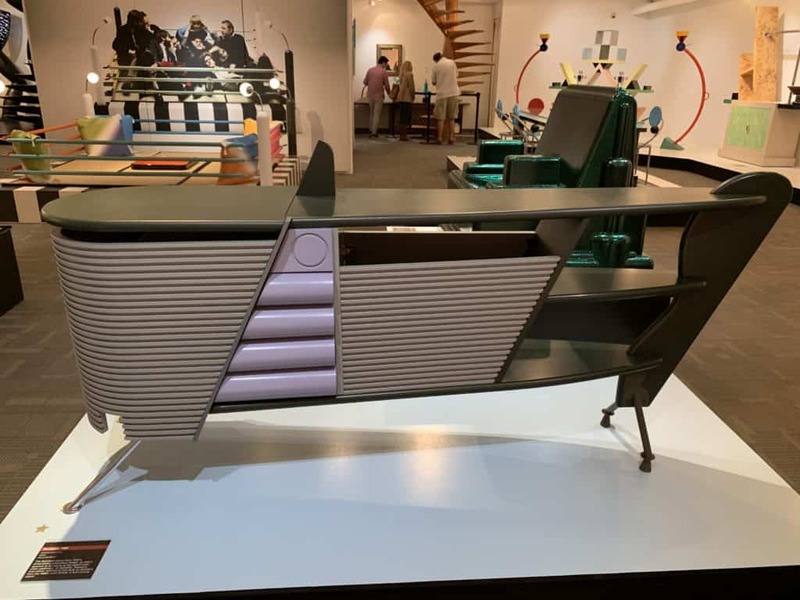 Invented by interior designer Kate Clarke, the Two Way Chaise Lounge is designed to raise up or down on either end so you can follow the sun’s rays without having to constantly get up and flip the chair around. I’m sure many of you can relate to the aggravation of having to move your lounge chair to follow the constantly changing direction of the sun. The shade inevitably creeps over your perfect poolside spot forcing you to shift positions to stay in the sun. 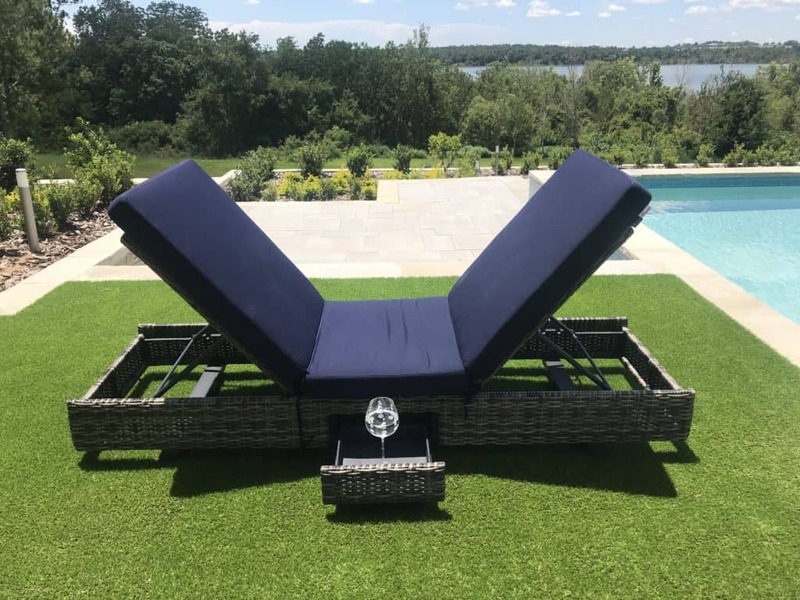 Kate had an ah-ha moment while lounging at a resort’s crowded pool that became the inspiration for her Two Way Chaise Lounge. 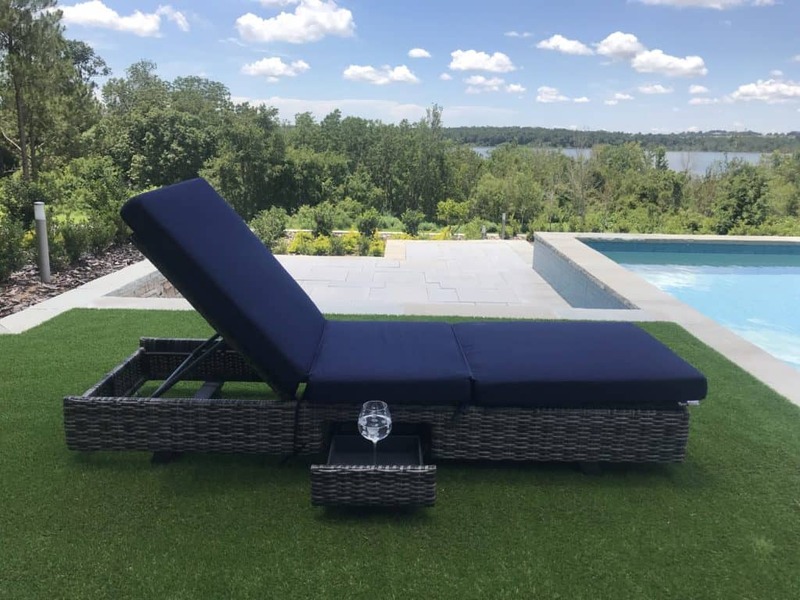 The Two Way Chaise Lounge pictured here in the faux wicker frame with optional cushions in navy blue. 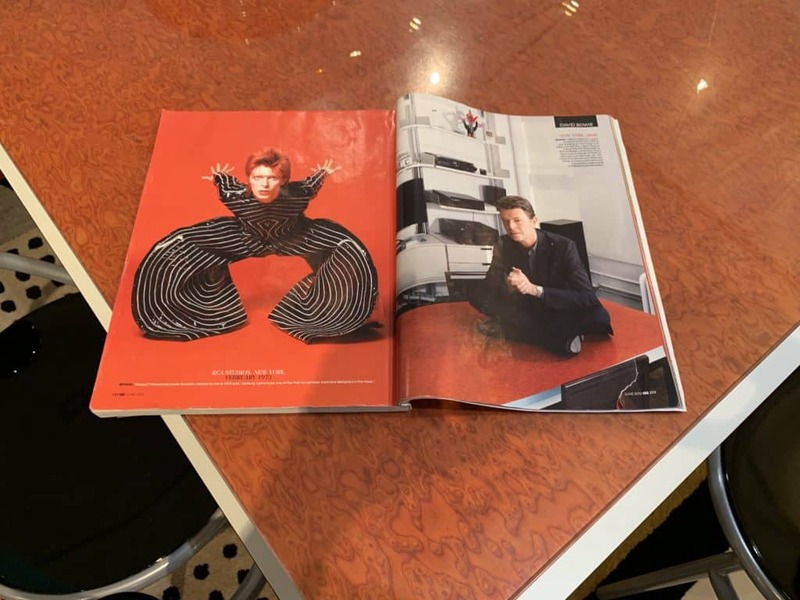 Photo credit: The Design Tourist. 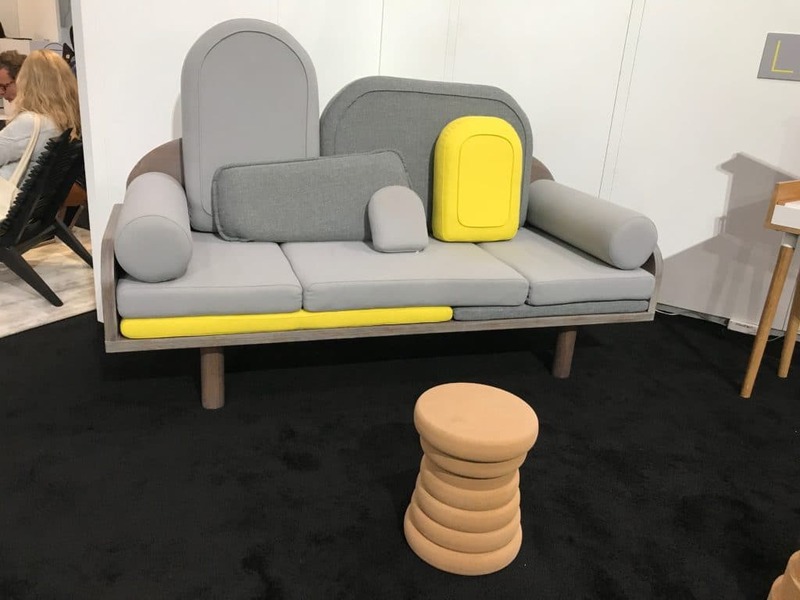 “One guy lifted his chaise lounge around and hit me with it and I thought to myself— Wow if the lounge chair could go up or down on both sides, that wouldn’t be an issue,” says Kate, who engineered the Two Way Chaise Lounge with several practical features. 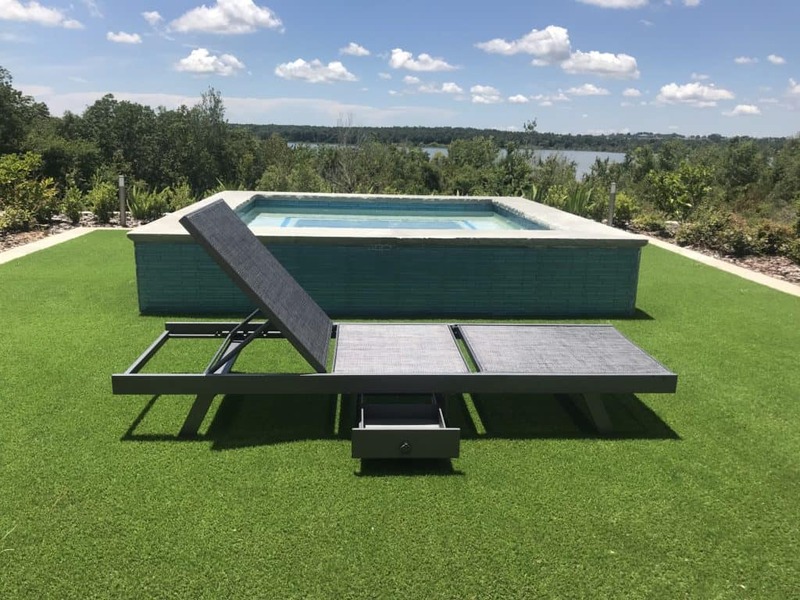 Each chair comes with a pull out drawer underneath the seat that contains a solar charger for electronic devices so you don’t need to be tethered to an outlet poolside. 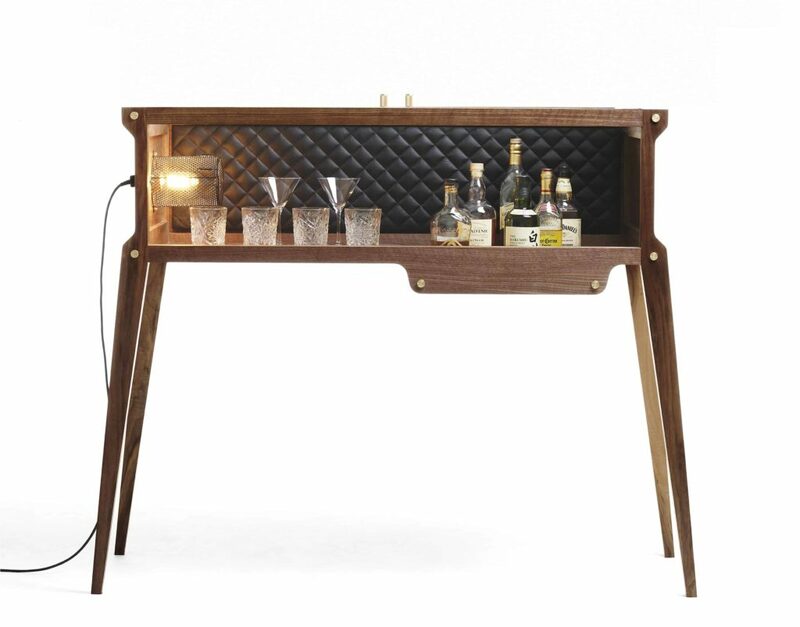 The pull out drawer doubles as a drink stand eliminating the need for a side table. 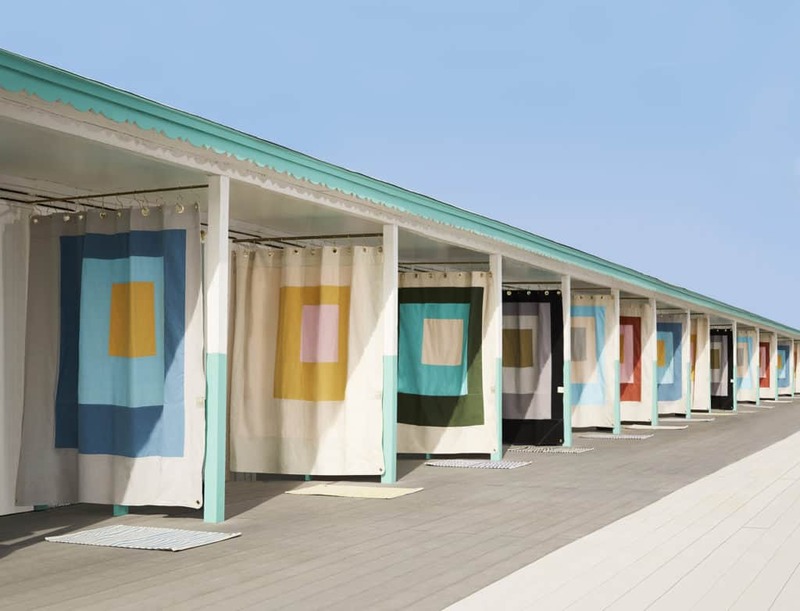 This game-changing invention also provides a stylish, space-saving solution for busy resorts and high volume cruise ships where poolside spots are at a premium. Each Two Way Chaise Lounge was a built-in drawer that contains a solar charger to charge electronic devices poolside. I tried out the Two Way Chaise Lounge recently to even out my ridiculous tennis tanlines and found it super easy to use. 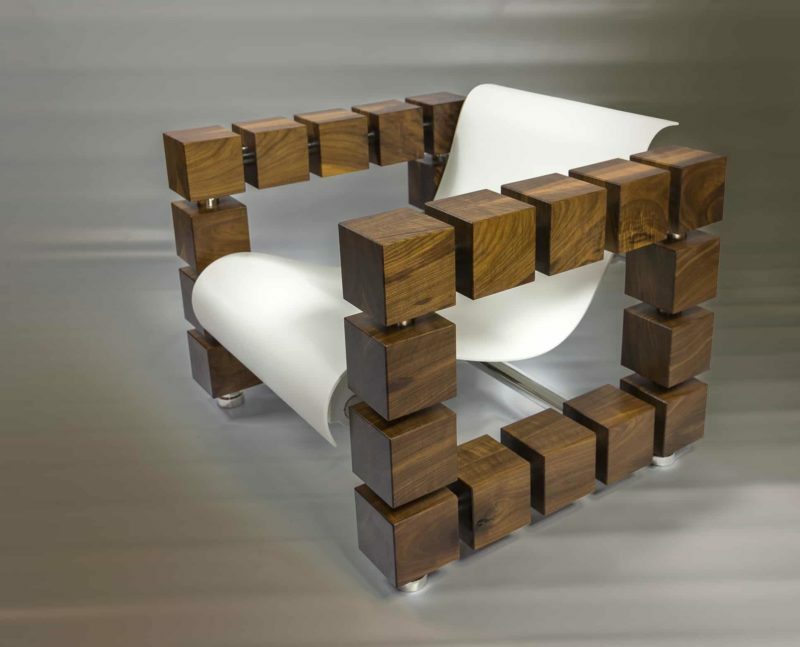 The chair is lightweight and easy to lift up or down on either side. I really enjoyed the convenience of the solar charger which kept my cell phone battery charged up so I could text and check emails poolside. 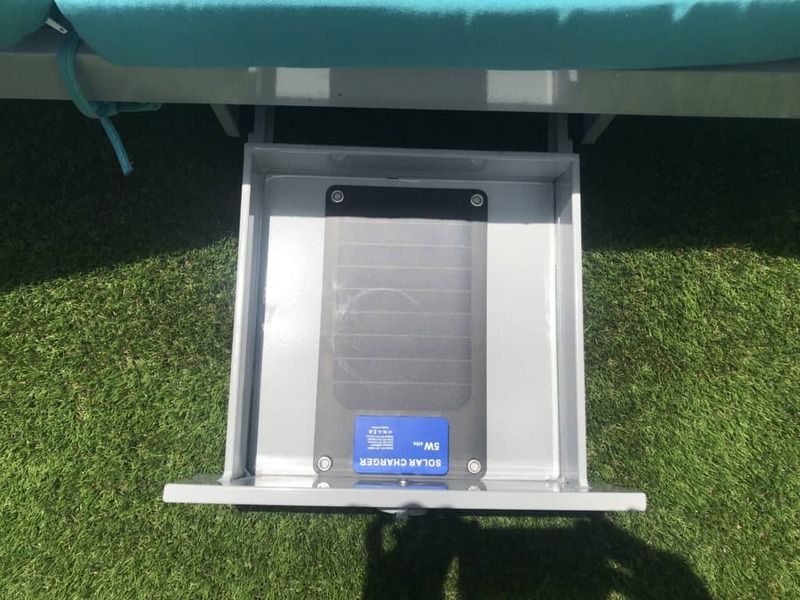 The drawer comes with an optional lock so I can lock up my belongings and take a dip in the pool, knowing they are safe. The Design Tourist aka Karen LeBlanc sunbathing with the Two Way Chaise Lounge. 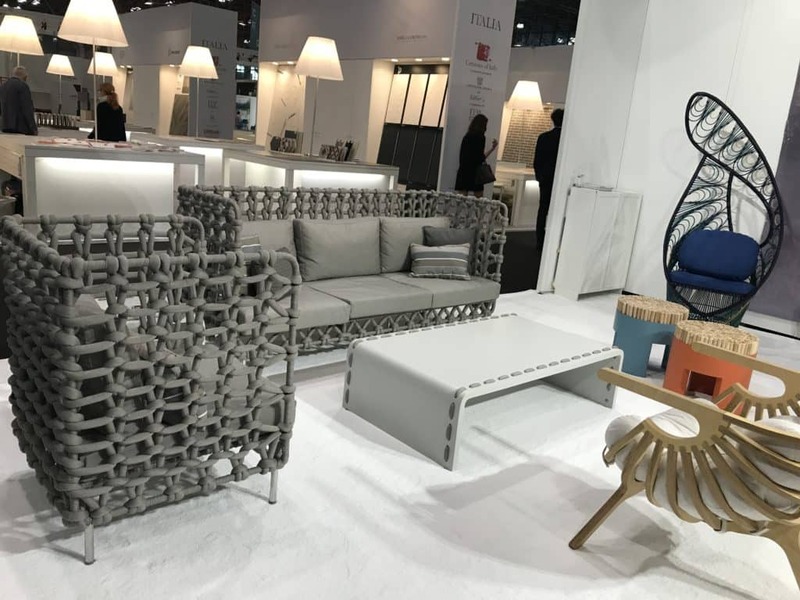 I also appreciate the lounge chair’s sense of style; it comes in a faux wicker frame, aluminum frame and poly wood frame with optional cushions made of Sunbrella fabric and outdoor rated foam in a wide variety of colors. 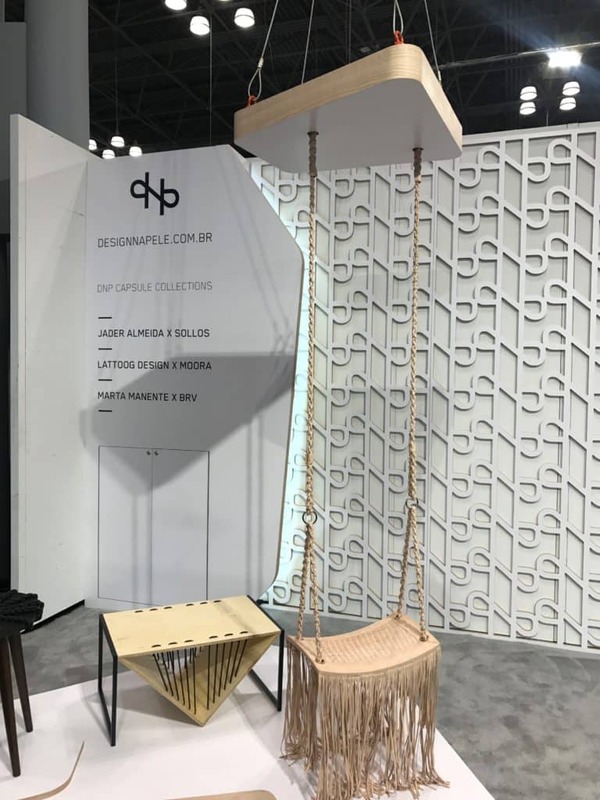 For the resort and hospitality industries, the Two Way Lounge Chair is available in a sling fabric that can be customized with a logo. 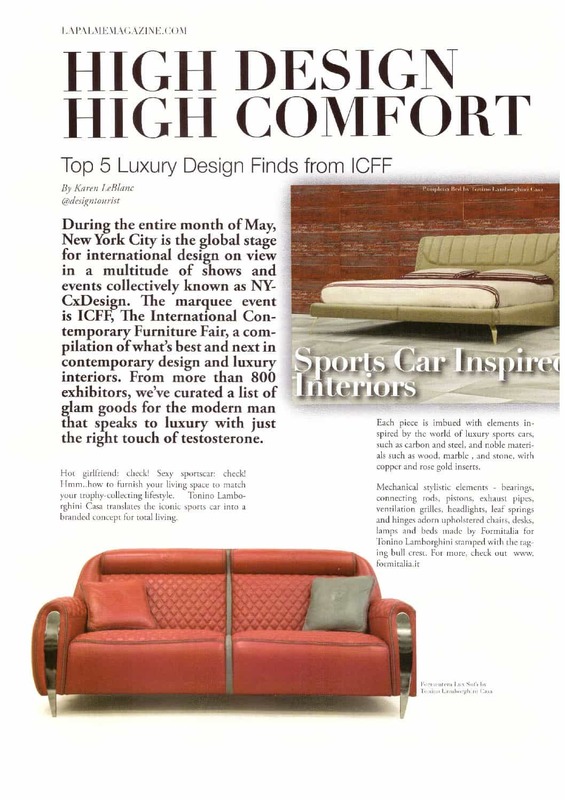 The Two Way Chaise Lounge in sling fabric that can be customized with a resort or cruise line’s logo. 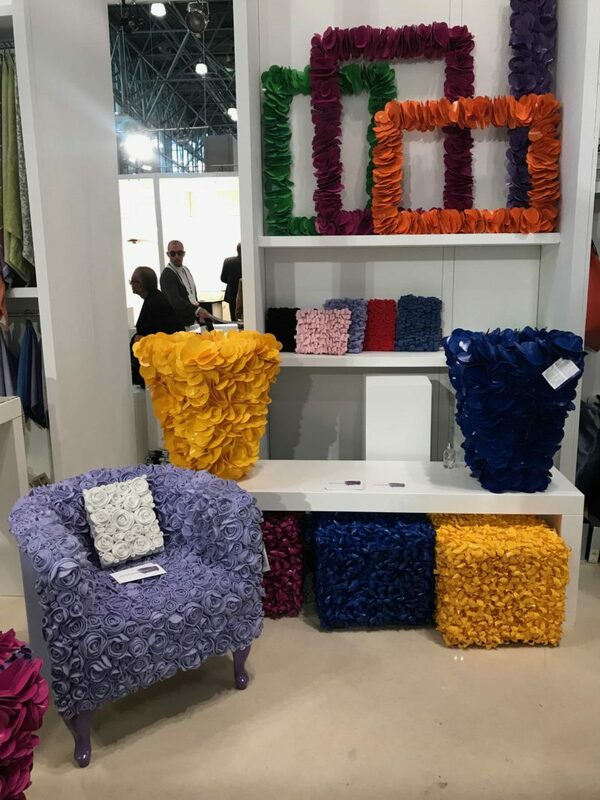 Kate has a direct relationship with the factory that produces her Two Way Chaise Lounge and can fulfill a large custom order in only eight to ten weeks. 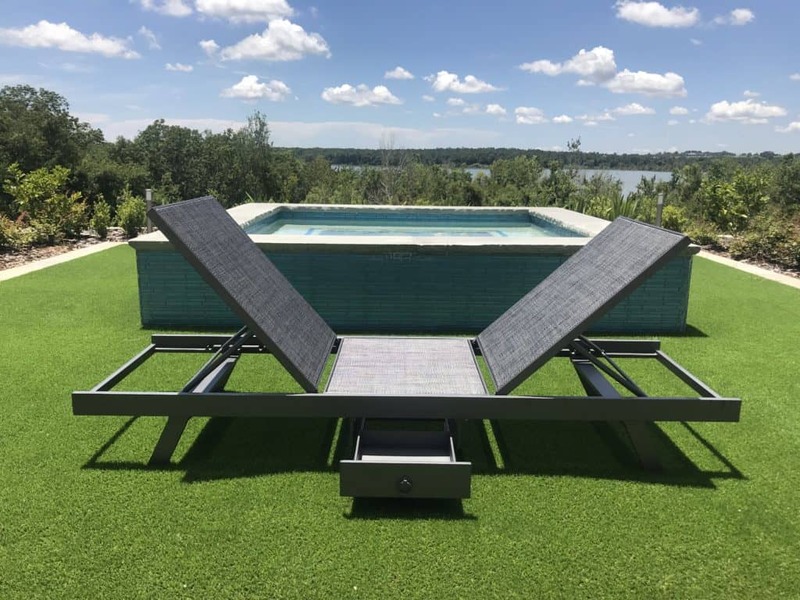 The Two Way Chaise Lounge is a clever design find that offers a stylish space saving solution for the hospitality industry and goes great with any poolscape at home. 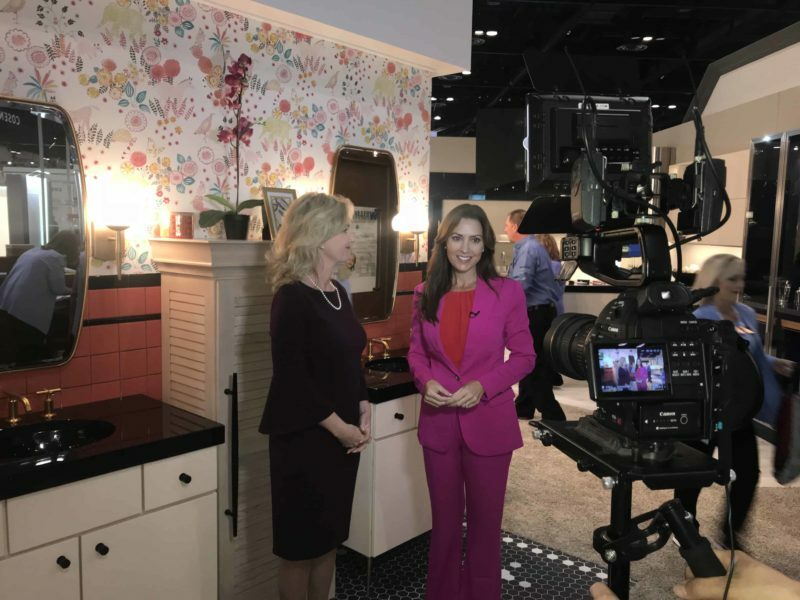 I recently toured The 2018 New American Home, the official show home of the NAHB International Builders’ Show known as IBS held in Orlando, Florida. 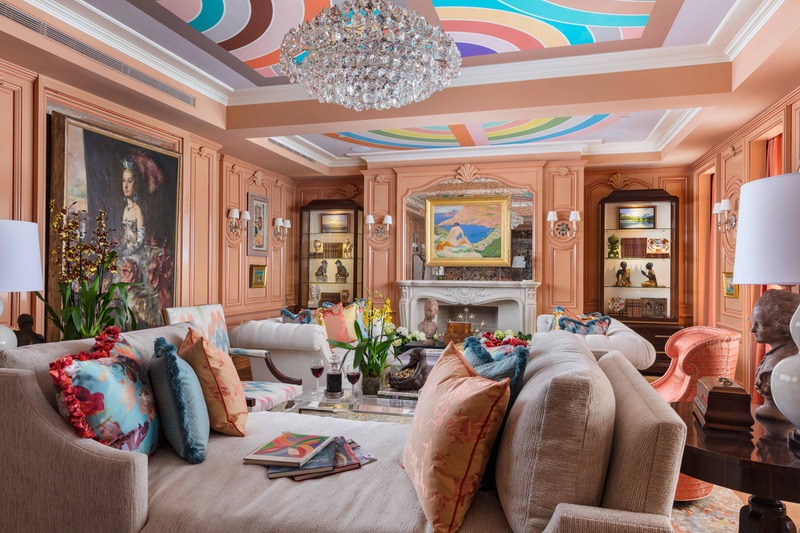 I was joined by interior designer Kate Clarke, President of Homes Reimagined, who decorated the home and specified many of its architectural features. 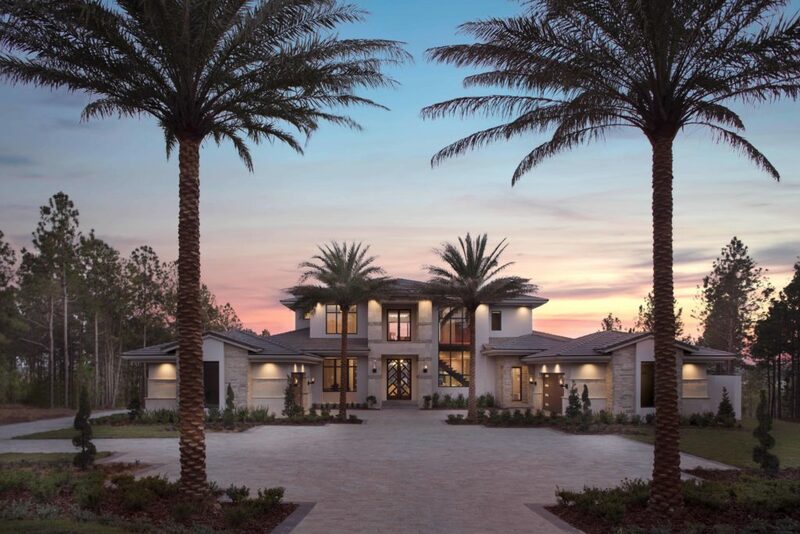 Located in Bella Collina in town of Monteverde, about 20 minutes from downtown Orlando, the 6,662 square-foot home sits on a ridge overlooking Lake Apopka with sweeping vistas of rolling terrain that melt into the horizon. 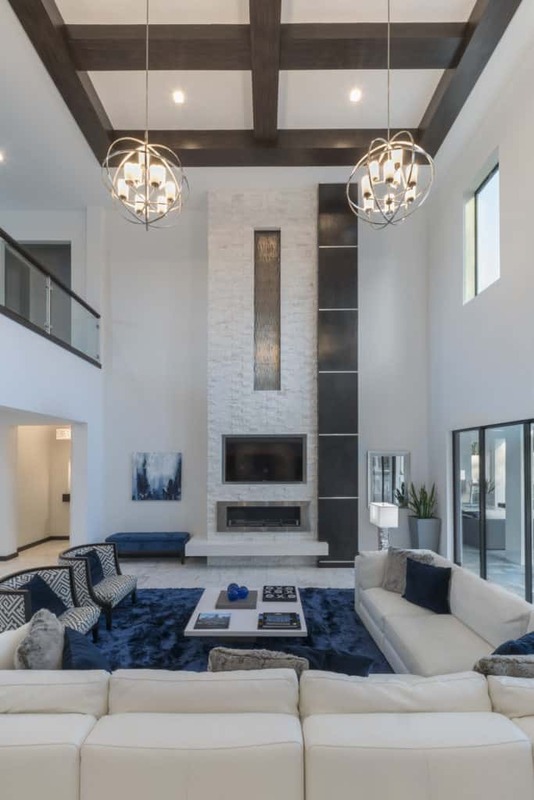 The 3.975-million-dollar show home was built by Legacy Custom Built Homes and introduces an updated, streamlined interpretation of Tuscan architecture to this country club community. 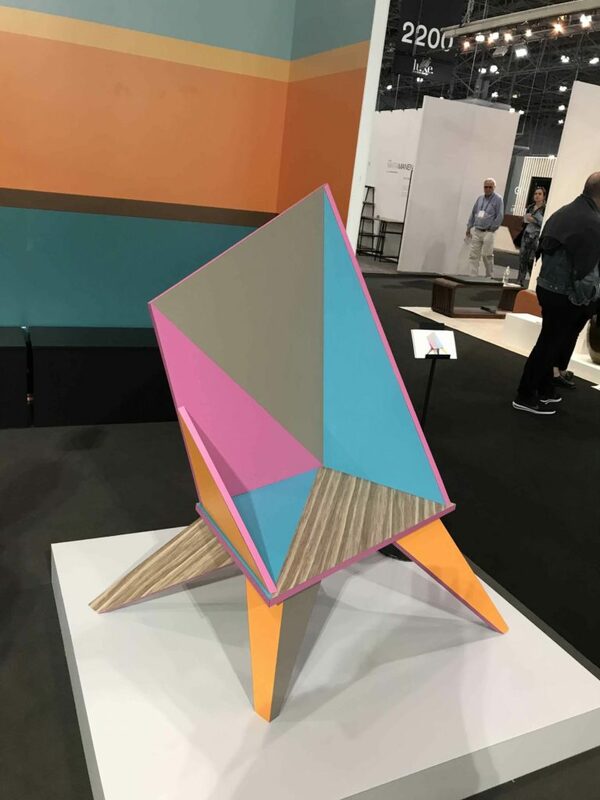 Here are the top trend takeaways for a look at what’s new and next in home decor and spatial design. 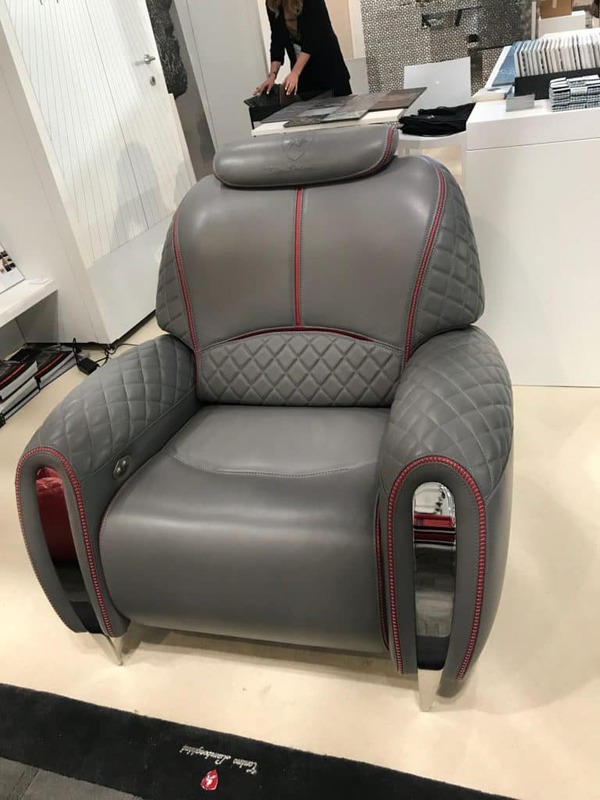 The garage has always been a multitasking space in the home often serving as a dumping ground for household excess, a game room, hobby shop, or man cave. Now the place we park our cars provides a safe haven in the home. 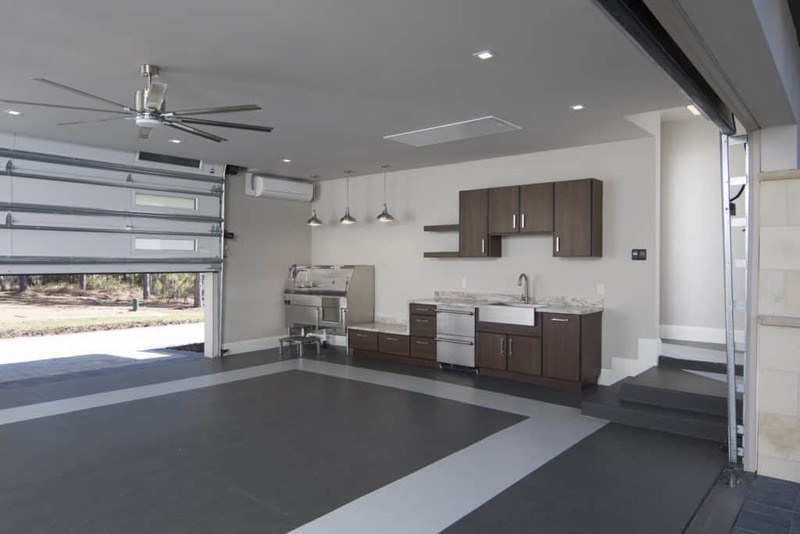 Luxury garages outfitted with air conditioned storage space are designed to double as a safe room with reinforced walls. 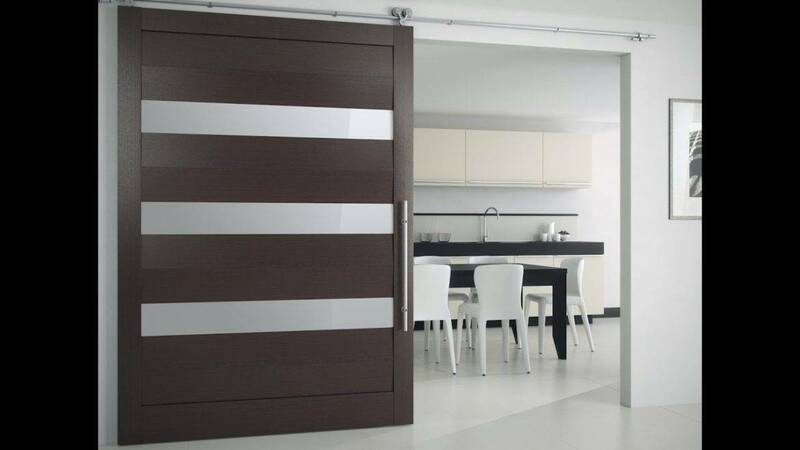 High-end garages also pay attention to design details such as hidden and drywalled motorized tracks for garage doors. 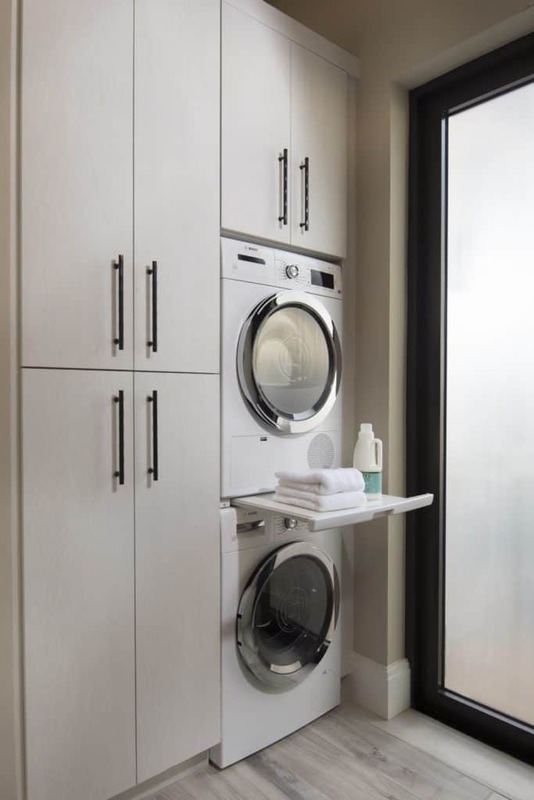 Large capacity washers and dryers now come in stackable models offering a space saving option to those side by side models. 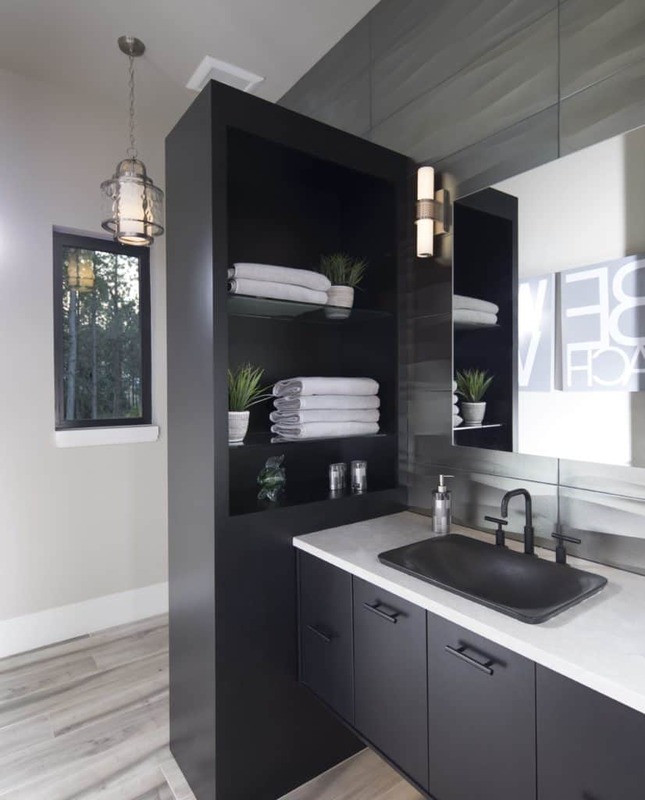 This is new innovation in laundry room design takes cues from urban spaces such as small apartments where space is limited. 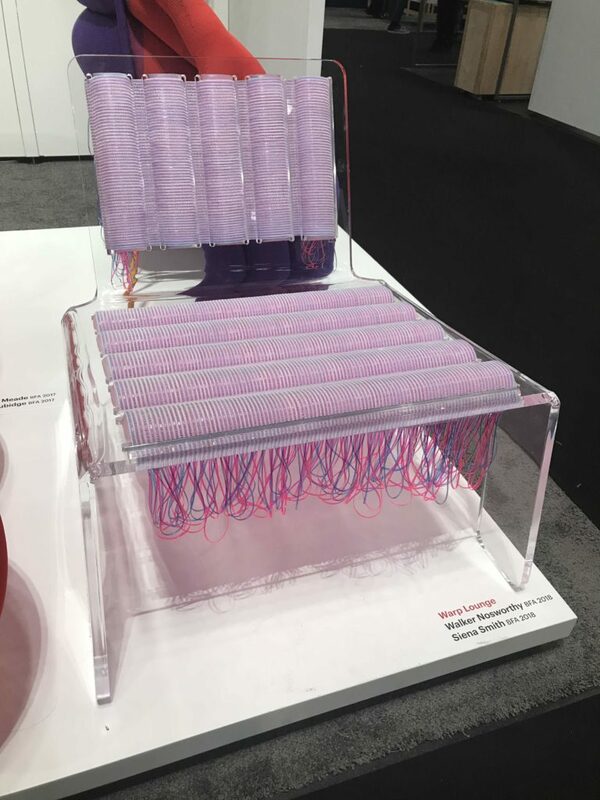 Until now, stackable washers and dryers only came in small capacity units but this latest design trend gives you the power of large capacity with more space efficiency. 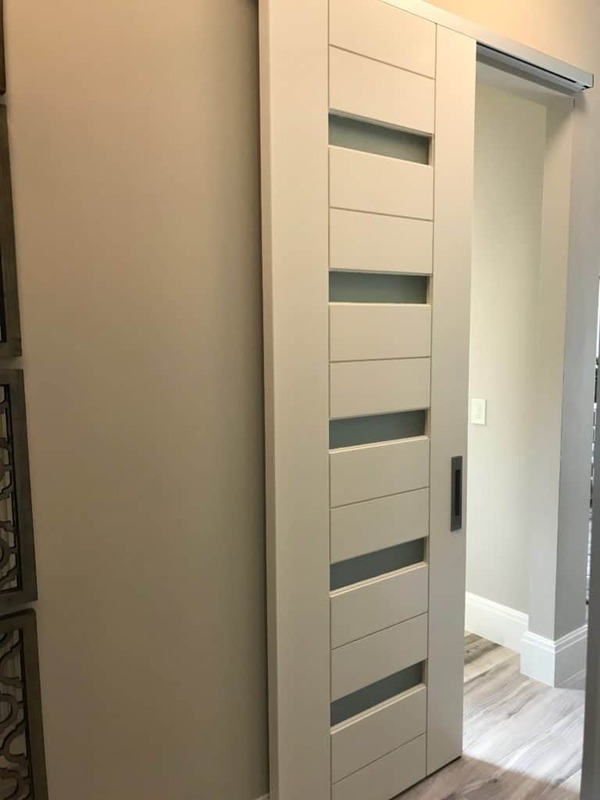 Barn doors remain popular design elements in the home from master closets to laundry room and office doors, popular for their space saving slide, side-to-side hardware rather than doors that require a wide berth to swing out. 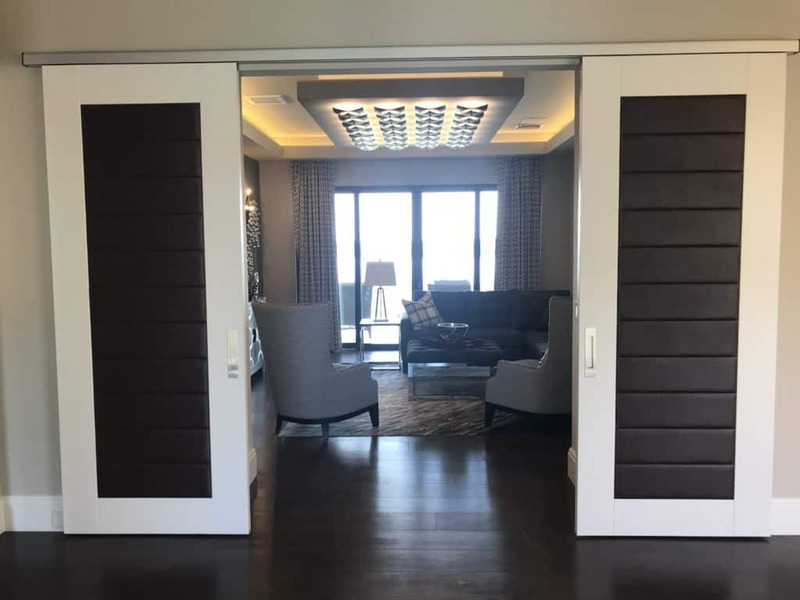 As style trends more towards modern and contemporary looks, the rustic barn doors are falling out favor for sleeker barn doors with modern hardware. A great example is this clean barn door track without the typical wheels by Hafele that updates the look of the sliding door. 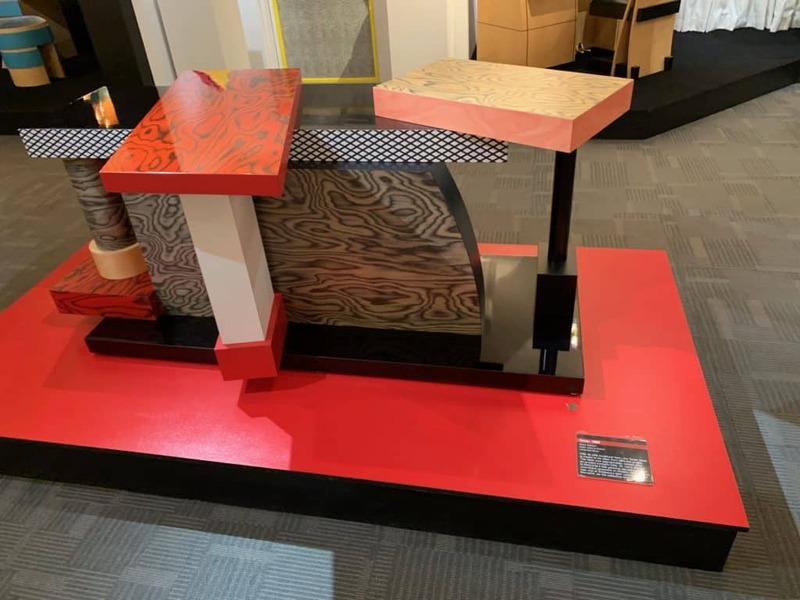 There was a lot of buzz at the 2018 Kitchen and Bath Industry Show about this concept of a space within a space in kitchen design. 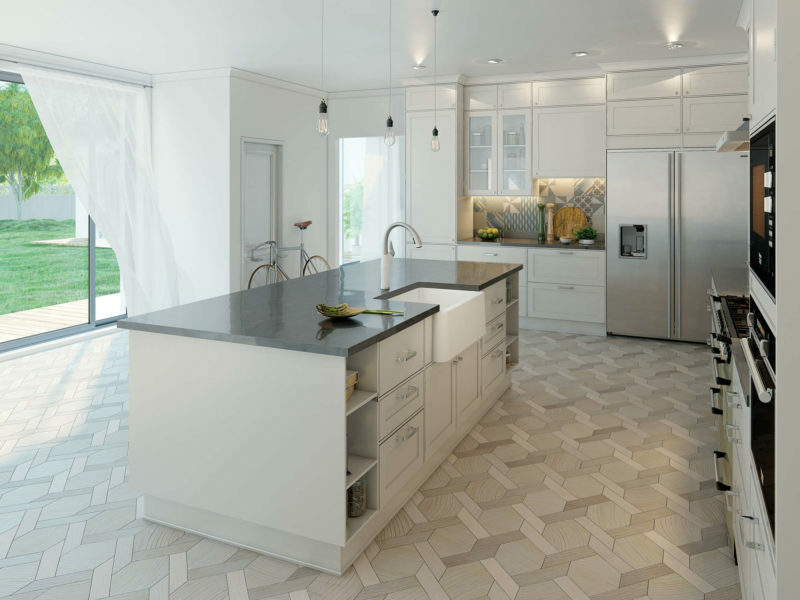 The layout is gaining traction as an alternative to the ubiquitous open plan kitchens dominating today’s floorplans. 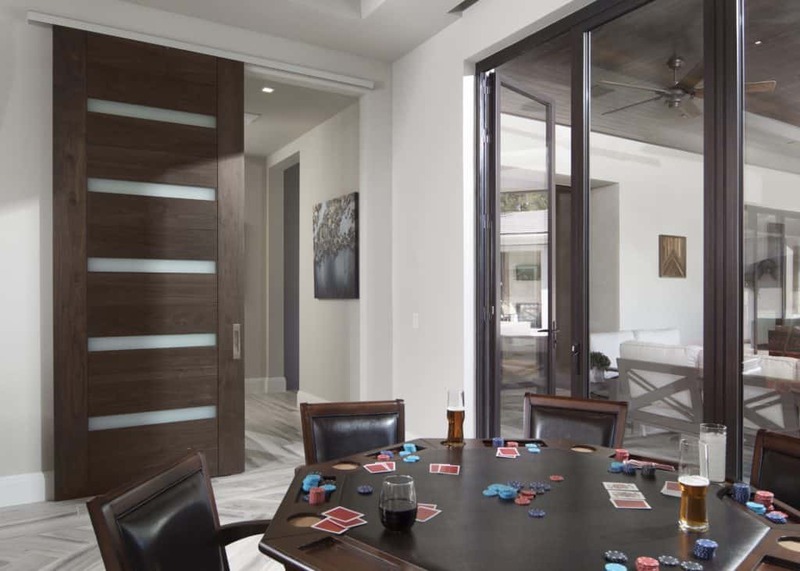 Envision a cut-out wall that overlooks the dining and family room and that is your “space within a space.” It’s open yet separate. 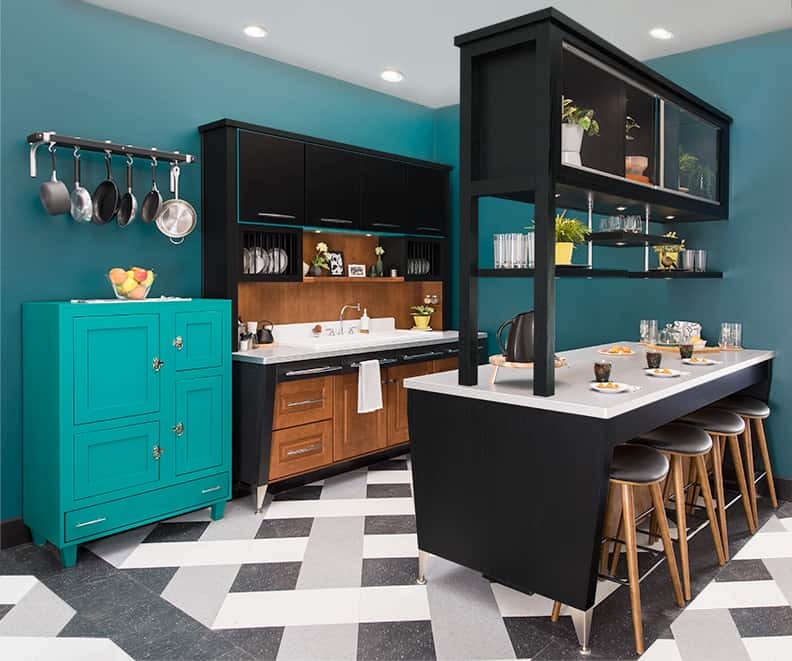 Interior Designer Kate Clarke designed this kitchen and calls it a “pass-through,” where the cook can hand over the dishes through to the dining room. 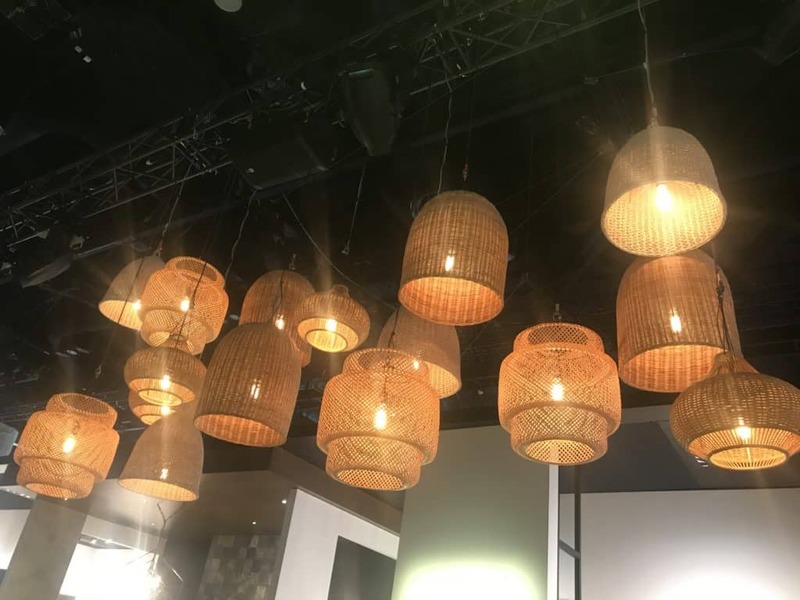 This is a huge design trend in lighting that groups together pendants or light fixtures at various heights and often in various sizes and shapes. 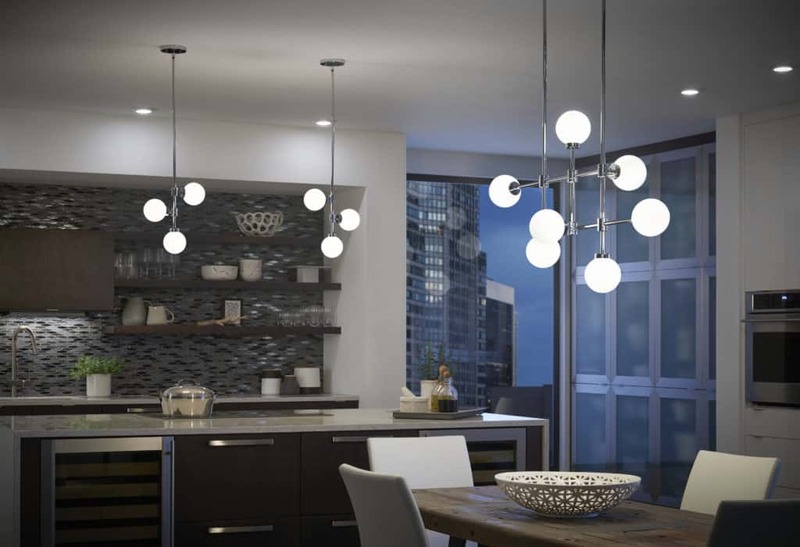 The pendant cluster is an updated alternative to the single light fixture such as the chandelier. Progress Lighting provided all of the light fixtures in The New American Home with several installations as pendant clusters such as the foyer and stairway. 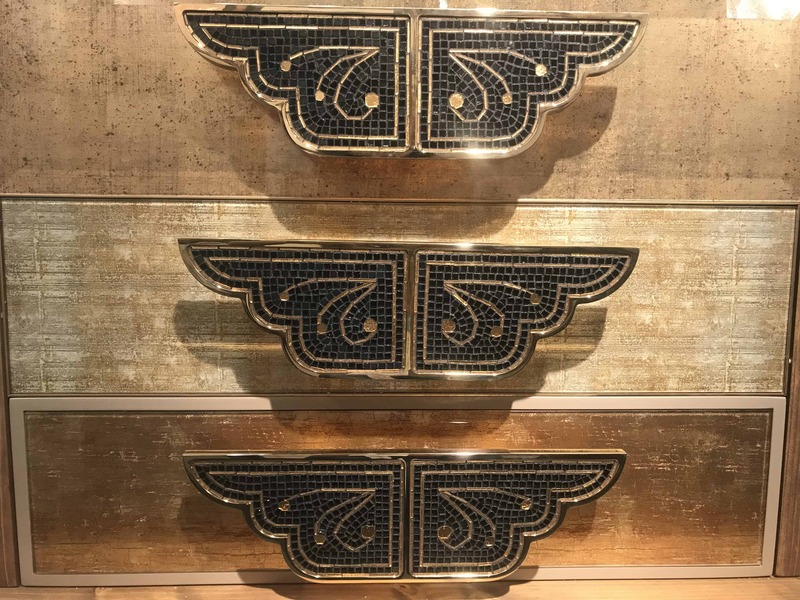 In the foyer, Clarke notes that the pendants are sold individually and purchased nine and attached them to an anchoring plate to create the cluster lights. 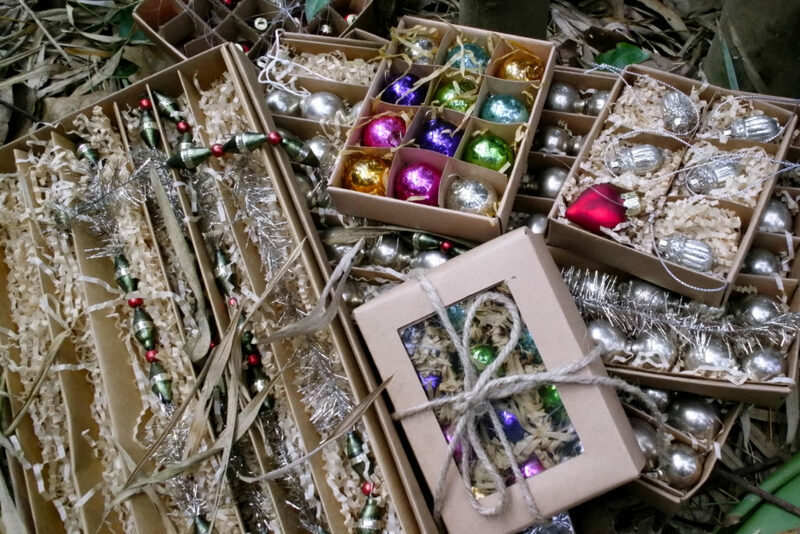 Also worth noting is the popularity of hanging pendants everywhere from the bathroom to the bedside. 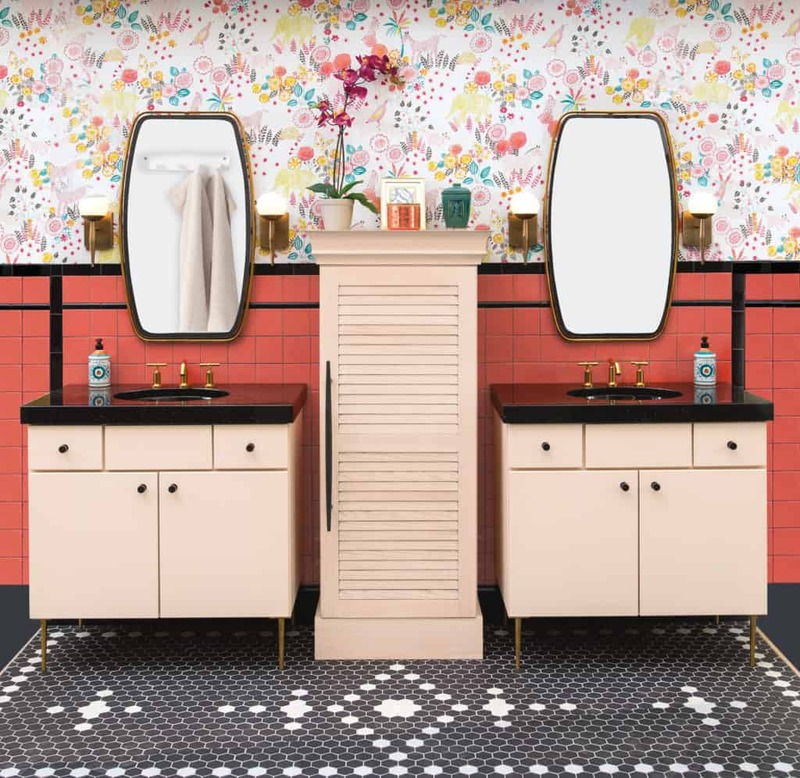 As Clarke notes, “No one likes to see a toilet when they enter a space.” As a design solution, in each bathroom of The New American Home, Clarke designed divider walls to hide the toilet, keeps it separate from the sink, and provide storage and shelving. 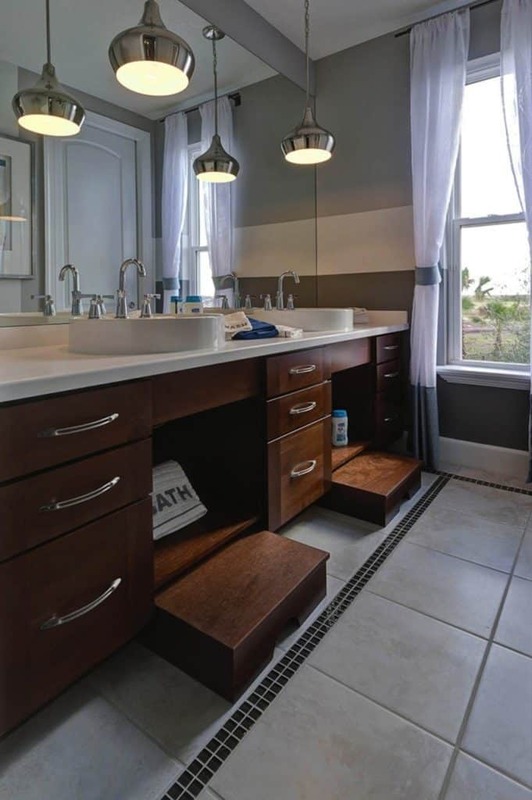 In this powder room, the separation wall provides storage for towels on one side and toiletries on the other side. 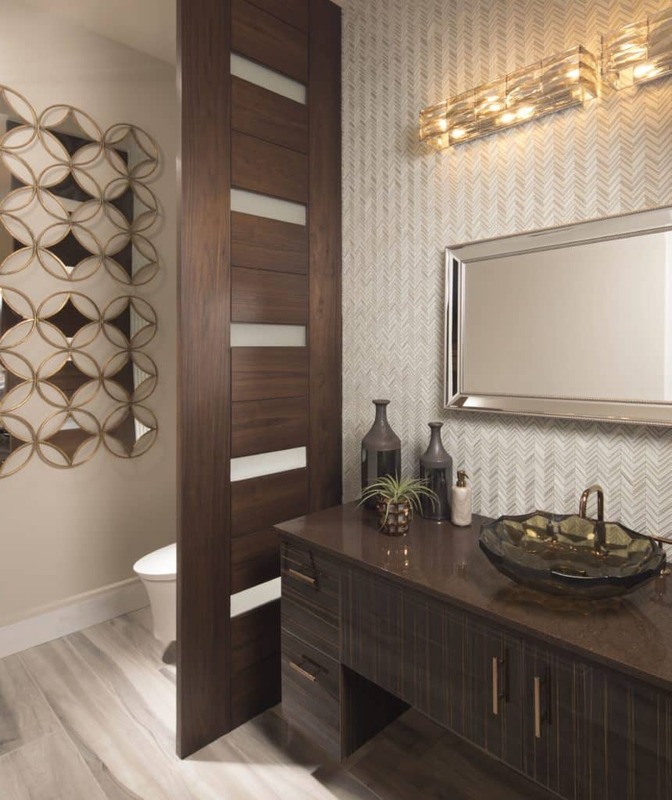 Expect to see a lot more of these feature walls in the powder bath as it gains priority in the overall aesthetics of the home. 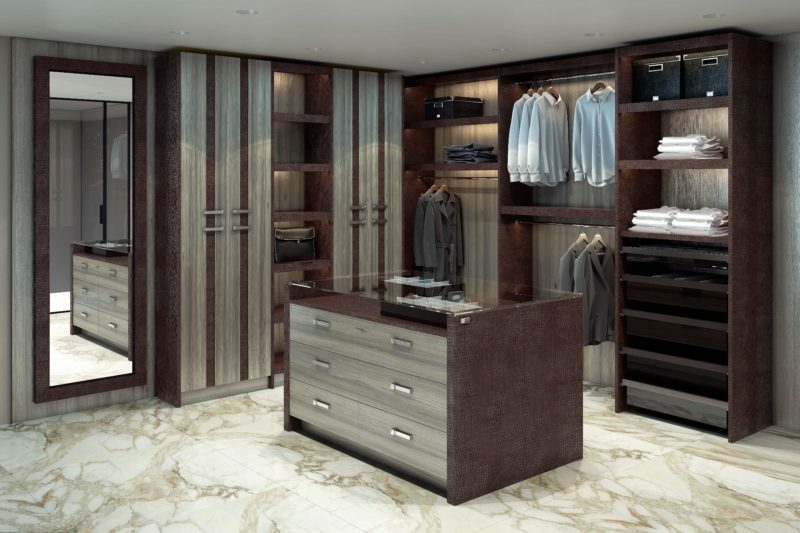 Closet design is evolving to become more flexible acknowledge that people’s storage needs change over a lifetime. 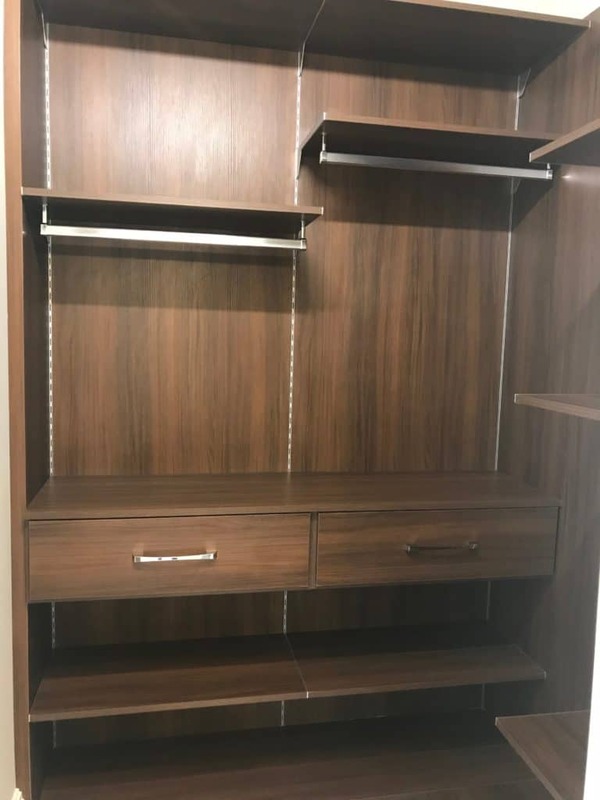 Free hanging closets with adjustable shelving are a great design solution allowing you to switch up the configuration to suit your changing wardrobe needs. In The New American Home, a wine bar resides just off the entry, tucked under the floating, glass panel staircase. 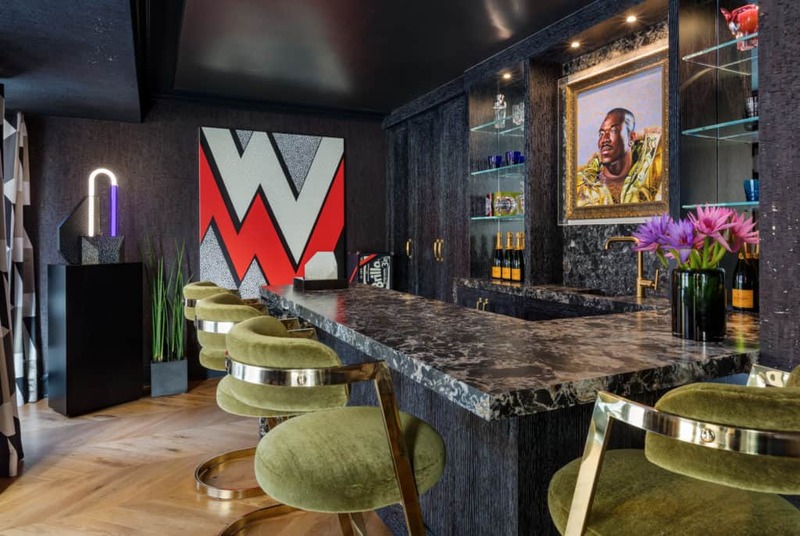 The wine tasting space is outfitted with a tasting table, Thermador wine refrigerators and refrigerator and freezer drawers. 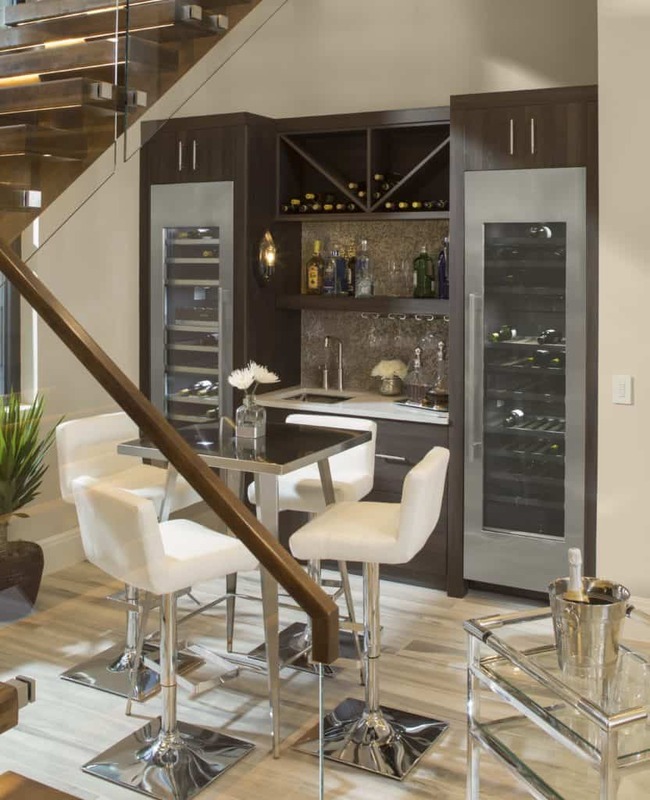 This creative use of space takes the wine room out of hiding in the basement or bar area puts it in the main living area of the home as a design element. Architect and industrial designer Massimo Buster Minale calls himself the Black Sheep of the Design World creating products from lighting to custom motorcycles that blend knurled detailing with rock star chic. 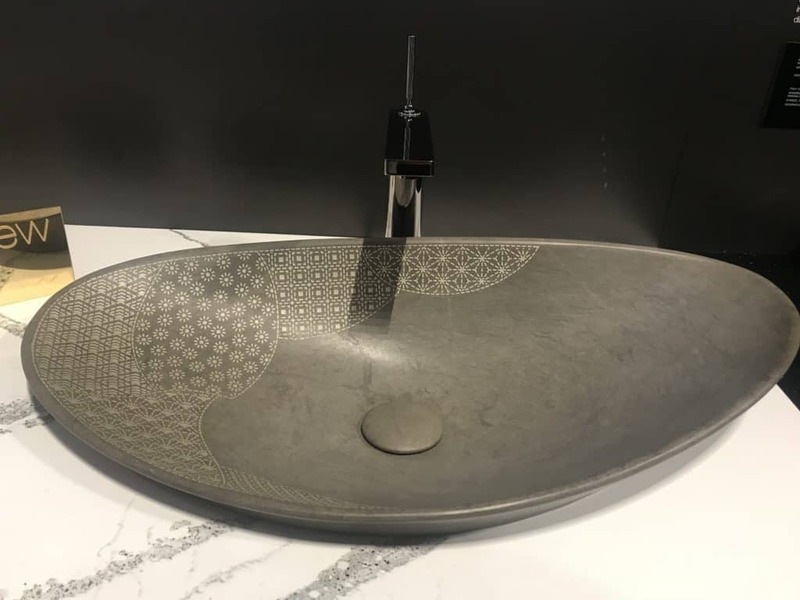 Since then, I credit Massimo’s precision cut metal work, inspired by the knurled detailing of his custom-made motorcycle handles, with popularizing the design trend of knurled detailing evident in kitchen and bath fittings, fixtures, furniture and home decor accessories. 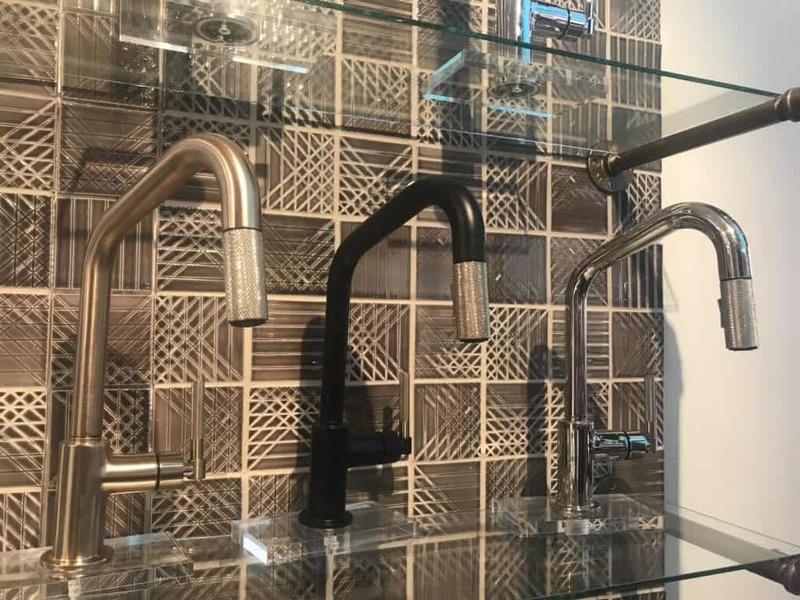 “We have become famed for our diamond-cut knurling technique, which we first used on motorbike handlebars and footpegs back in the day. 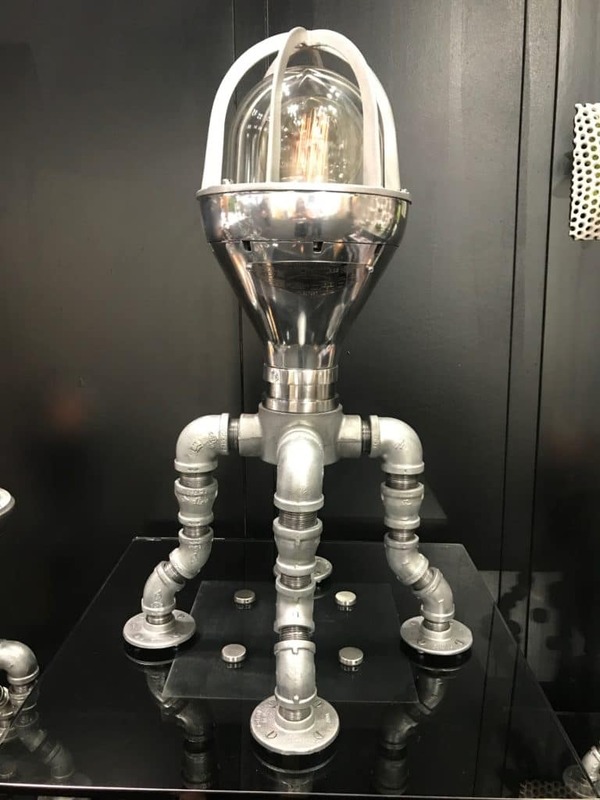 The reason why we use this across our interior product ranges is for two reasons – firstly it shows that we use solid metal in all our products (you can only successfully knurl solid metal) and secondly it captures our DNA – so no matter how ‘ordinary’ a light pendant or cabinet pull might seem, ours have a special story and feel that is hard to put your finger on,” says Minale. 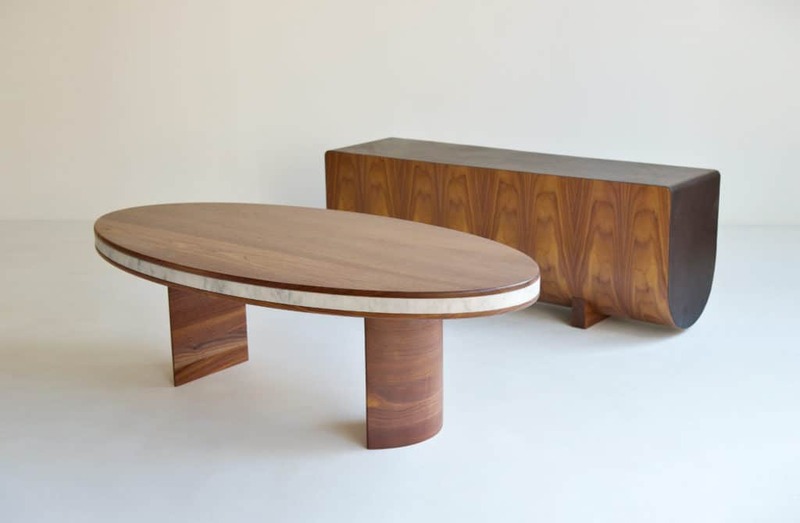 Minale began his creative career as an architect working in for a large firm before starting his own firm, Minale + Mann. 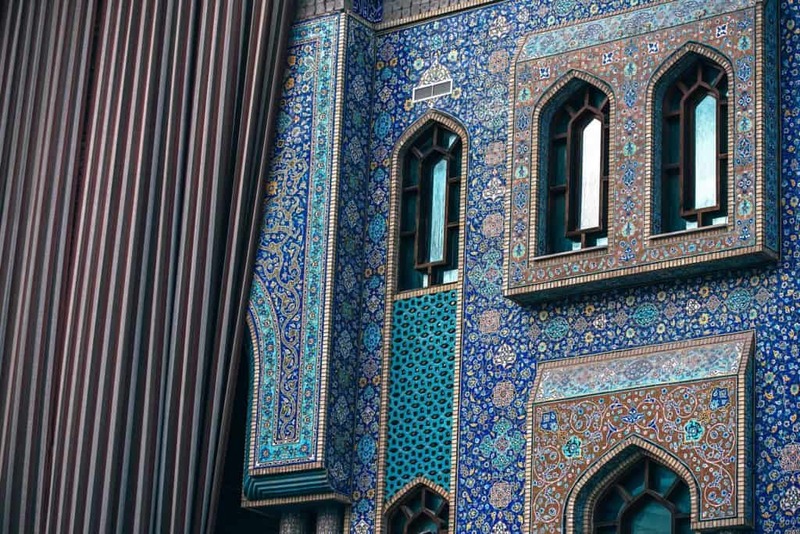 “My first love has always been architecture. 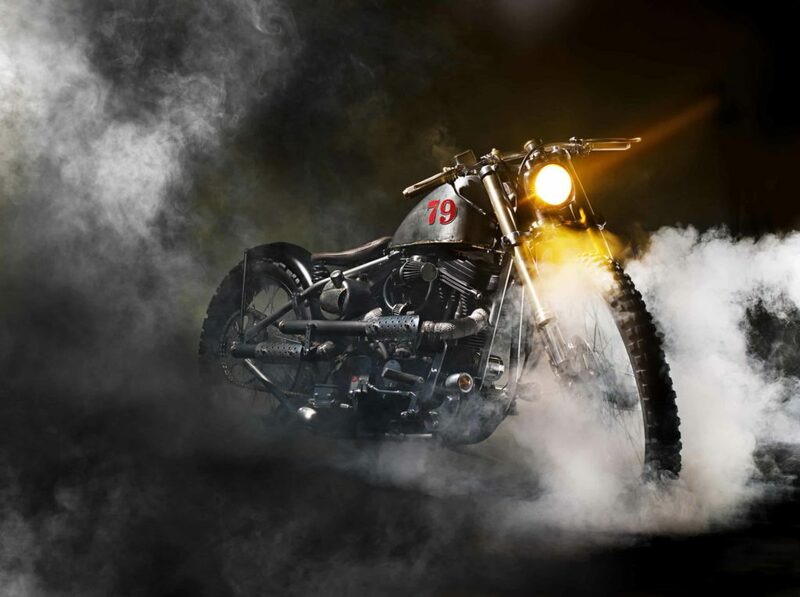 During the day, I worked for some of the largest architecture firms in London and at night found the time to build custom motorbikes. 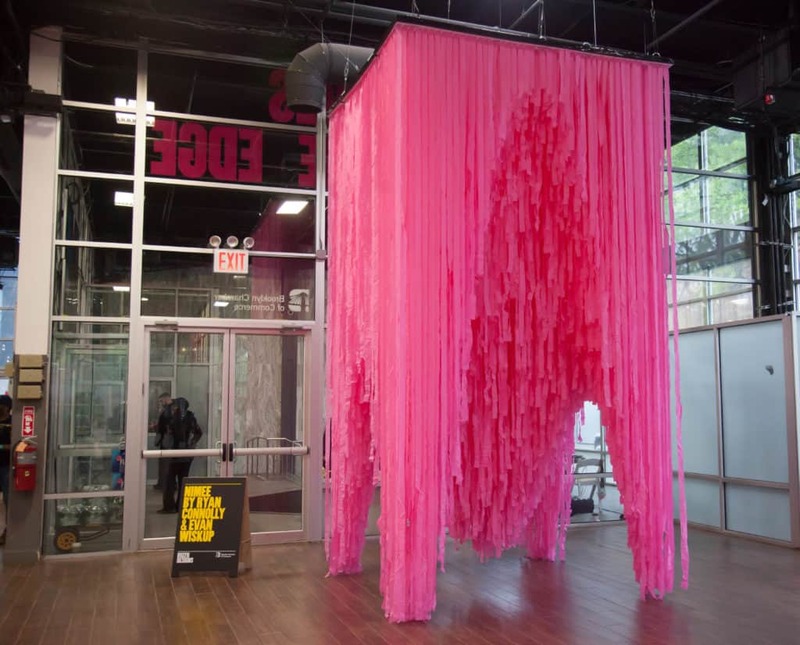 I became increasingly frustrated with architecture because it is a very slow profession. 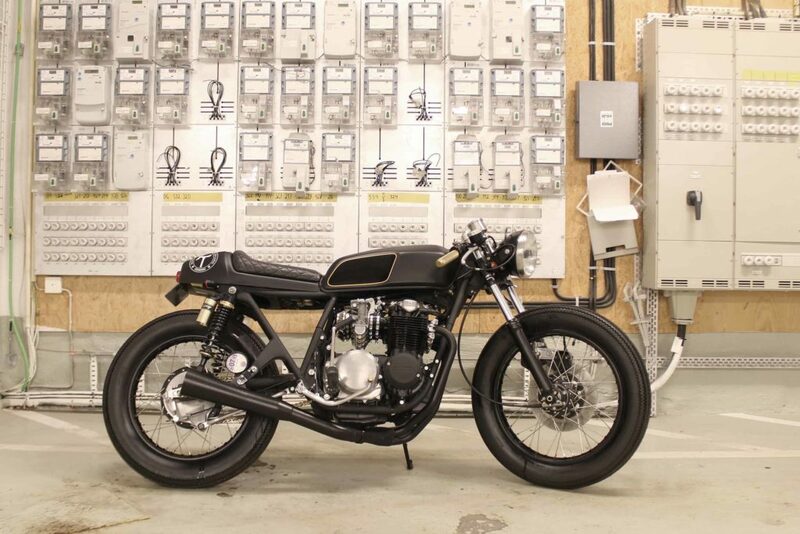 As an antidote, I threw myself into my bikes, both riding and building,” Massimo says. 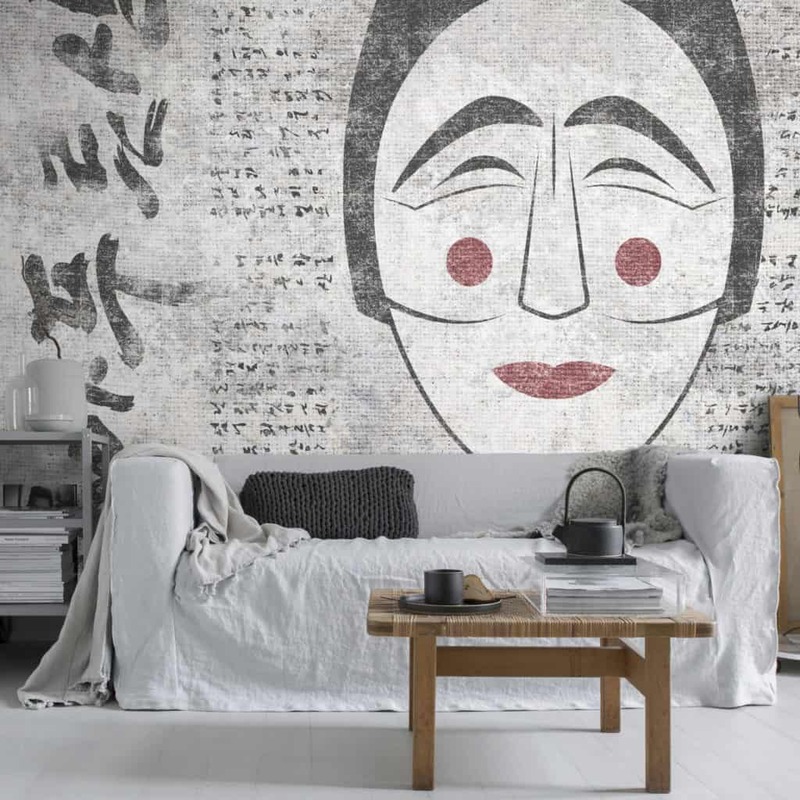 Minale’s irreverent approach to design comes from the gut, an outlier attitude that bucks trends and takes risks. 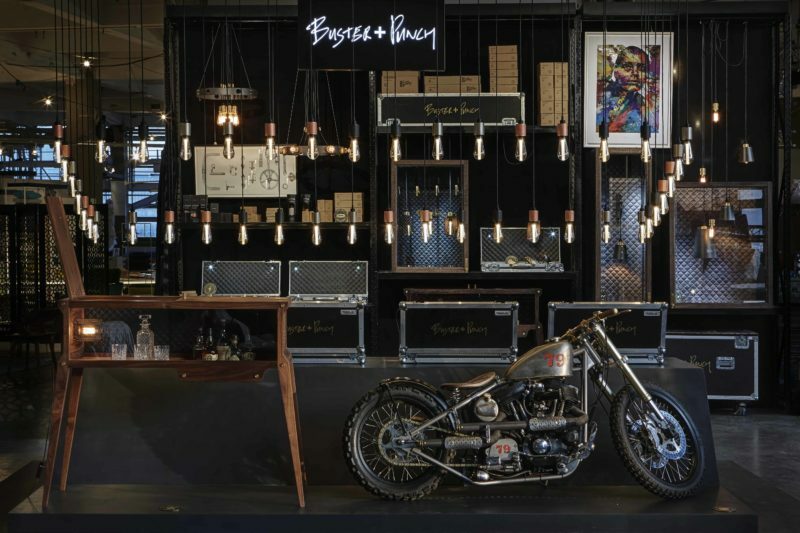 His work defies conventions in the interior products industry drawing from a creative symbiosis between custom bikes and home decor. For a cinematic look inside the design mind of Buster + Punch, check out this new short film, Switch Up, starring supermodel Cajsa Wessenberg with music by British Rapper Ms Banks, playing the role of Buster and Punch’s as Artificial Intelligence. 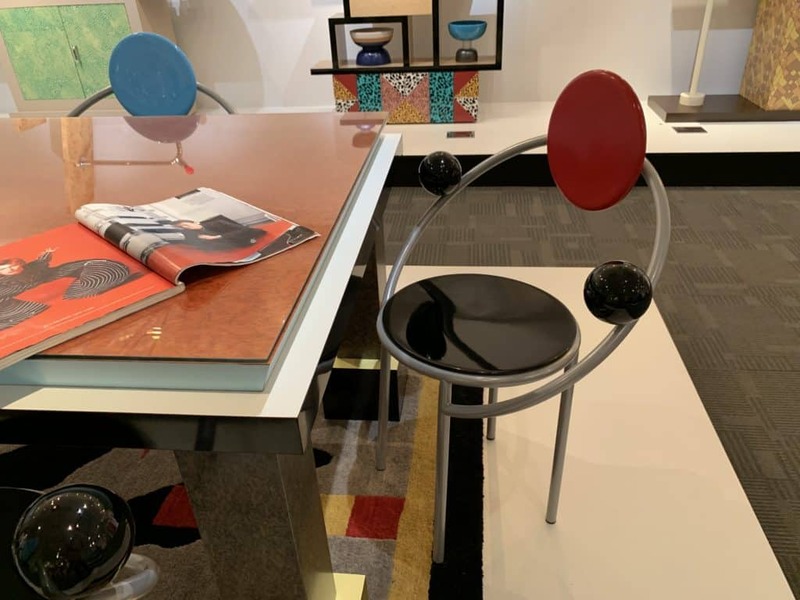 Expect these three design stories to continue evolving as we create spaces that reflect our personalities and promote healthier lifestyles. 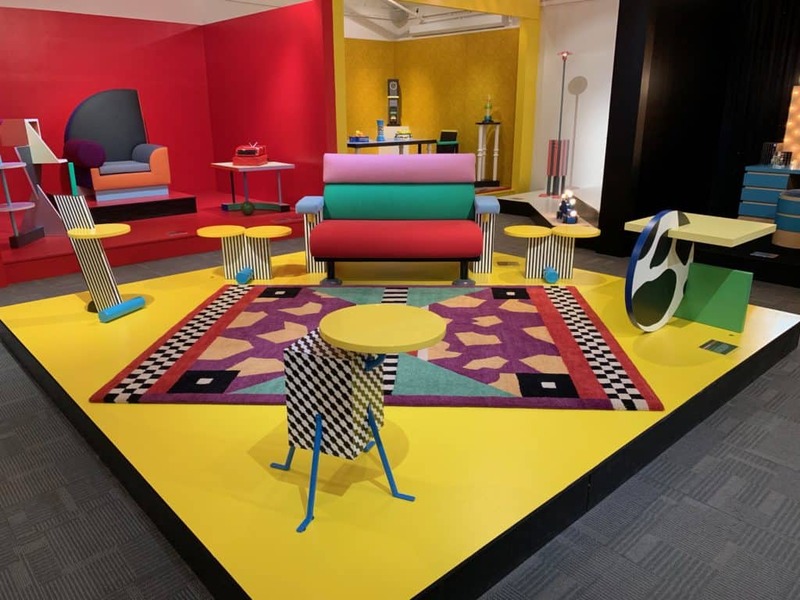 For more on what’s new and next in design, subscribe to The Design Tourist Channel and sign up for the blog email. 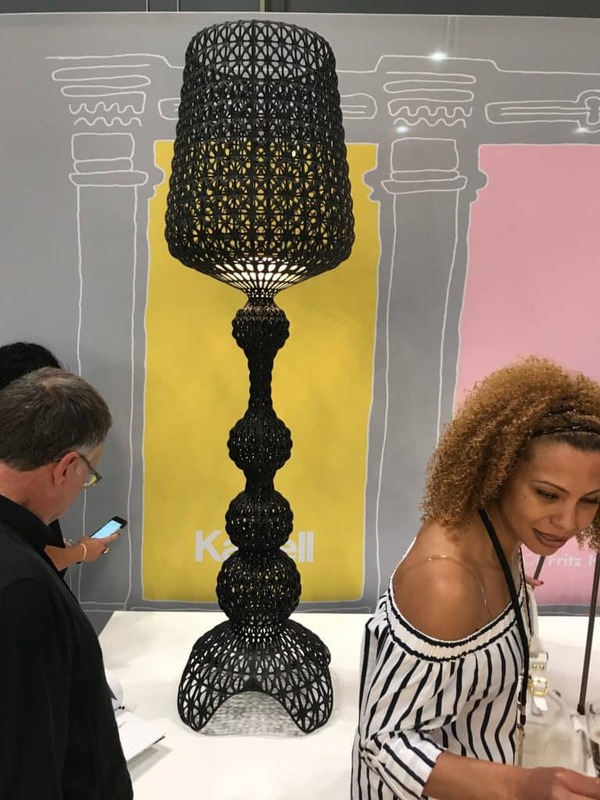 For the latest looks in lighting, I recently spoke with Lighting Trends Expert, Jeffrey R Dross, Kichler Corporate Director, Education and Industry Trends. 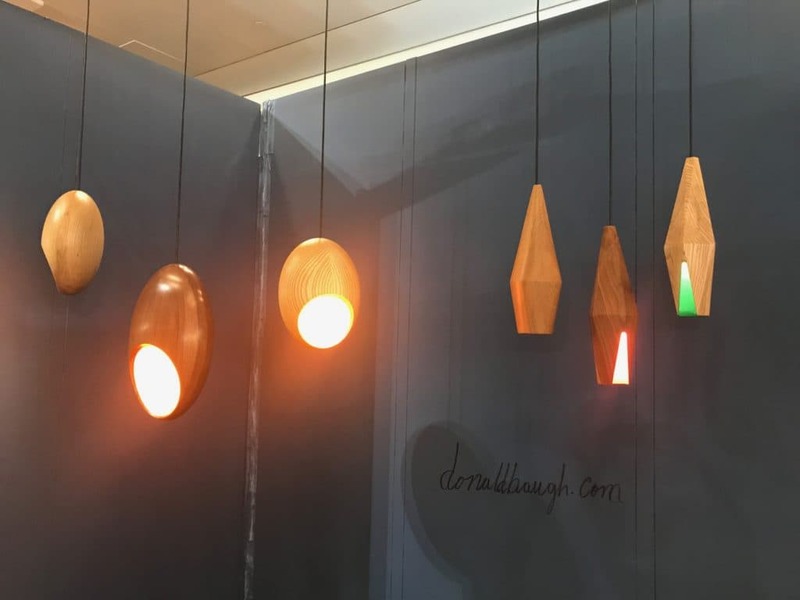 Here is his take on light styles in 2018 and beyond. 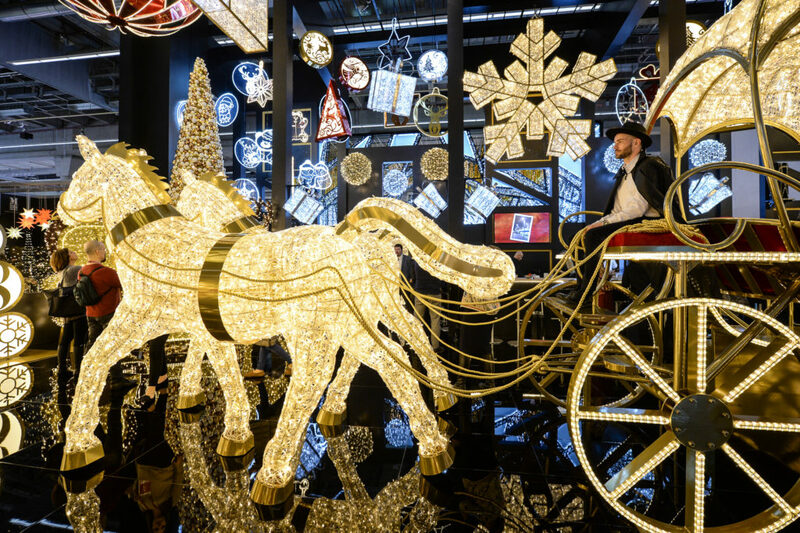 What are the latest lighting styles/designs/materials resonating with consumers in the home? 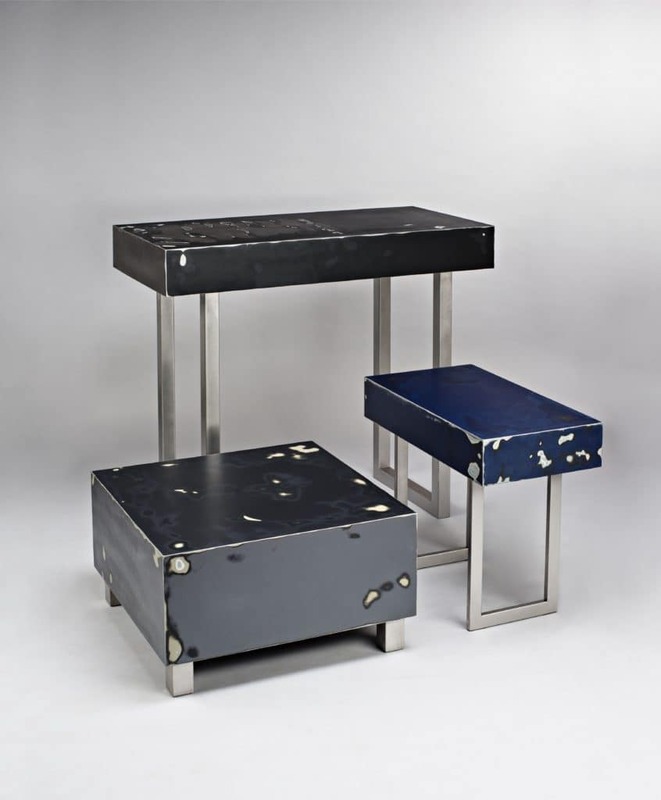 Running parallel to Vintage Industrial in our “red-state / blue-state” world is Contemporary. 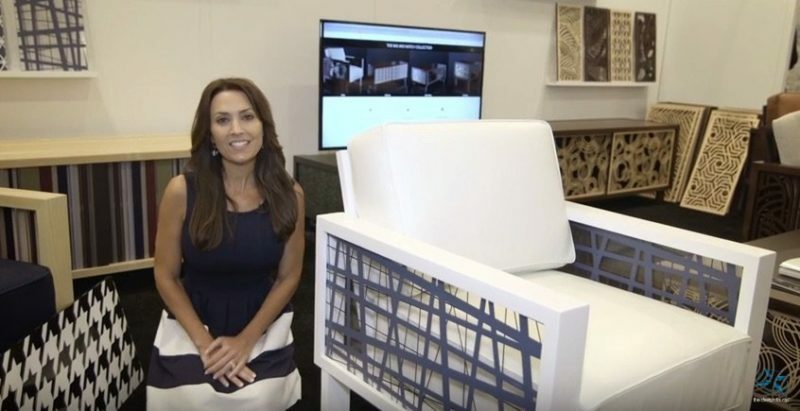 More and more consumers, typically younger Millennials or Baby Boomers setting up a new home are seeking out this alternative. 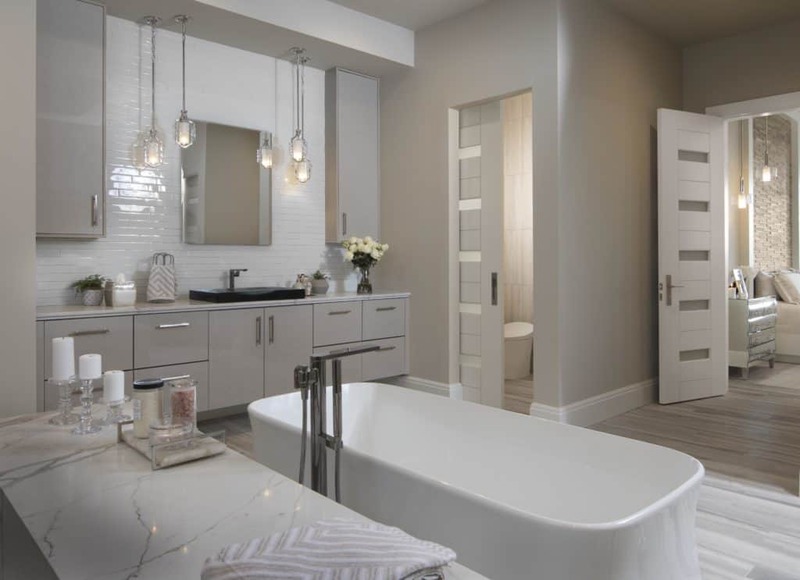 Chrome, Polished Nickel and White finishes are king here. Designs are simpler and the look is crisp and new. 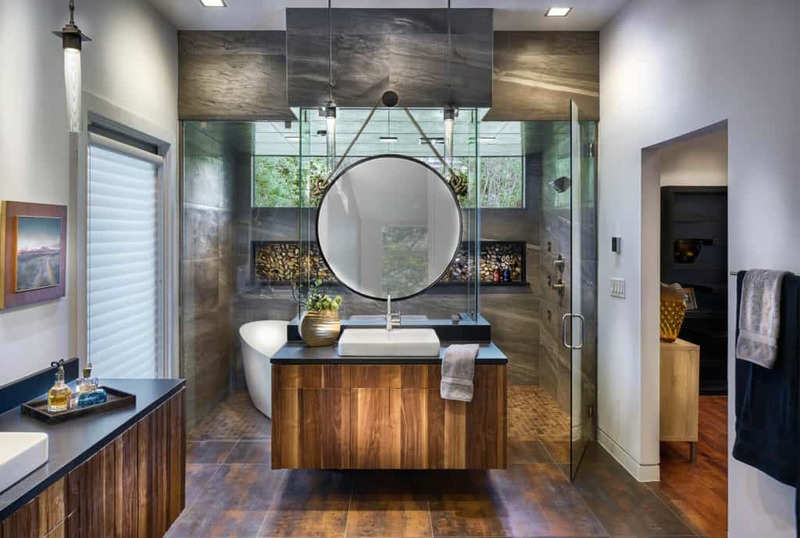 In the bathroom, clear glass still dominates, but there is some desire to shift from the preponderance of Chrome. 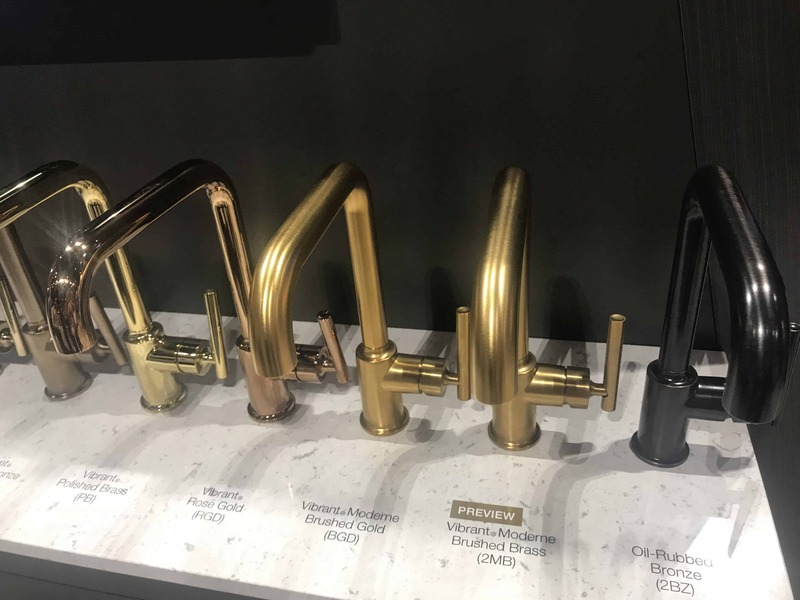 Black is emerging as a strong alternative, Natural Brass is showing signs of adoption and the addition of wood (real or faux) has become immediately popular. 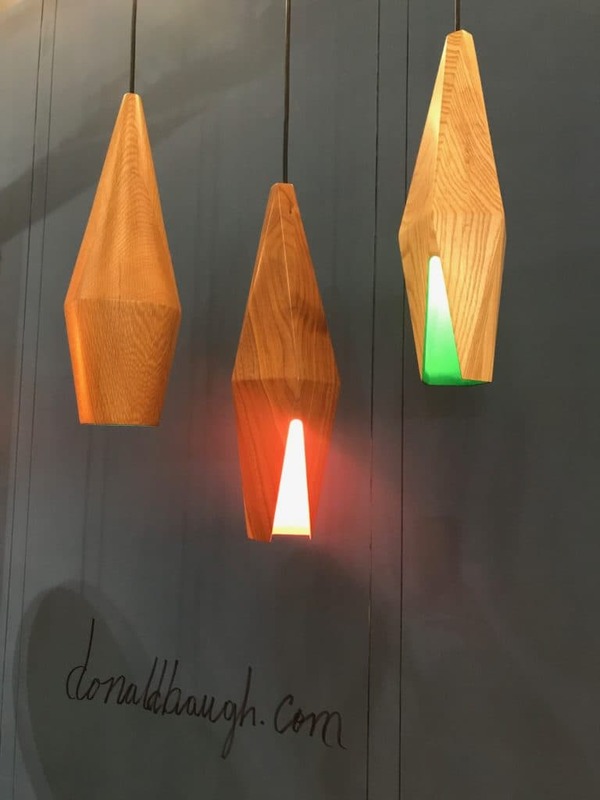 What are the latest lighting techniques gaining traction in interior design? 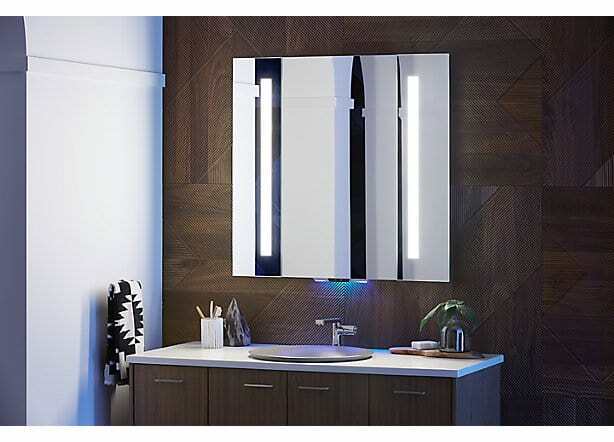 Expect to see more and more lighting effects in the home of the future. Light will be used, but you may not always see the source of the light. 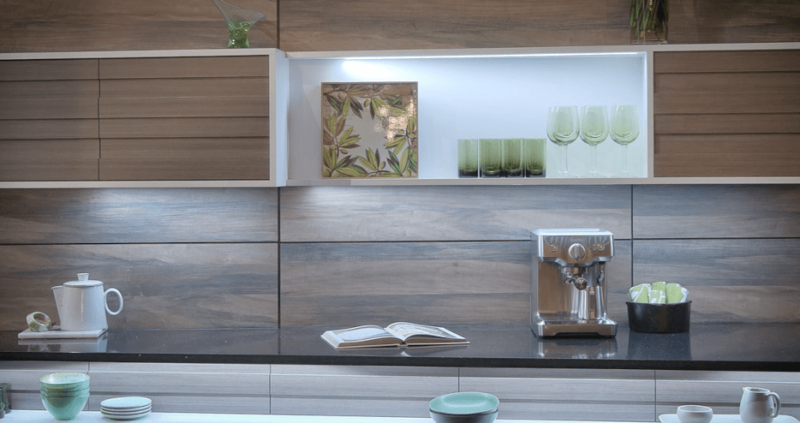 Lighting over cabinets, under toe kicks, under counters and behind room objects will deliver comfortable indirect light from an invisible source. 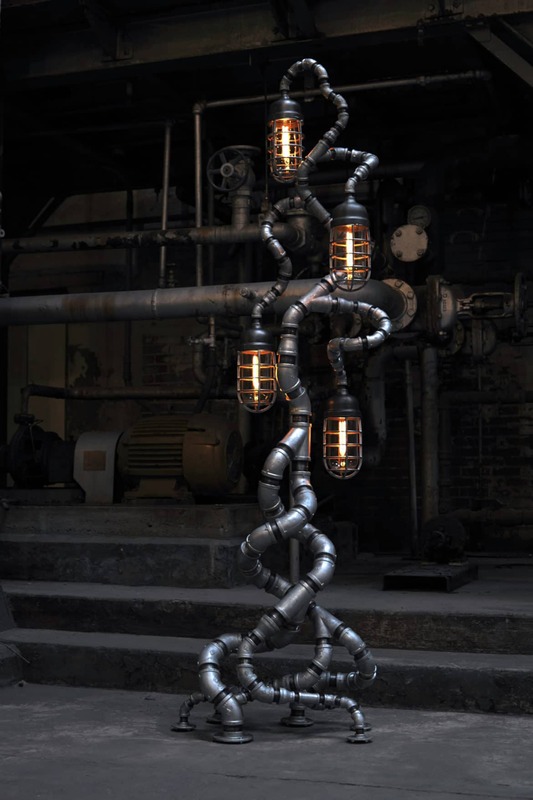 The decorative lighting used will also serve as an aesthetic element in the space. 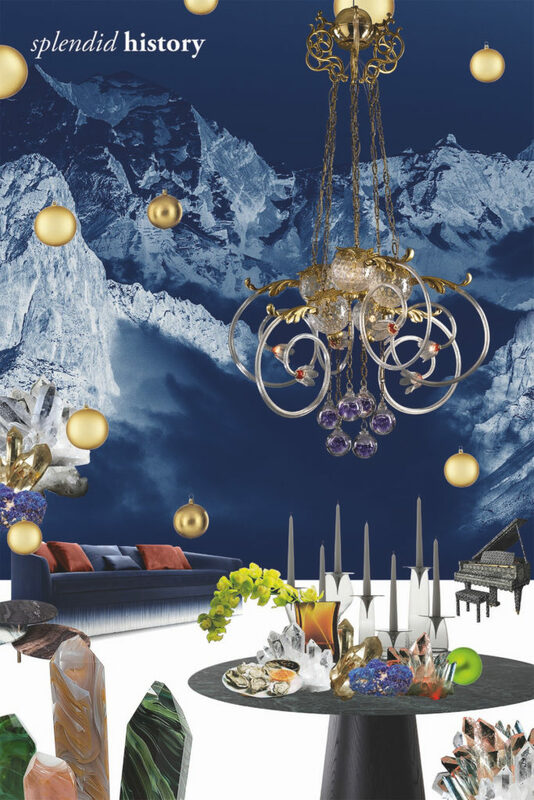 Chandeliers, pendants and ceiling lighting will be more curated, less utilitarian. 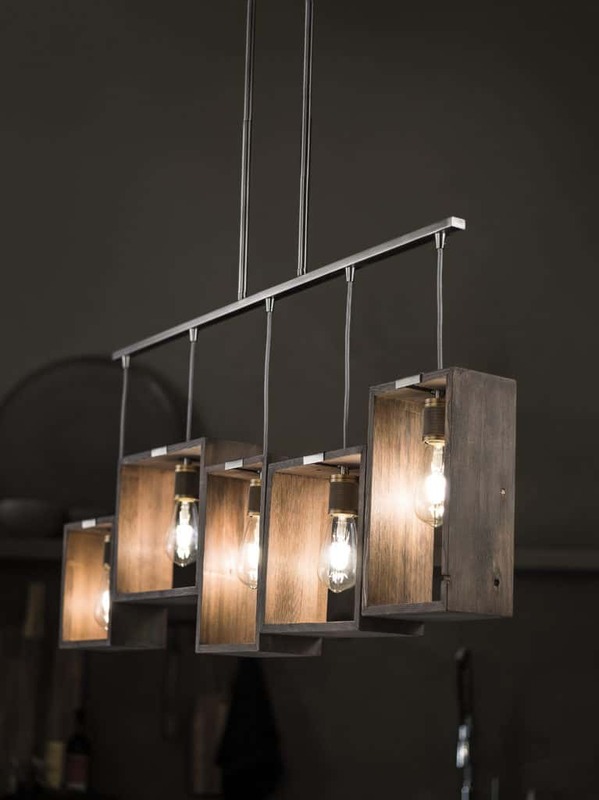 This will then become an opportunity to feature some magnificent lighting fixtures that magnify the design of the space. 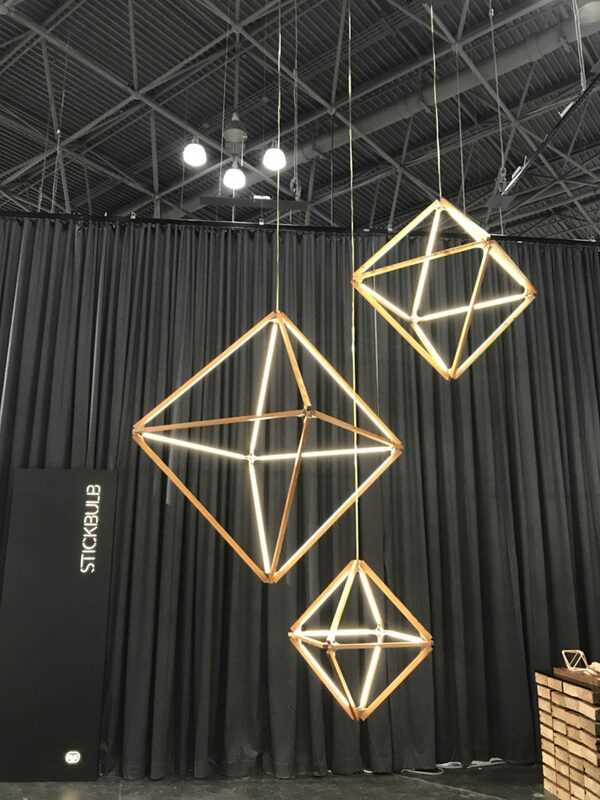 Pendant Cluster by Progress Lighting in the foyer of The 2018 New American Home. Any unique, fresh ideas for lighting installation and configuration? We are now in an era where outdoor lighting is coming indoors and indoor lighting is shifting locations, up to and including the exterior. Any preconceived notion of propriety has been set aside and the new norm is no norm at all! 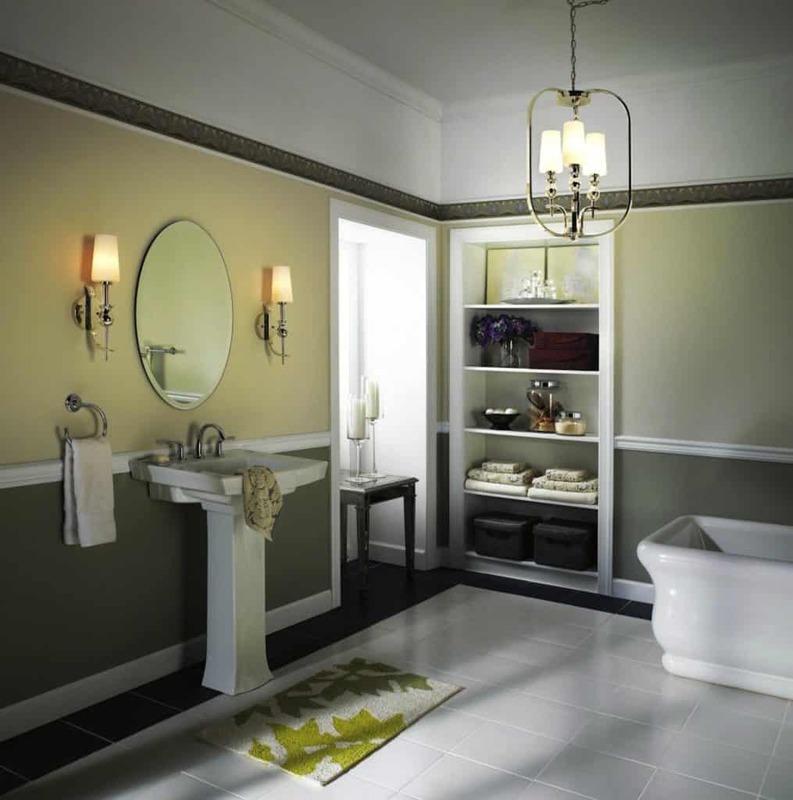 Bath sconces are being replaced with mini-pendants. 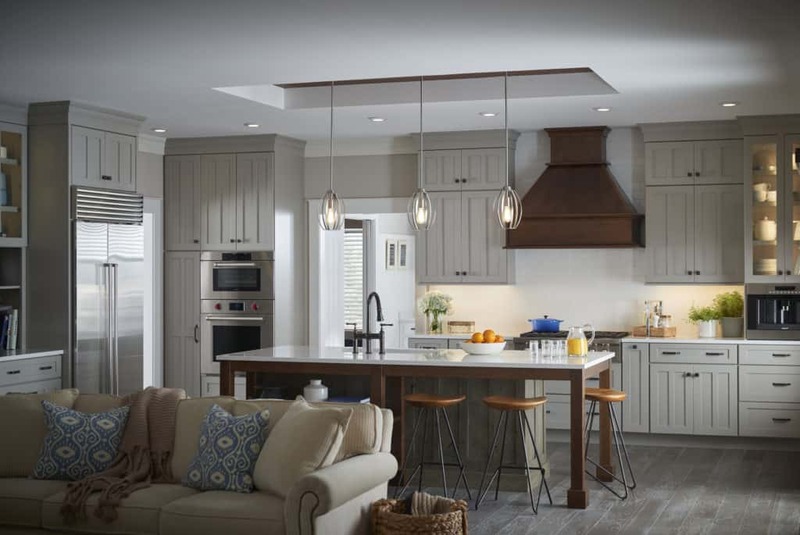 Mini-pendants in the kitchen have grown in height and width to better blend with the tall ceilings and expanded square footage of the room. 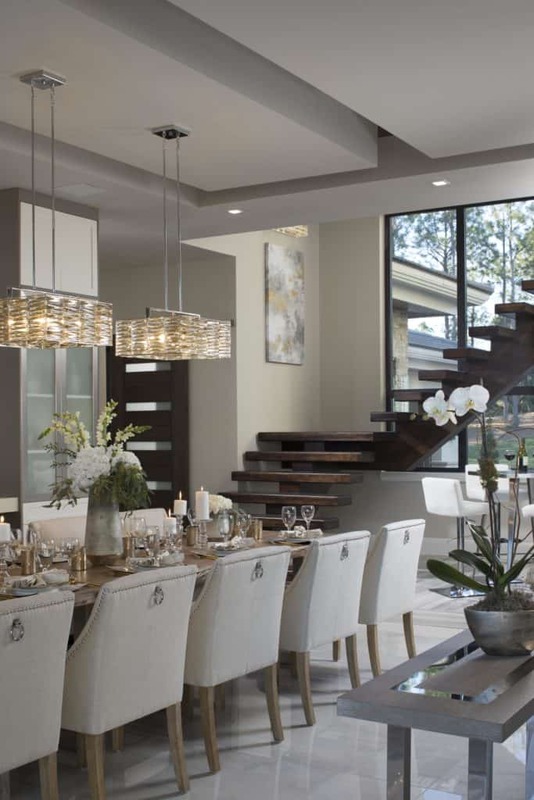 The dining room chandelier has shifted to an over-scale pendant and if that is not enough, two chandeliers and two or three pendants are the alternatives. 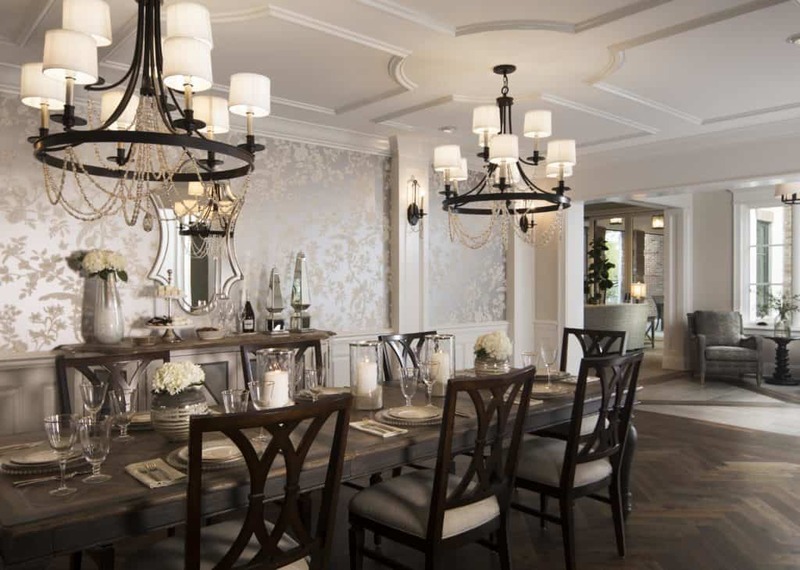 Chandeliers in the dining room of the 2018 Remodeled Home built by Farina & Sons. 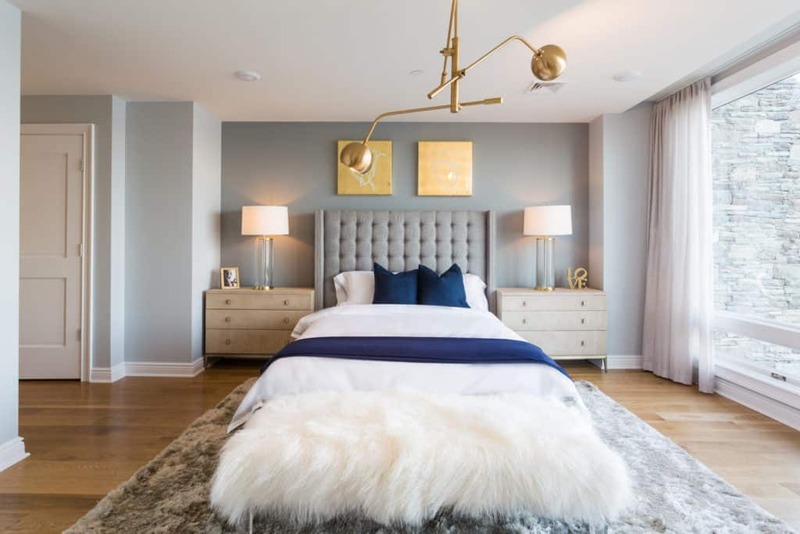 Rather than bed lamps in a bedroom, pendants are used at each side of the bed, or why not mini-chandeliers! 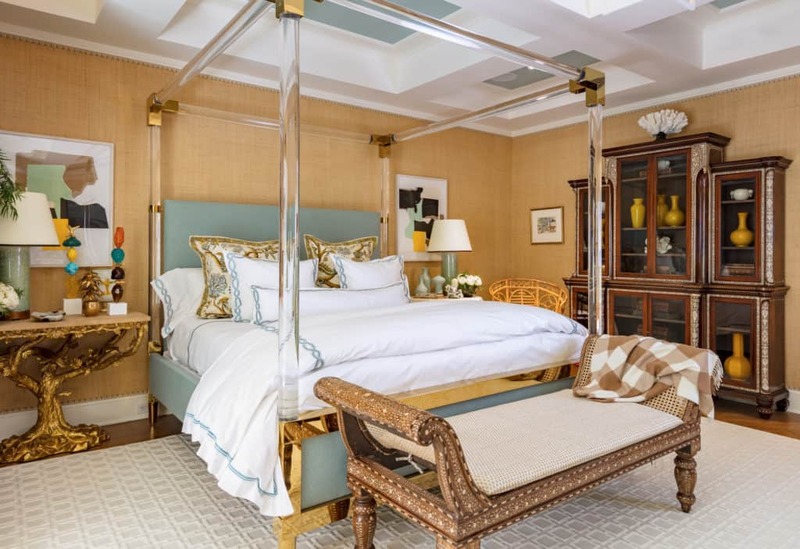 Chandeliers have found their way into the bedroom and Master Bath suite and even outside! 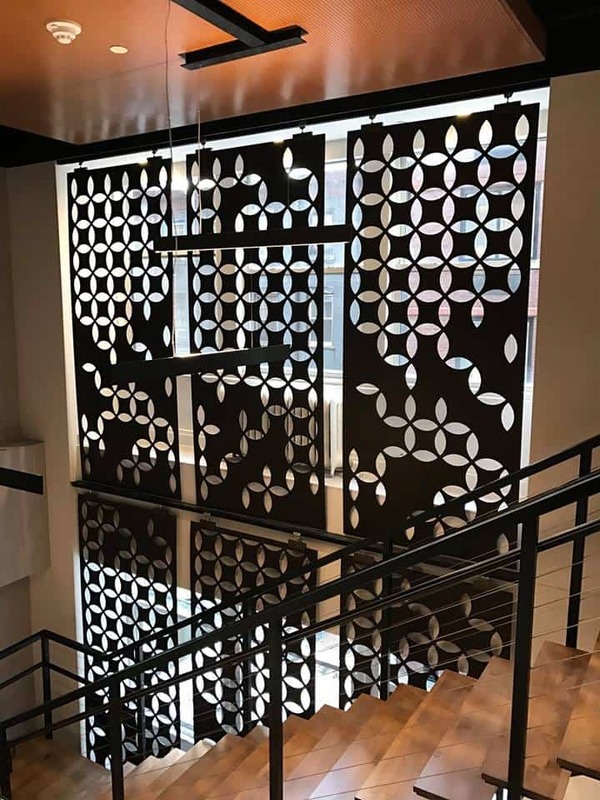 The disappearance of multi-story foyers means exaggerated semi-flush lighting is used, or a chandelier hung with no chain or stems nicely fills this space. 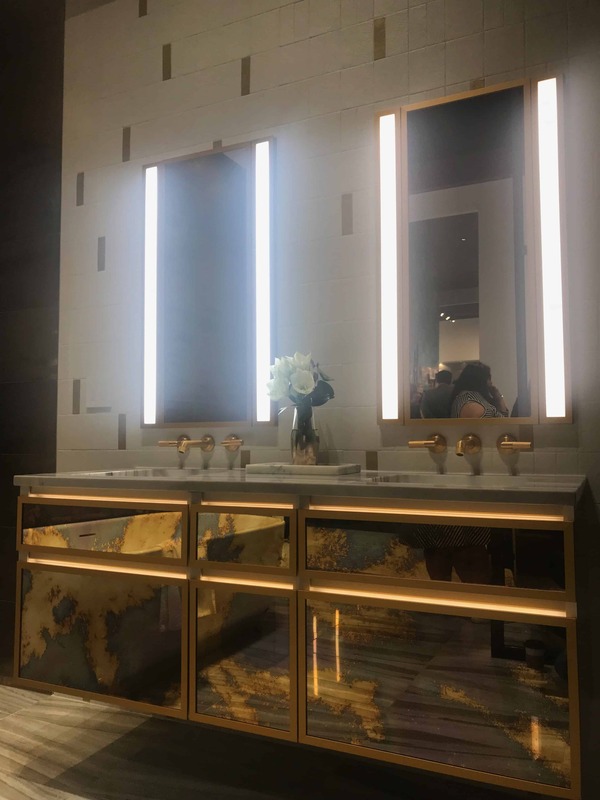 Finally, aesthetic excess is now on display in Powder Rooms. 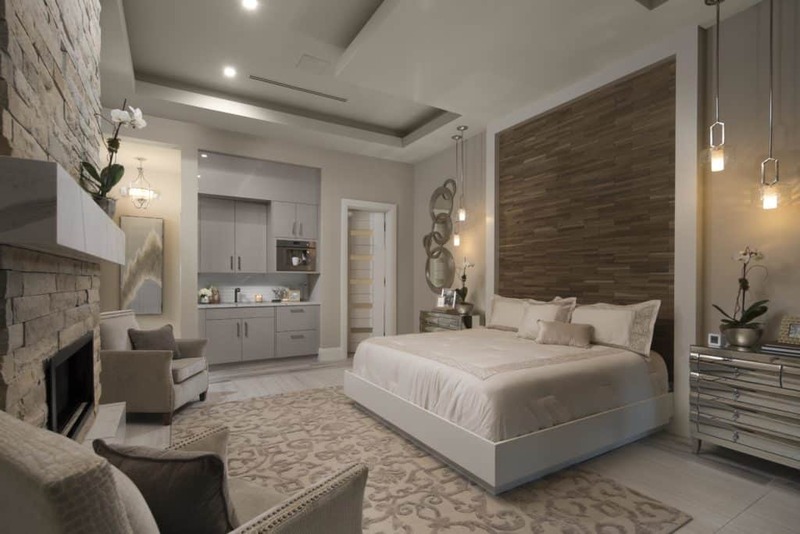 Their small size allows for the use of extravagant products that will wow family and friends, the primary users of these rooms. 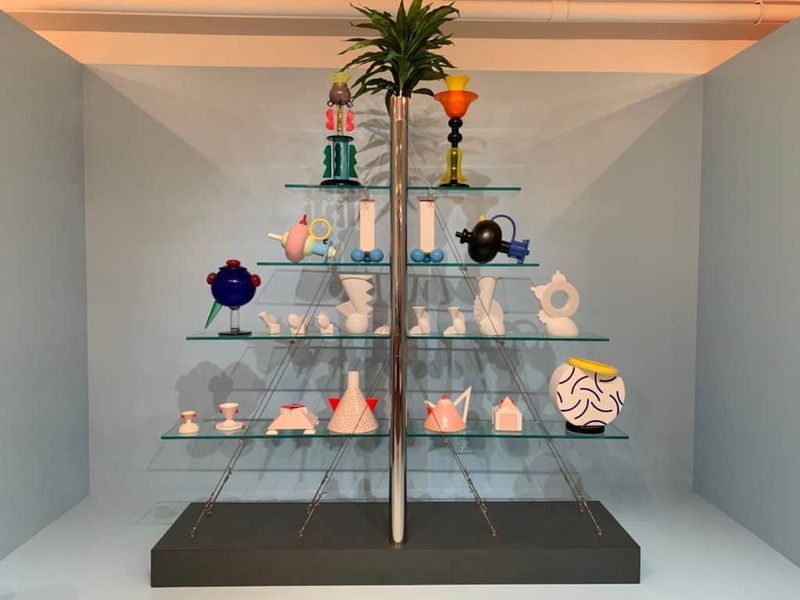 Once these unconventional pieces have found their way into an unfamiliar place, additional creativity can be employed in placement. We are in the midst of a topsy-turvy time for lighting employment! 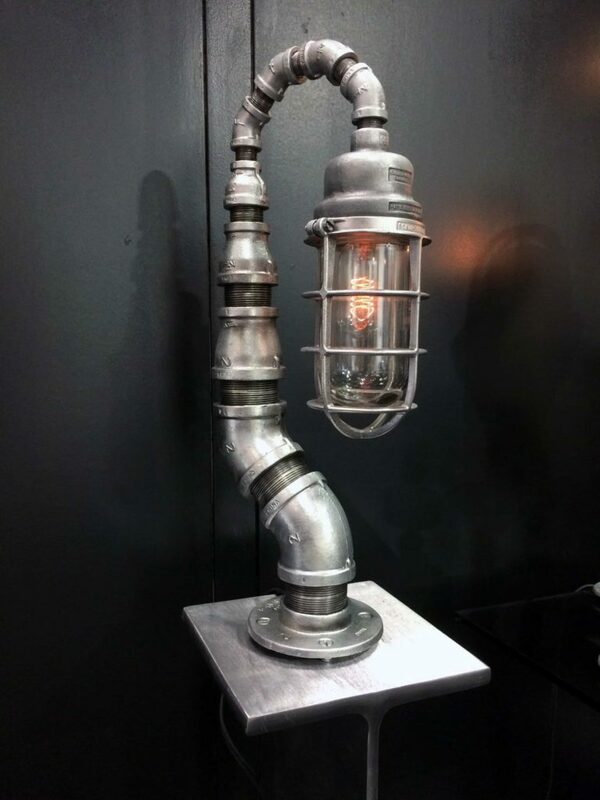 Any thoughts that you would like to share about emerging trends in lighting? 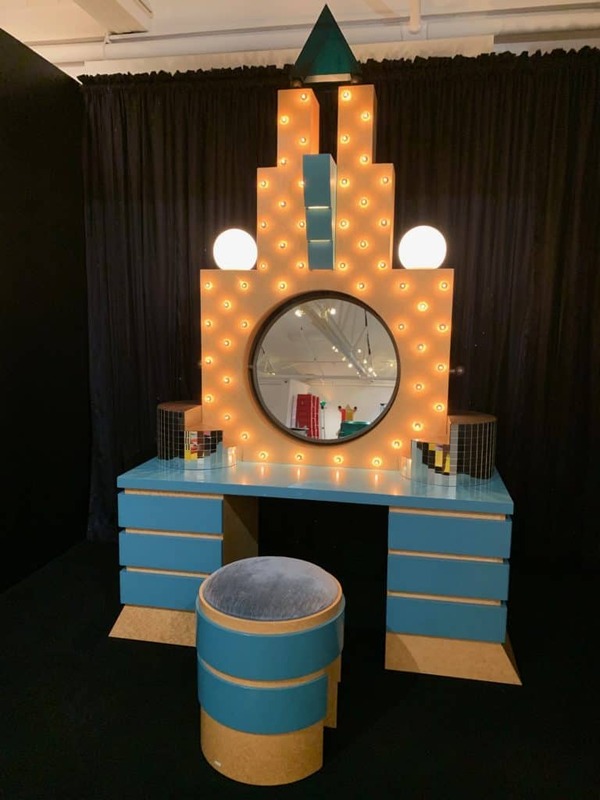 For the near future, I would keep my eye on Art Deco styling. 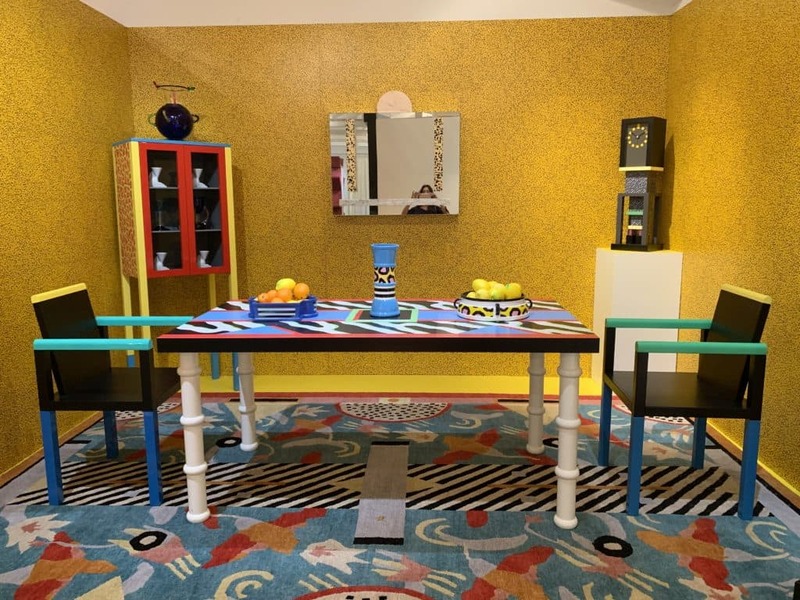 While this may never be totally mainstream, it will have a sizable impact for a handful of years; much like the Mid-Century trend we now see winding-down. 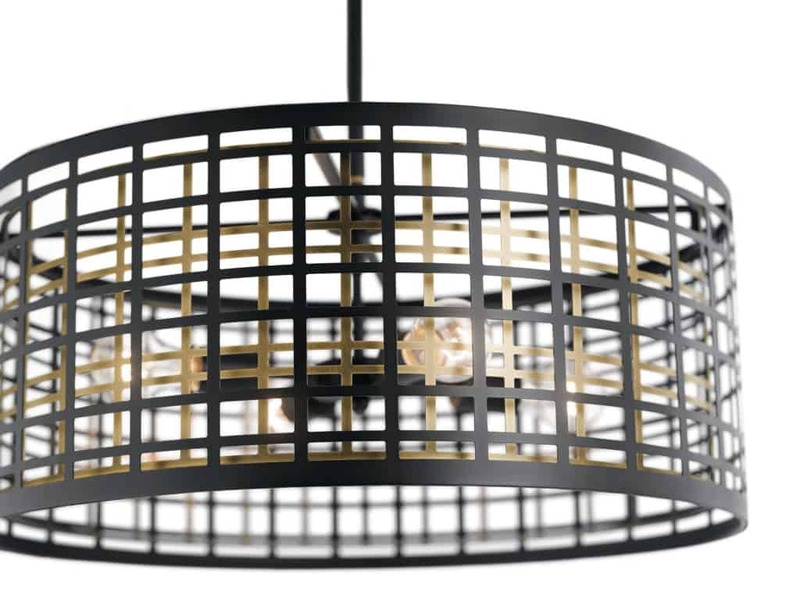 In addition, the Matte Black finish is perhaps the hottest color in lighting right now. 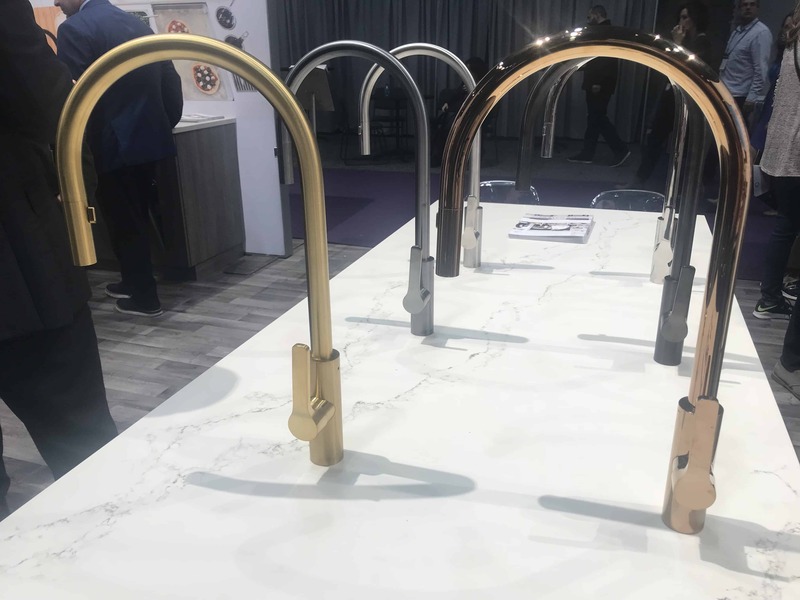 As Oil Rubbed Bronze declines in importance, this, along with the already popular Natural Brass (a lighter, brushed version of brass) will begin to dominate. 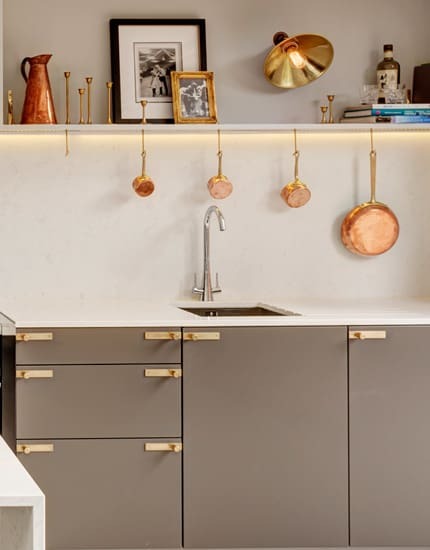 In that same vein, expect the return of Polished Brass, albeit in a denser, deeper coloration then we used for Williamsburg-style lighting twenty-five years ago. Unrelated to aesthetics is the growing understanding of how our bodies respond and react to lighting. Science is quickly gaining knowledge about this interaction. 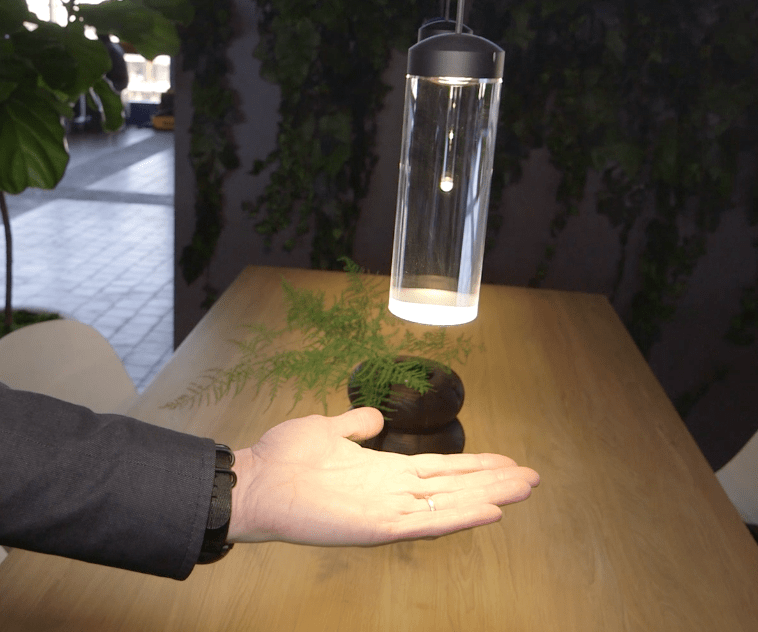 Expect to hear more about what our bodies need and how good lighting can help us lead healthier lives. Commensurate products are certain to right behind. 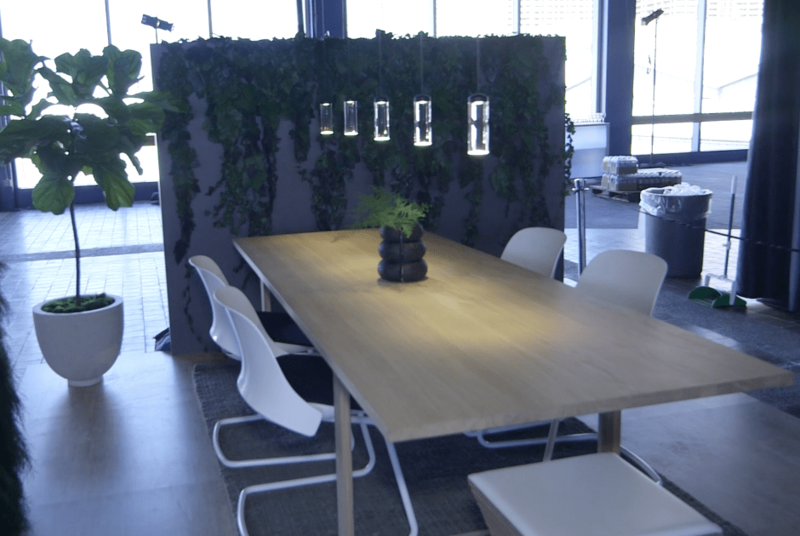 Any other thoughts that you would like to share about lighting for today’s lifestyle? 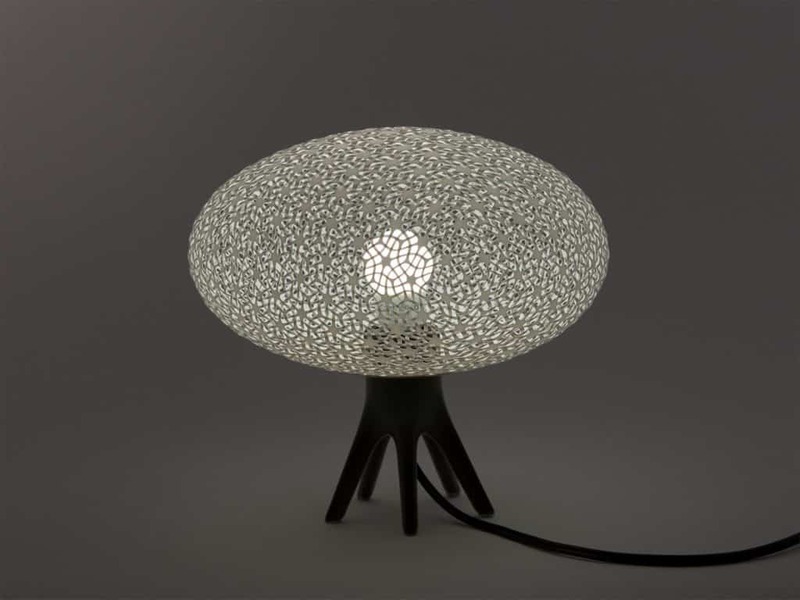 In the past, most homes and rooms were simply lit with a single luminaire in the center of the room. It was light, but not very good light. 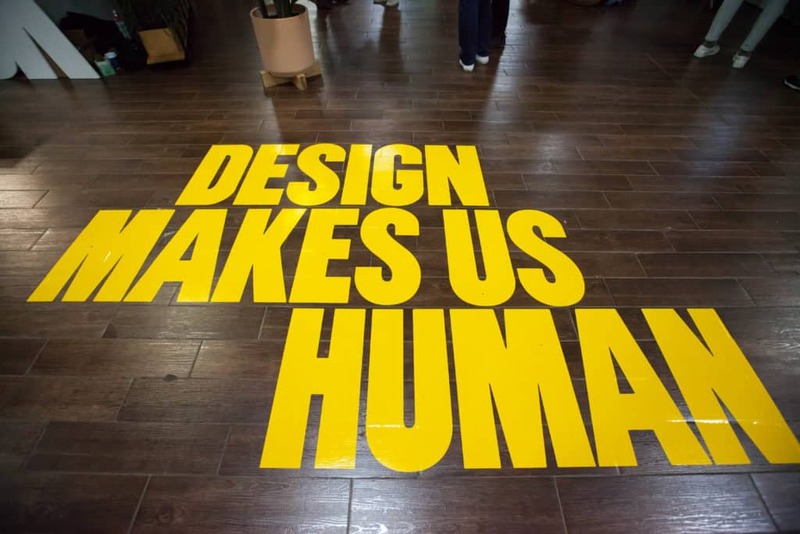 Our understanding of what we need has matured and our expectation of design has never been higher. 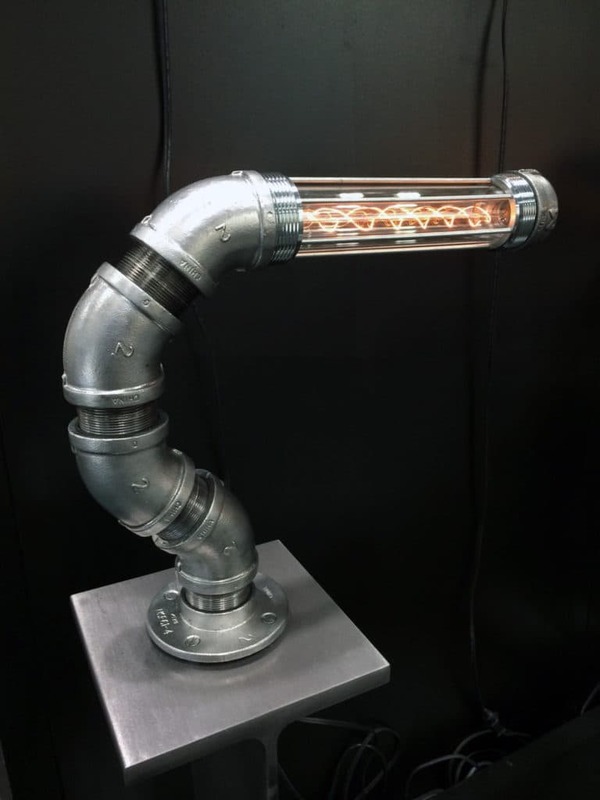 One lighting product does not complete the task. 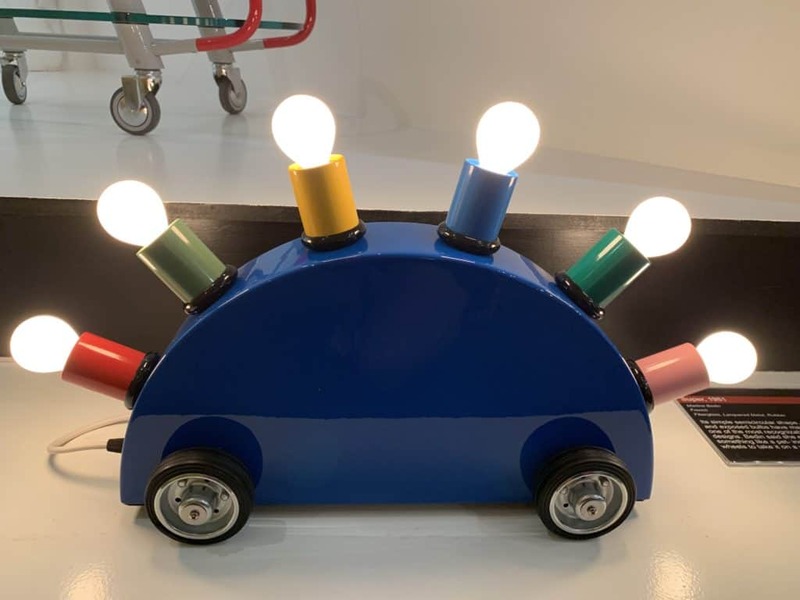 A good lighting solution addresses the “Task” needs of the space, includes overall general or “Ambient” light, then add “Accent” or decorative lighting to add sparkle. 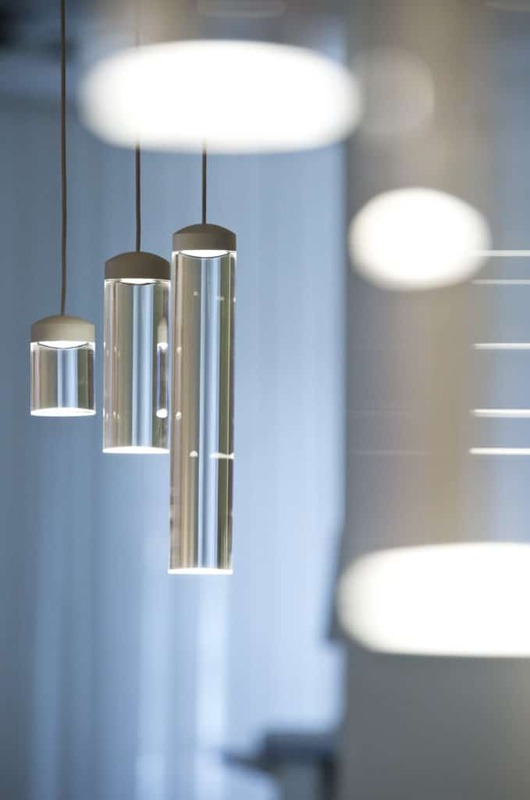 The concept of Light Layering will ultimately drive lighting design to new heights. 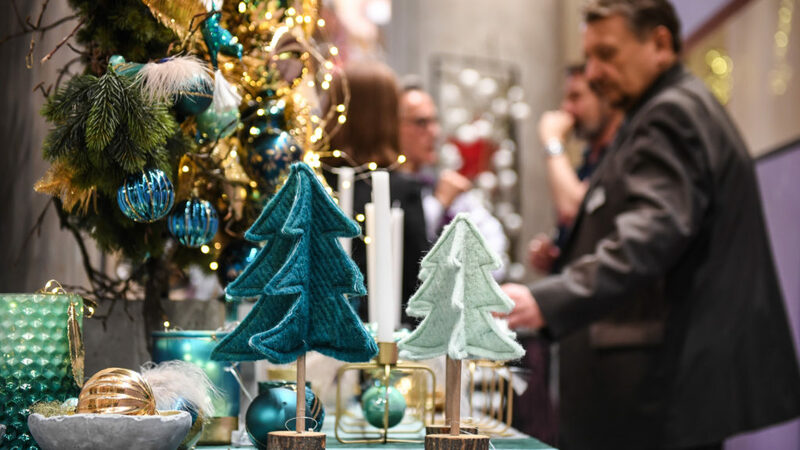 The most talked about lifestyle trend of 2017, Hygge is a way of being and decorating comes from the Danes and is firmly anchored in their culture. Hygge ( pronounced “hoo’gah” —who knew?) 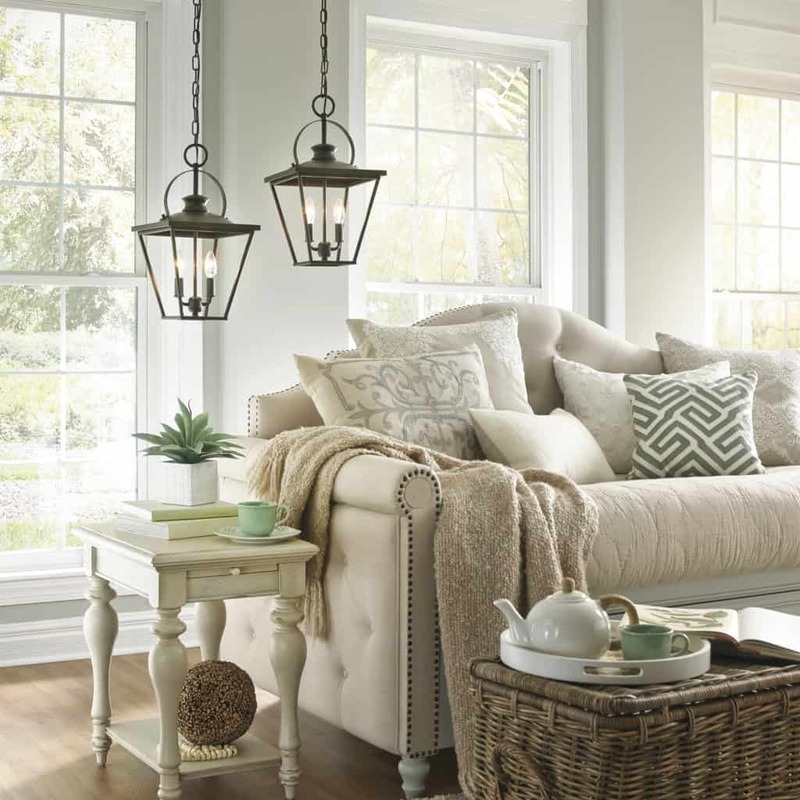 The style philosophy stands for coziness and peace of mind. 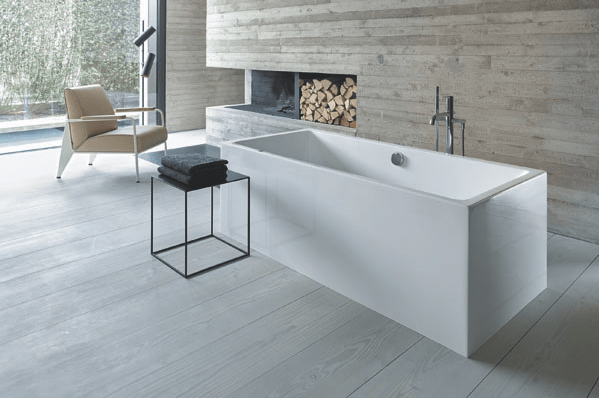 The soothing color scheme is typically Scandinavian hues of soft beiges and greys fostering a rest, don’t race; relax, don’t stress ethos. 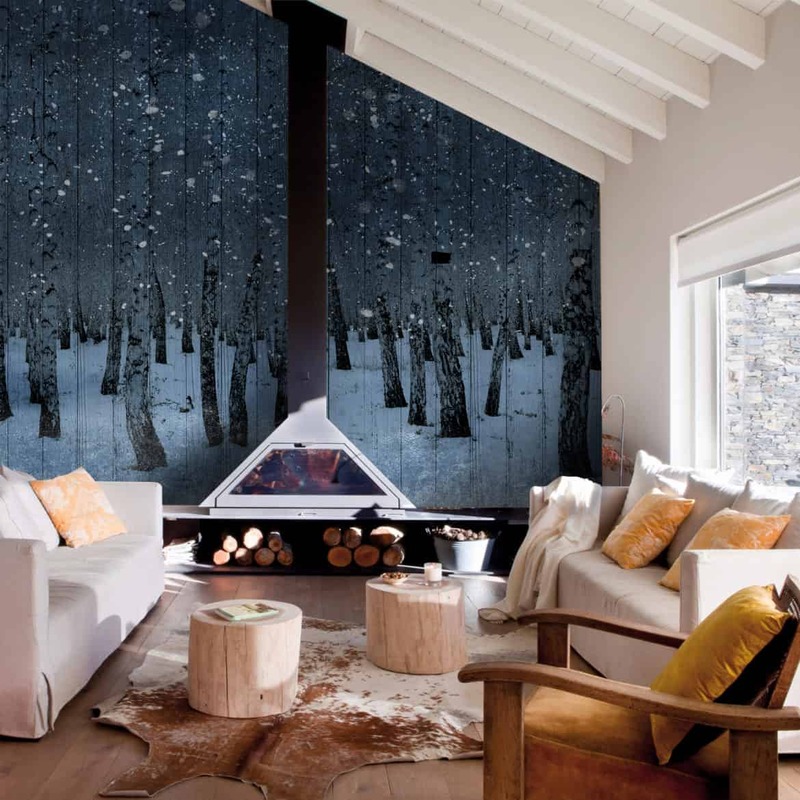 Simplicity defines this Nordic interior style. 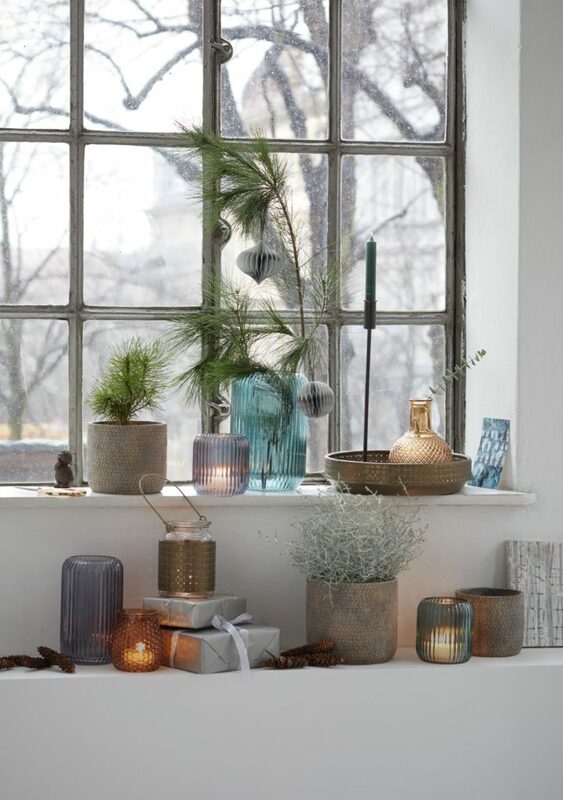 Hygge incorporates lots of ambient light including candlelight and small lamps and sumptuous textures. 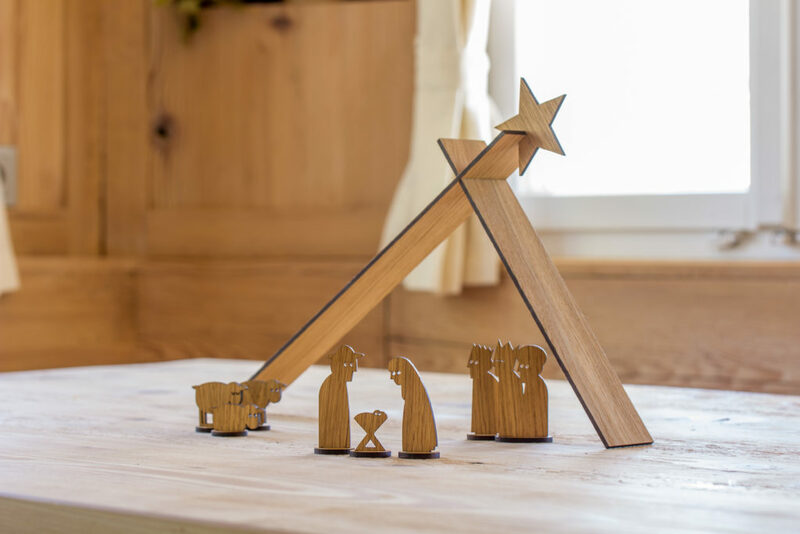 There is no right or wrong way to create Hygge, the style is more of a feeling that makes you want to curl up with a cup of warm coffee or hot chocolate in front of a fire with a fluffy blanket. 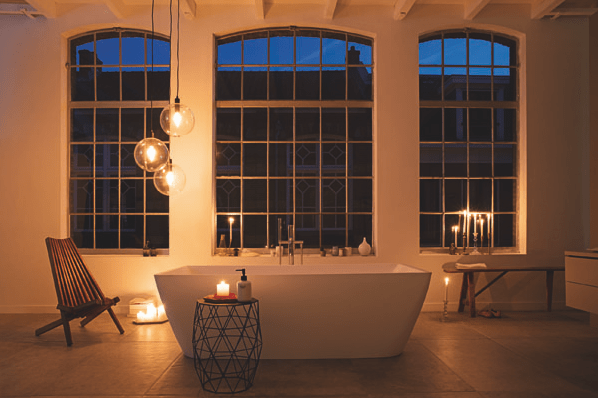 Envision soft, lived-in fabrics; warm, glowing light; simple, classic lines. 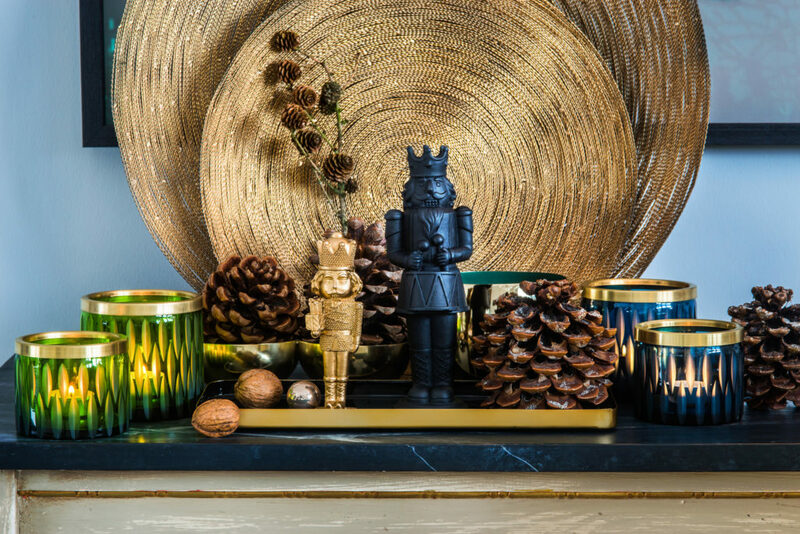 Surround yourself with objects, furnishings and fabrics that make you feel content and you’ve got Hygge. 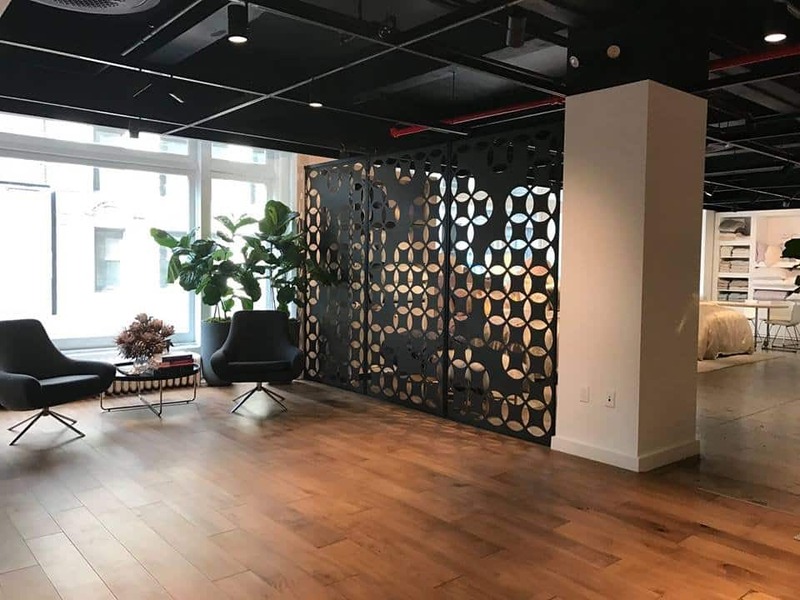 Health is the new wealth and design that promotes wellness and self-care are shaping today’s living spaces. 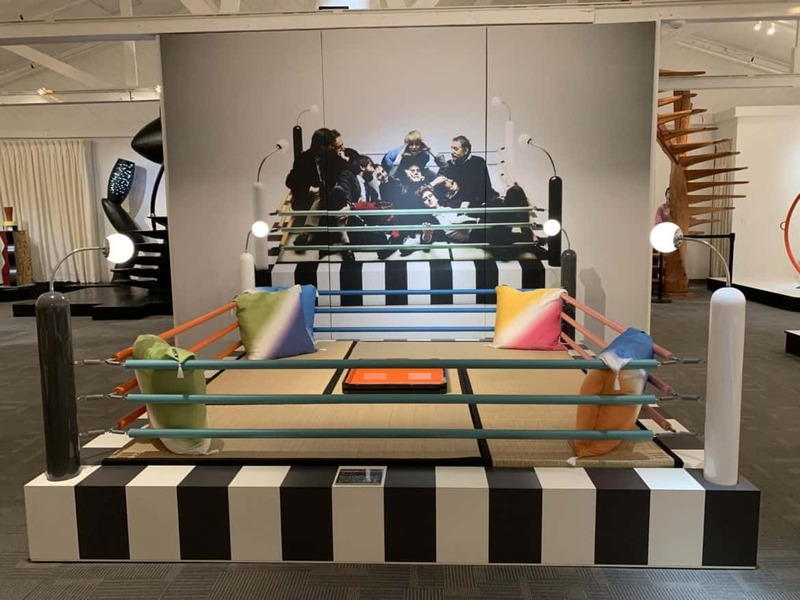 Changing attitudes and priorities about the way we live and inhabit space is driving a wellness revolution in design at home, at work and at play. 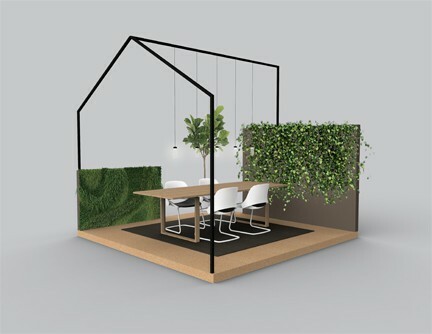 Today’s consumer demands toxin-free materials, fresh air, and good lighting at home and at work. 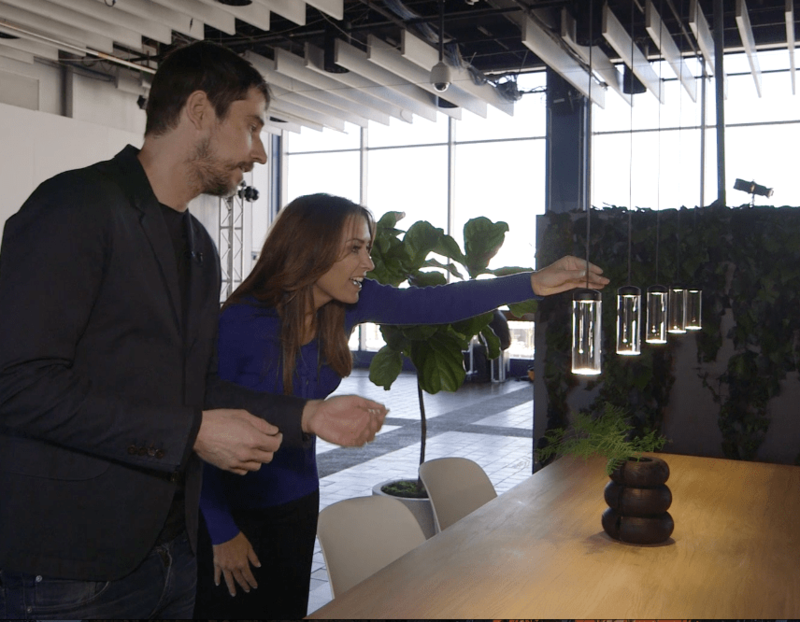 Humanscale, designer and manufacturer of products that improve wellness, calls on the science of biological lighting to create lights that follow the circadian rhythms, to enhance mental and physical well-being. 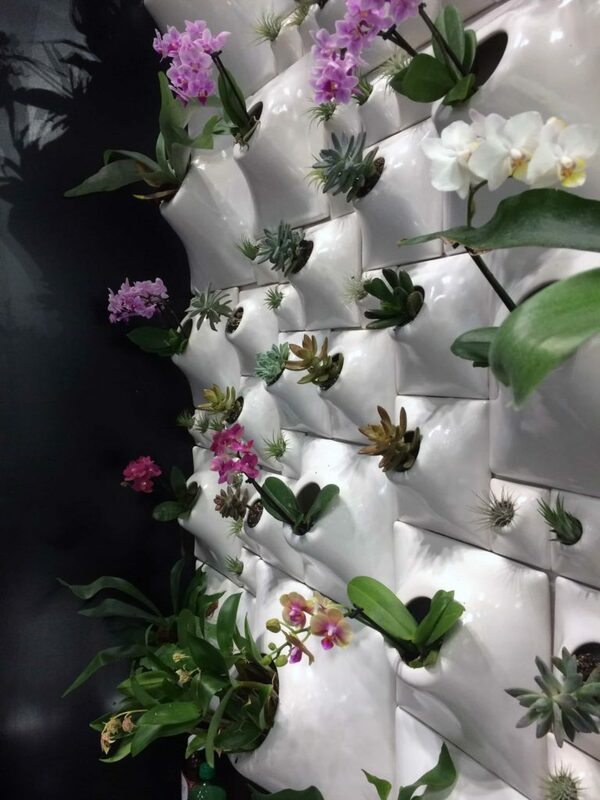 Interior plant walls or vertical gardens purify the air bringing nature indoors. 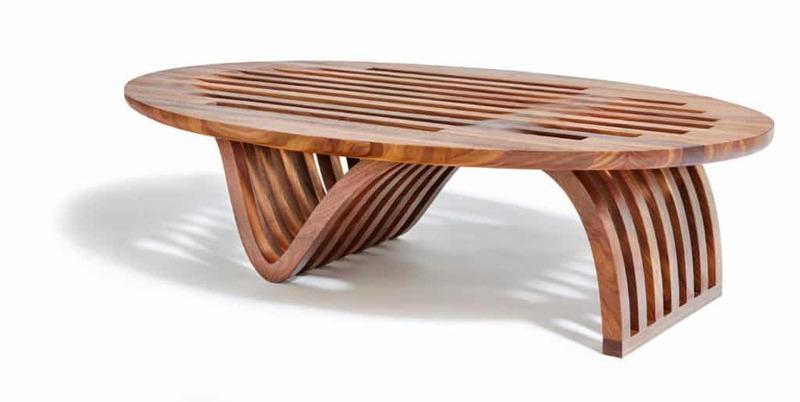 Chairs and furnishings that mimic the biomechanics of humans enhance comfort. The ishness of design is taking an established style and adding a dash of “ish” to make it your own. 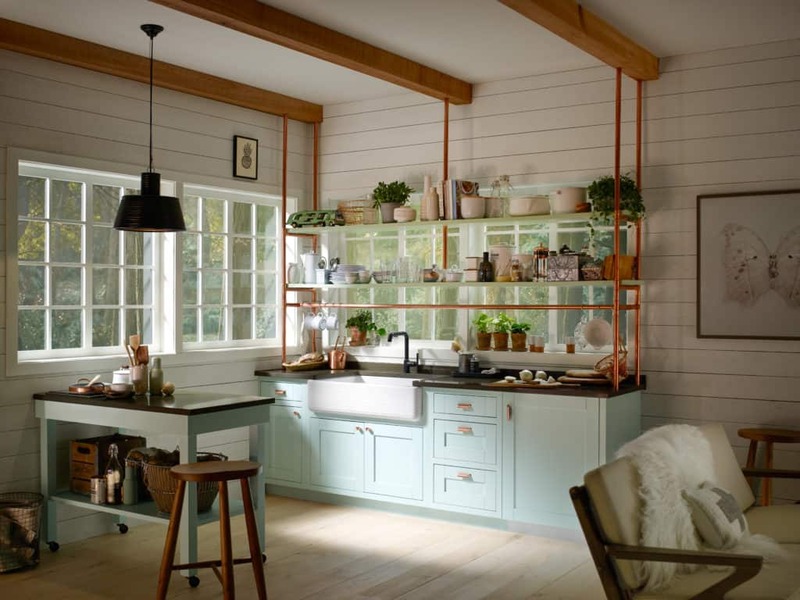 Think: Modern-ish, Farmhouse-ish, Retro-ish, Organic-ish, Traditional-ish. It’s a riff on stereotypical aesthetics. 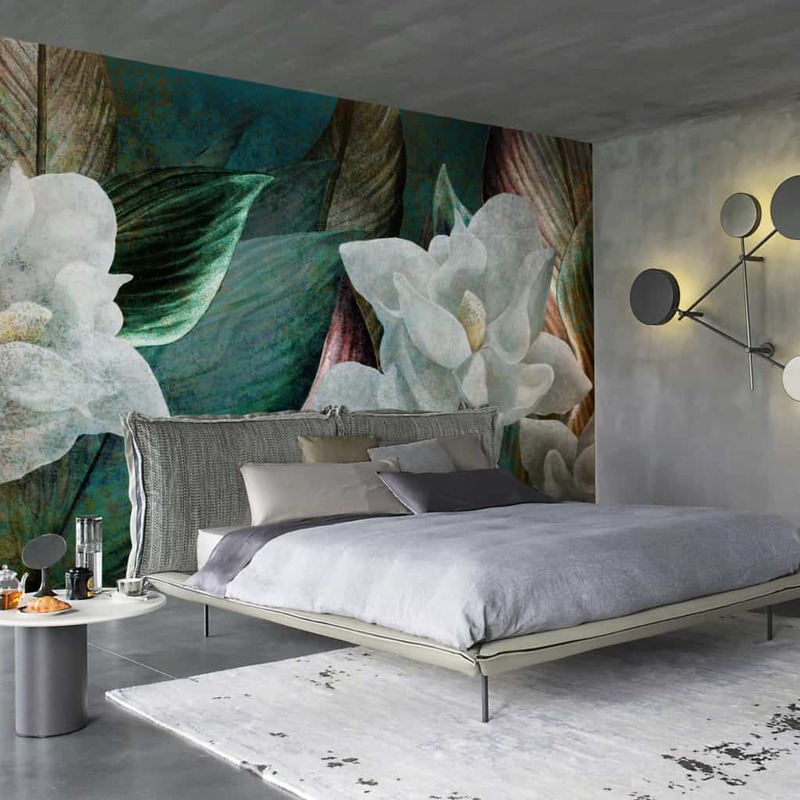 Modern-ish softens sleekness with natural materials, textures and curves taking away the style’s harsher, cold edges and injecting color into the typical monochromatic colorscape. Farmhouse-ish takes country style and gives it an urban or industrial edge. 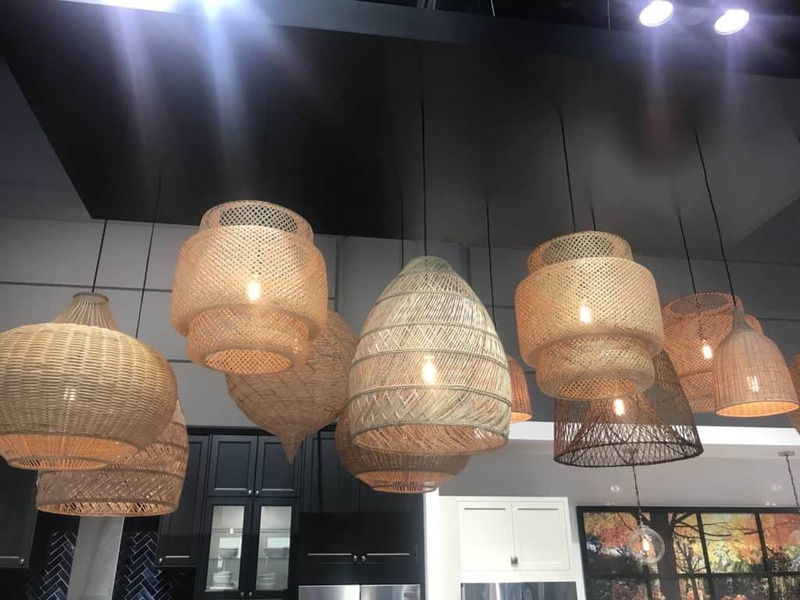 The look is a chic upgrade from the old world charm of a Tuscan kitchen with creative use of design elements such as woven basket pendant lights clustered in a modern configuration. 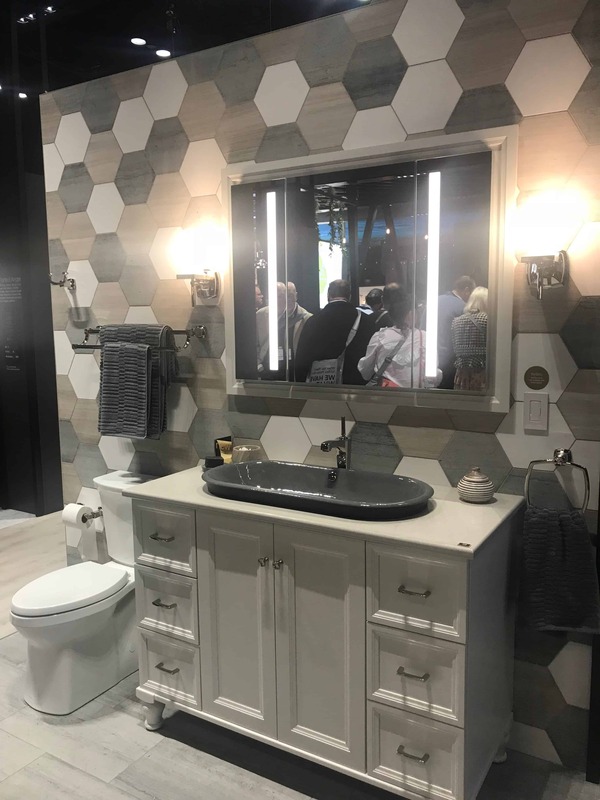 Wellborn Cabinet Inc., did a great job of pulling this look together at the 2018 KBIS show. 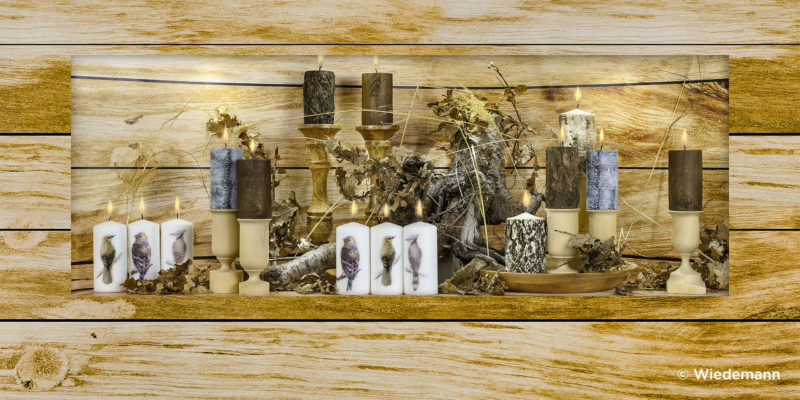 Organic-ish infuses mother nature into decor with lots of wood and stone but without being too rustic, keeping the look sophisticated and refined. 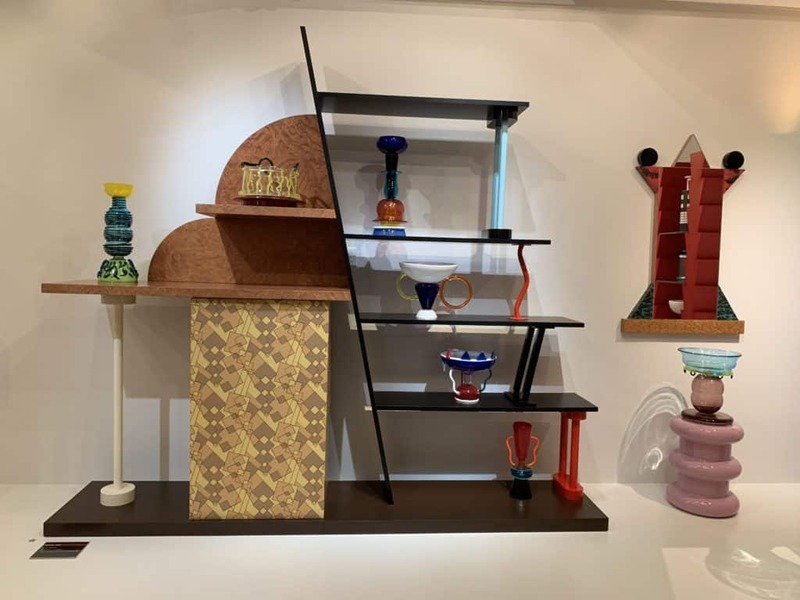 Traditional-ish is what we like to call Transitional, not wanting to leave your comfort zone and abandon what’s familiar and timeless yet wanting to update the look for today. 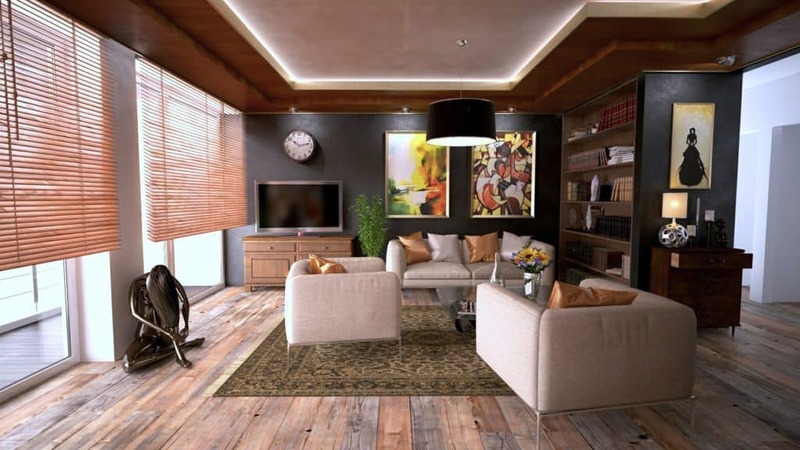 Are you redesigning your home for yourself or with the future potential sale in mind? 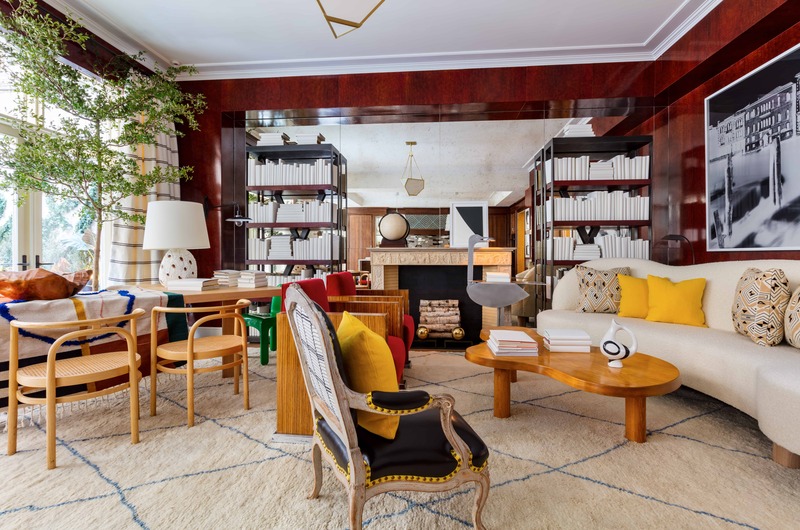 If you’re thinking about a sale, you need to look at what buyers love to see when they view an interior of a home on the market. 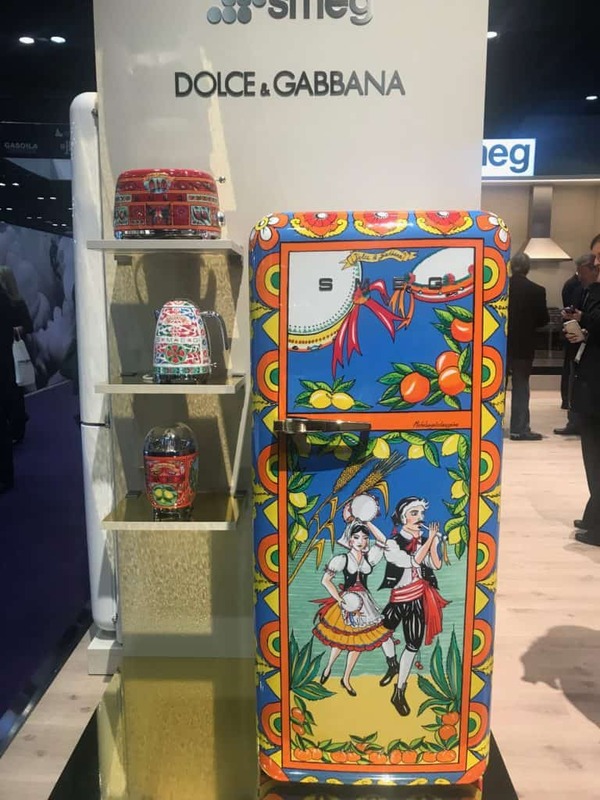 There are various features and design ideas that buyers are interested in. 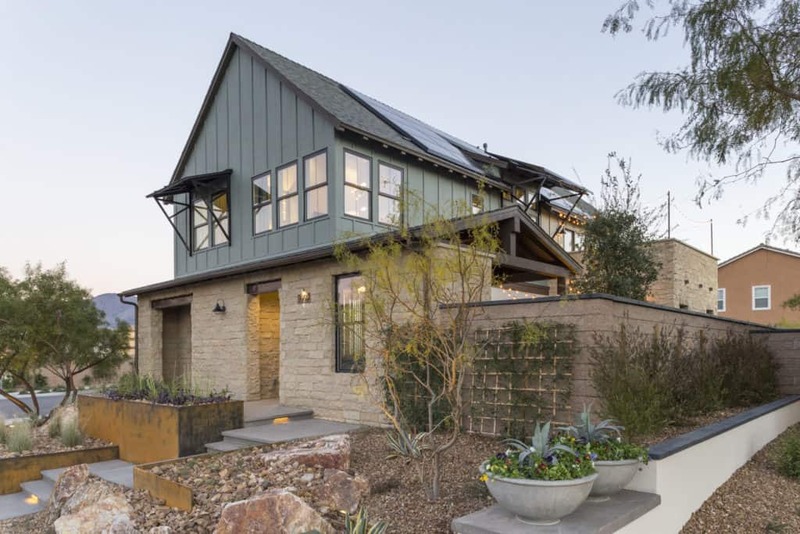 By knowing these, you can make sure that you get a lot of interest for your home on the market and the offers with the right number of zeroes. 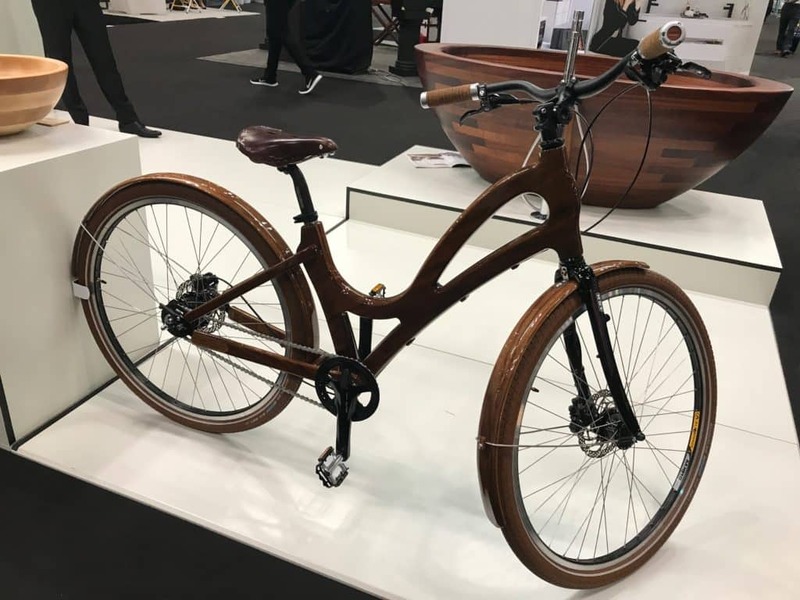 Let’s look at a few these features and design ideas. 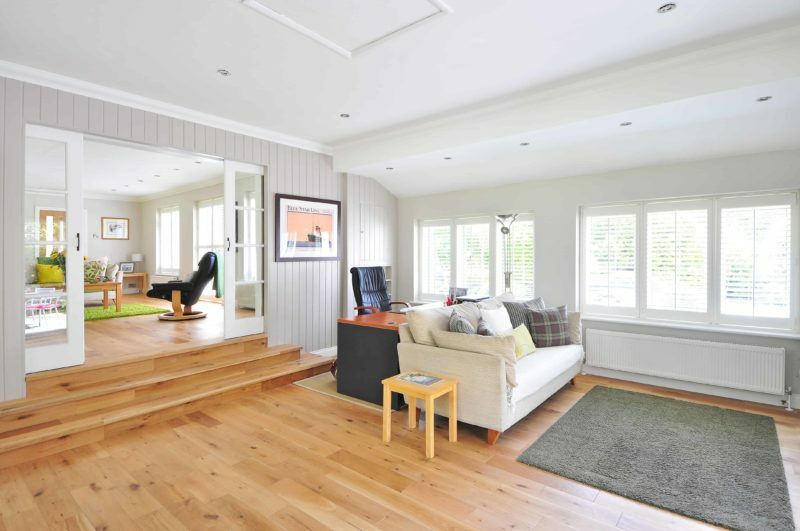 There are no prizes for guessing why buyers love hardwood floors. 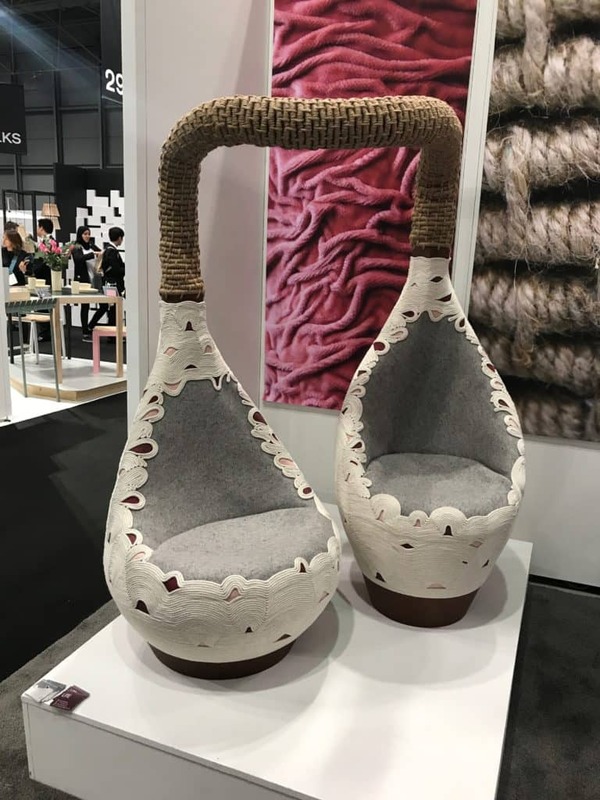 First, they fit in with a minimalistic design and unlike carpet, they don’t intrude or draw attention away from the overall decor of the room. Second, they are easy to maintain and clean, providing the perfect option for couples or single homeowners. 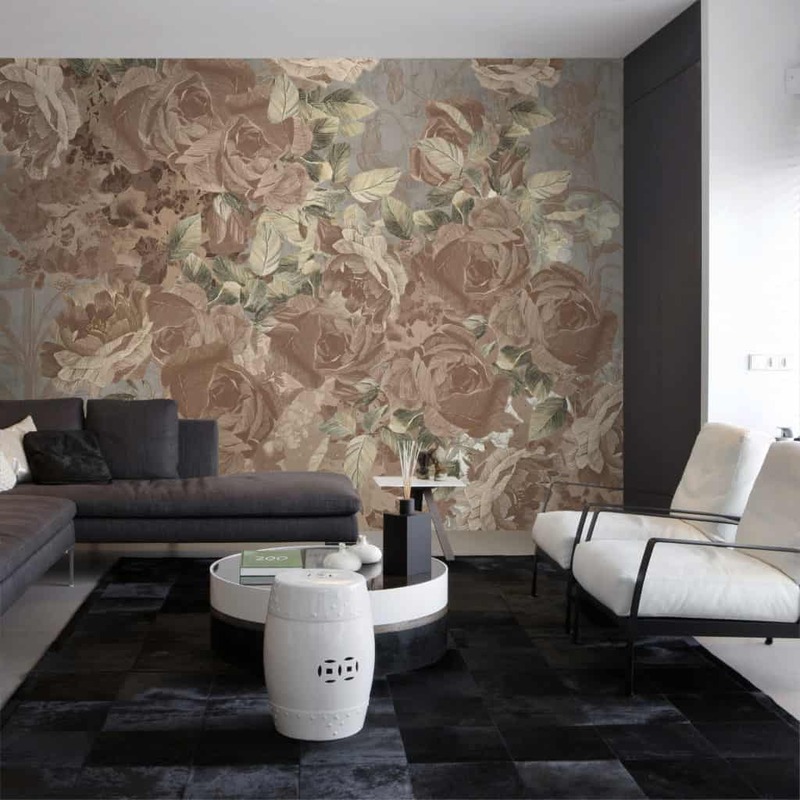 On top of this, they look extravagant, stylish and stunning, providing a luxurious feel to any area of your home. 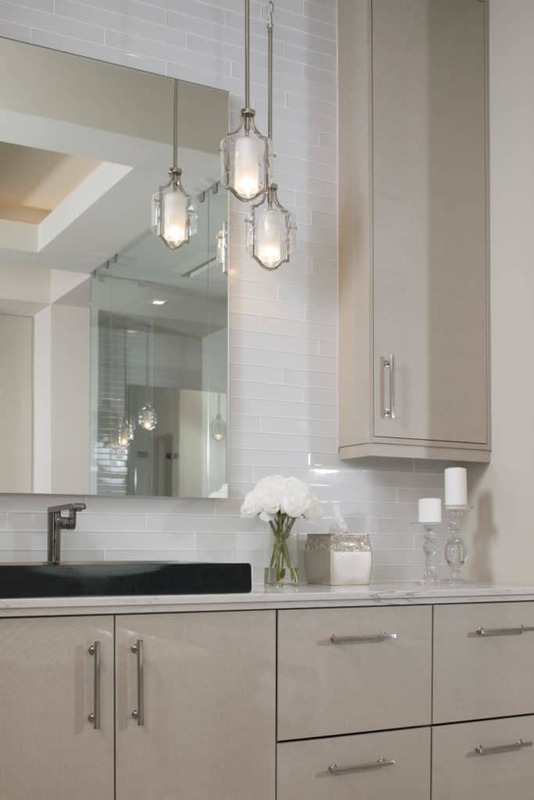 Laundry and utility rooms have certainly become more popular with buyers again lately. We are moving away from the concept of an all-inclusive kitchen towards homes that have laundry rooms with washers and dryers built in. 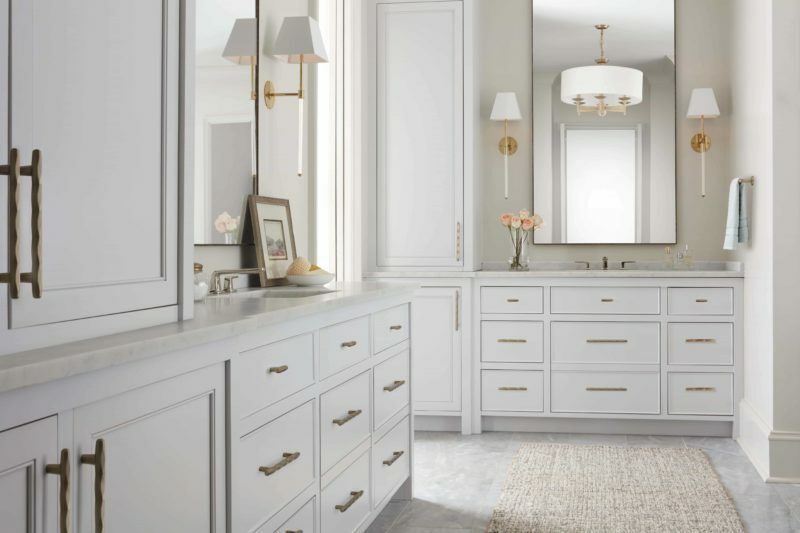 If you’re intrigued by this possibility in your property Think Tank Home, have a guide on how to create your own laundry room and design it to fit in your property. At the very least, this will add a substantial amount of money onto the offers that buyers put forward. 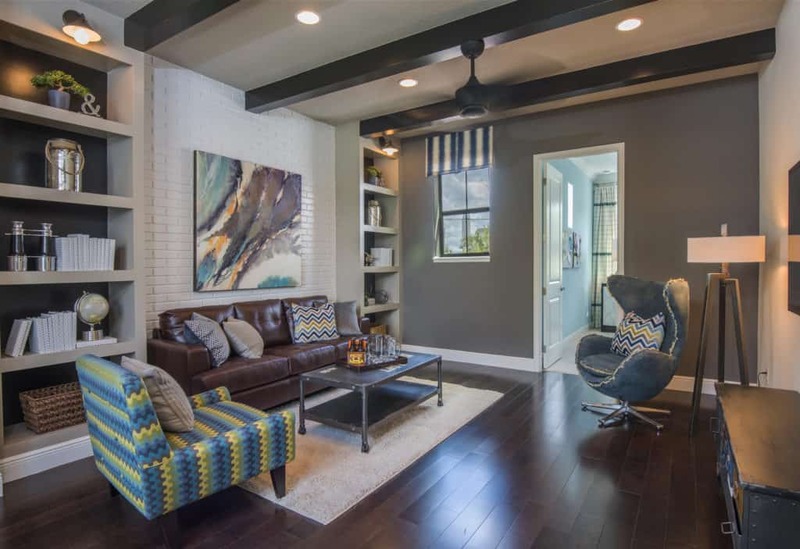 Another feature that buyers are hoping to see when they view your home is a ceiling fan. 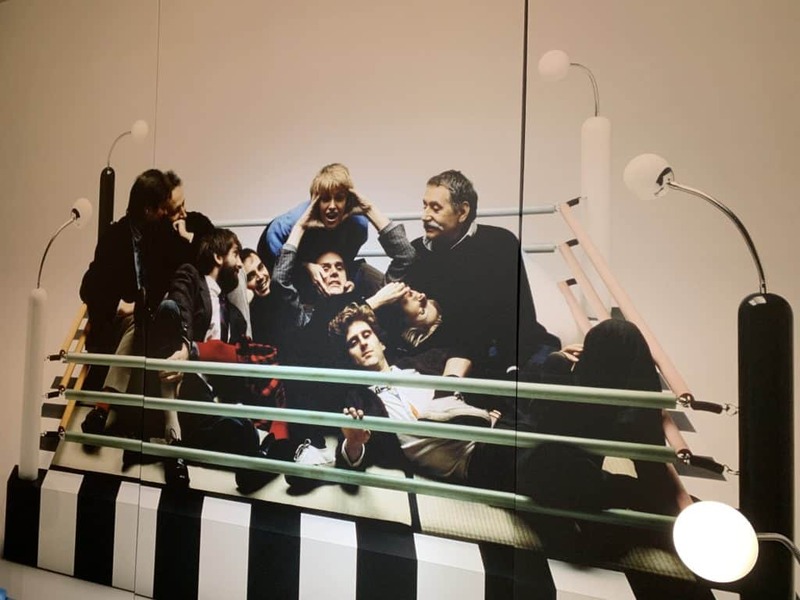 This is particularly important for the bedroom. 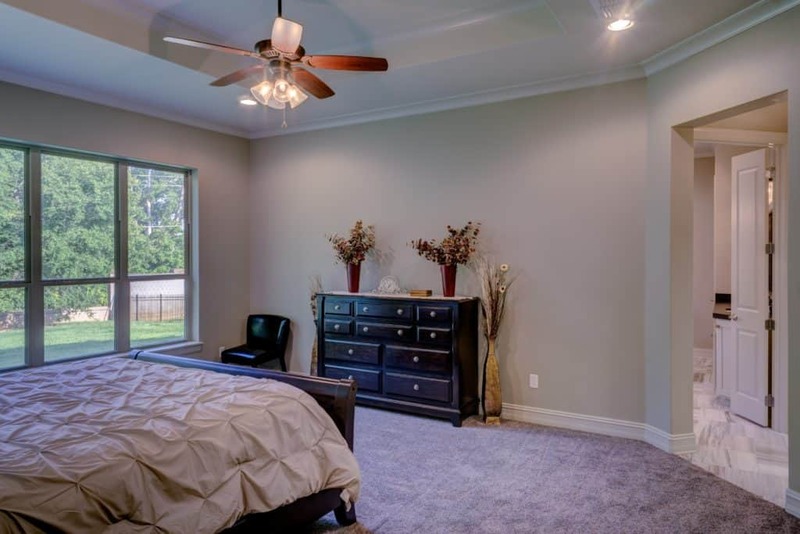 This isn’t just about keeping the room a comfortable, cool temperature through the summer months. 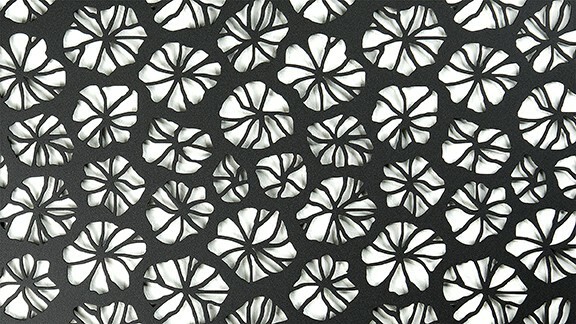 A lot of buyers love the aesthetics of these fans and think that they add a fresh level of decor to any room. 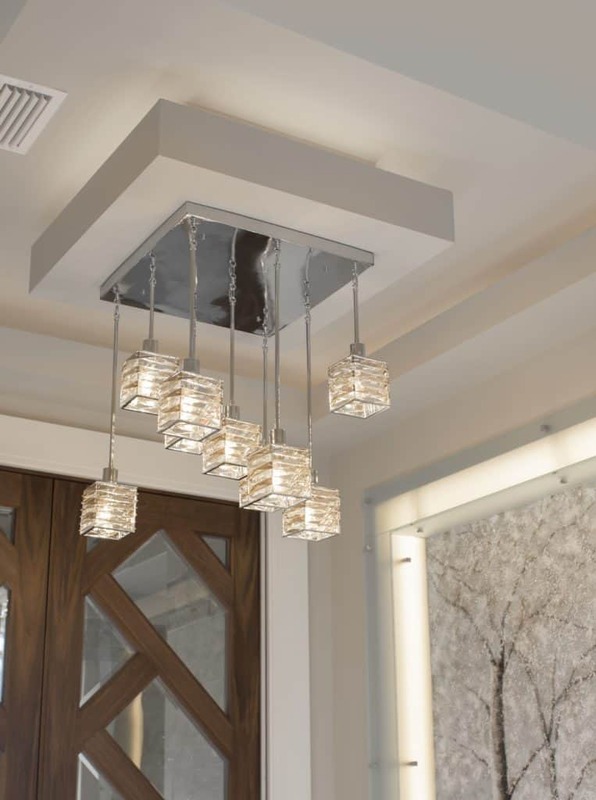 It’s a more elegant option compared to your typical aircon system. 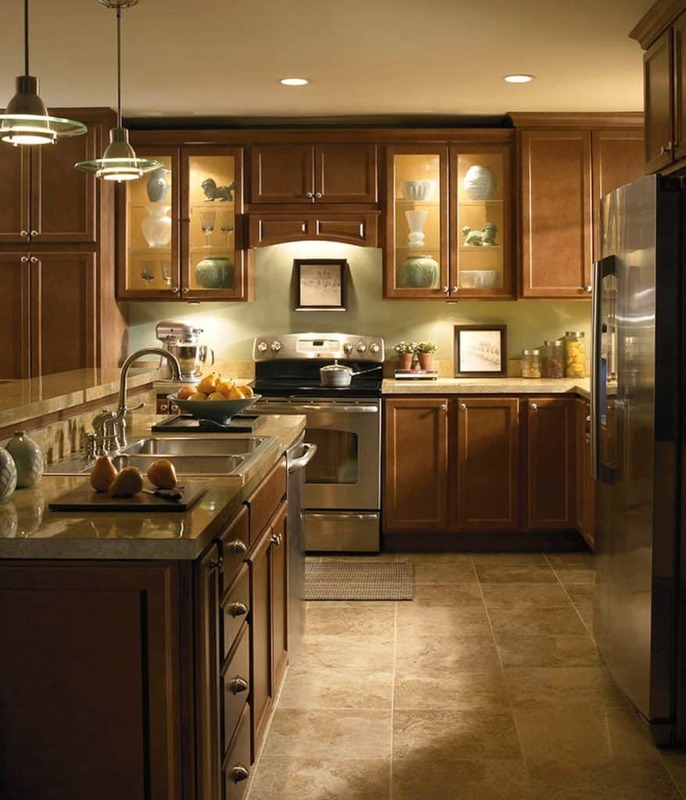 If you’re looking for ways to renovate your kitchen, you should think about focusing on the eat-in options. 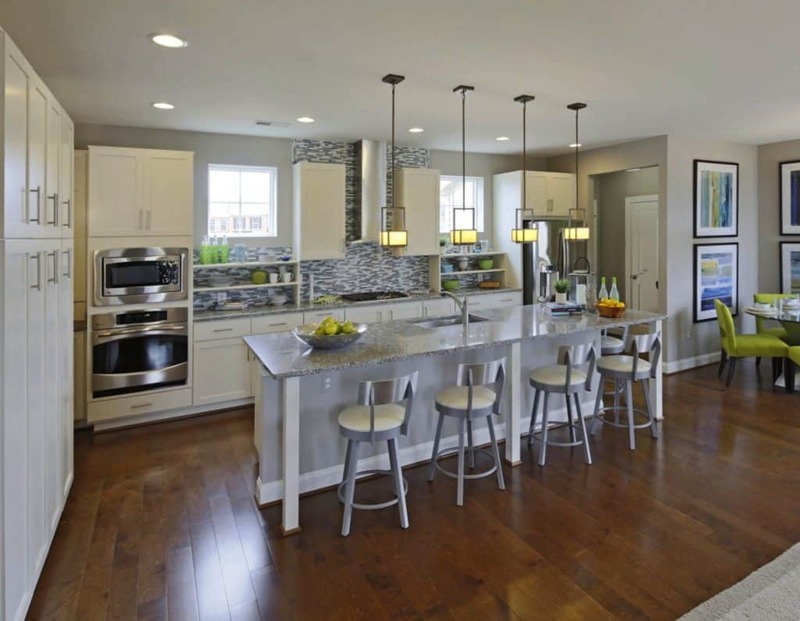 Families, in particular, are eager to own a kitchen with a breakfast bar or island. 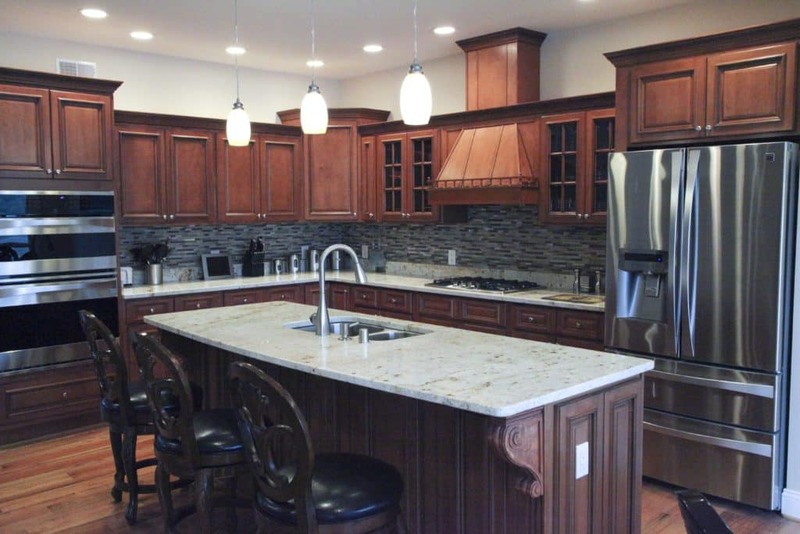 While expensive, designing a breakfast bar in your home is a great way or creating this eat-in kitchen style. Lastly, if you can afford it, you should think about redesigning a house with closed off rooms into something that is a more open plan. You can do this by tearing down the walls separating the dining area from the lounge. Or, the kitchen from the living room. You do need to make sure that you hire an expert or professional when you complete this type of change though. Otherwise, you could accidentally remove a load bearing wall. 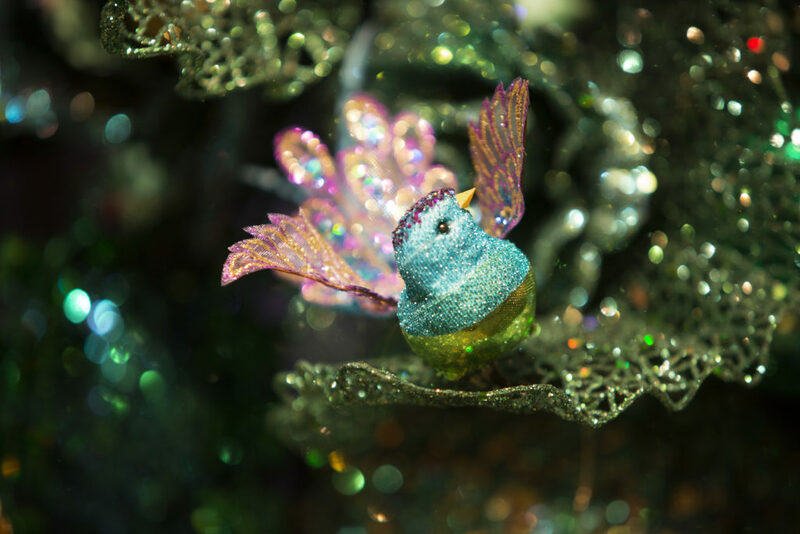 An expert can also help provide advice on the best ways to make sure that this type of design looks stunning. These are just some of the features that buyers would love to see when checking out your home. 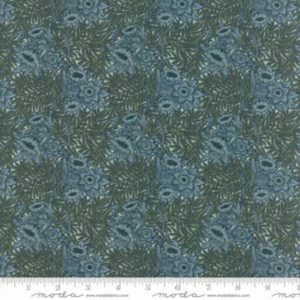 William Morris made wallpaper fashionable in the 19th century with his nature motifs taken from British wildlife. 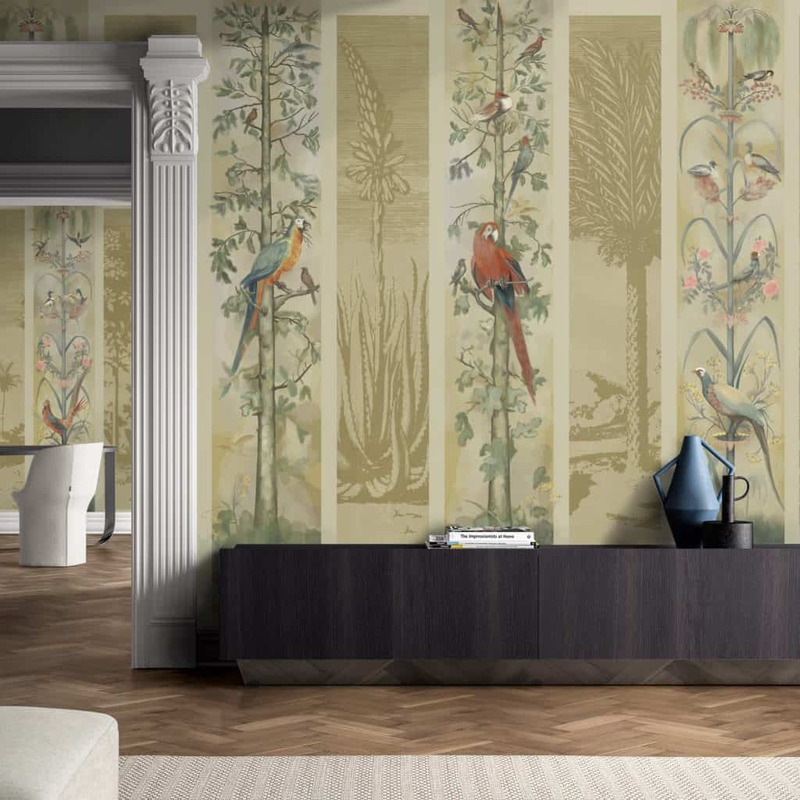 Since the mid-1800s, wallpaper has fallen in and out of style. 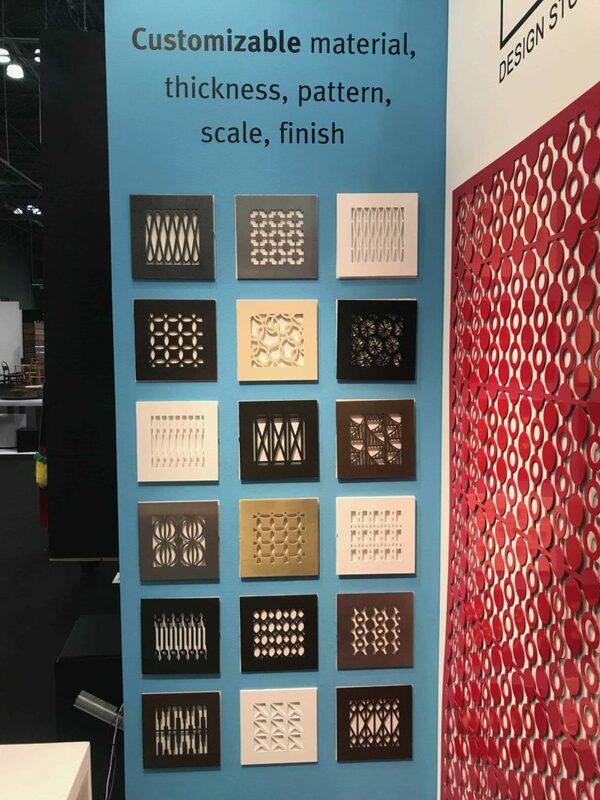 Today, patterned walls are back in a big way with maxi-motifs often inspired by Morris’ progress patterns from the Victorian period. 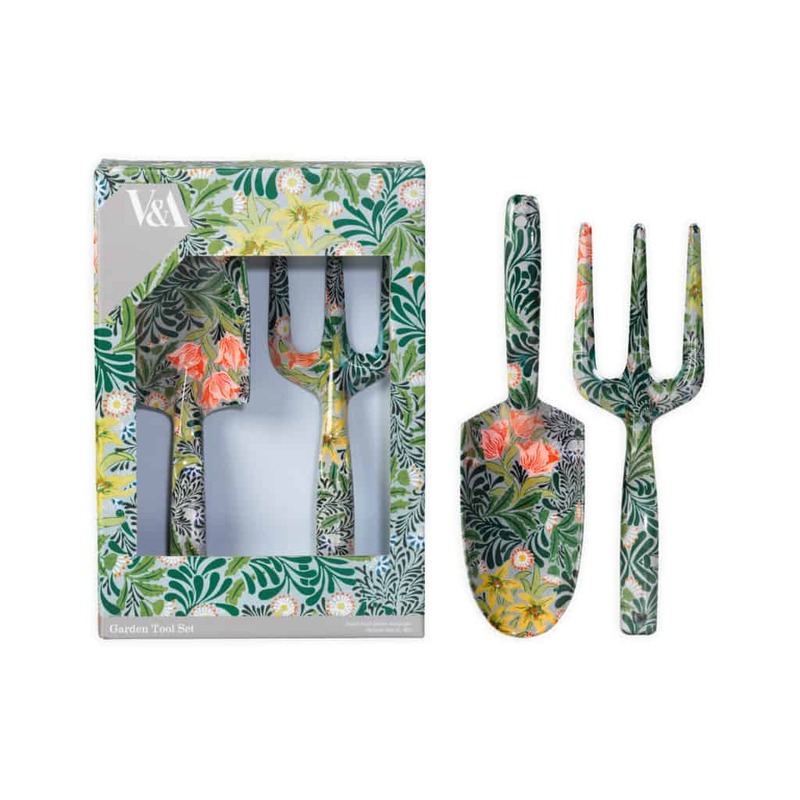 William Morris’ patterns endure today through a variety of licensees manufacturing homeware, bedding and wallpaper and are often emulated by other designers. 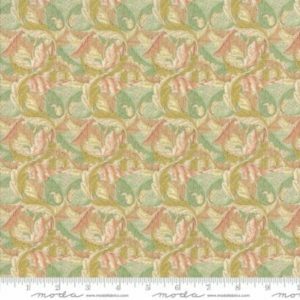 Victoria & Albert Museum in London holds a large archive of William Morris designs available for license in different product categories. 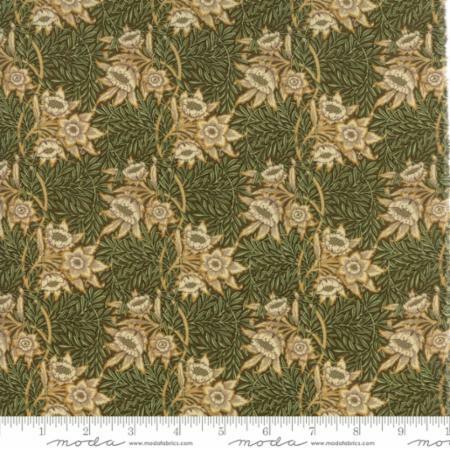 The museum recently licensed a series of William Morris patterns to Moda Fabrics to create a line of quilting fabrics. 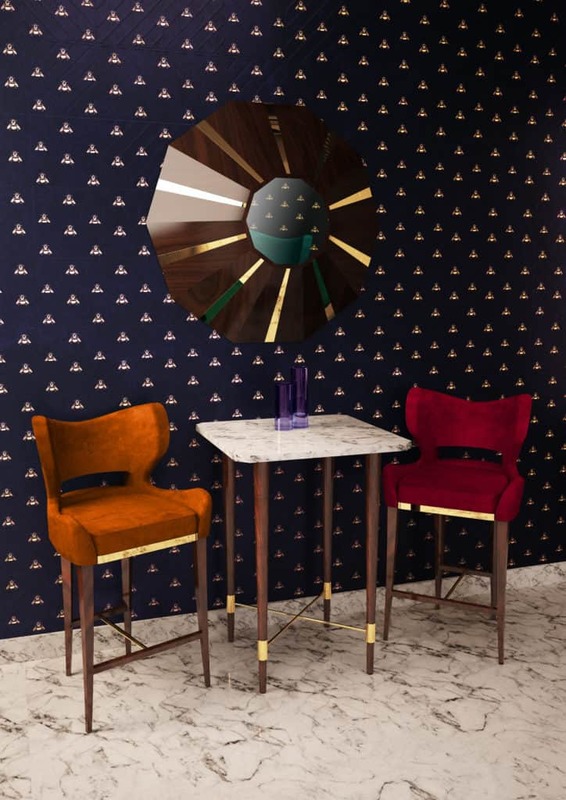 Taking cues from William Morris’ oeuvre, wallpaper houses around the world reinterpret his radical naturalism born of the British the Arts and Crafts movement to create contemporary wallpaper and textiles. 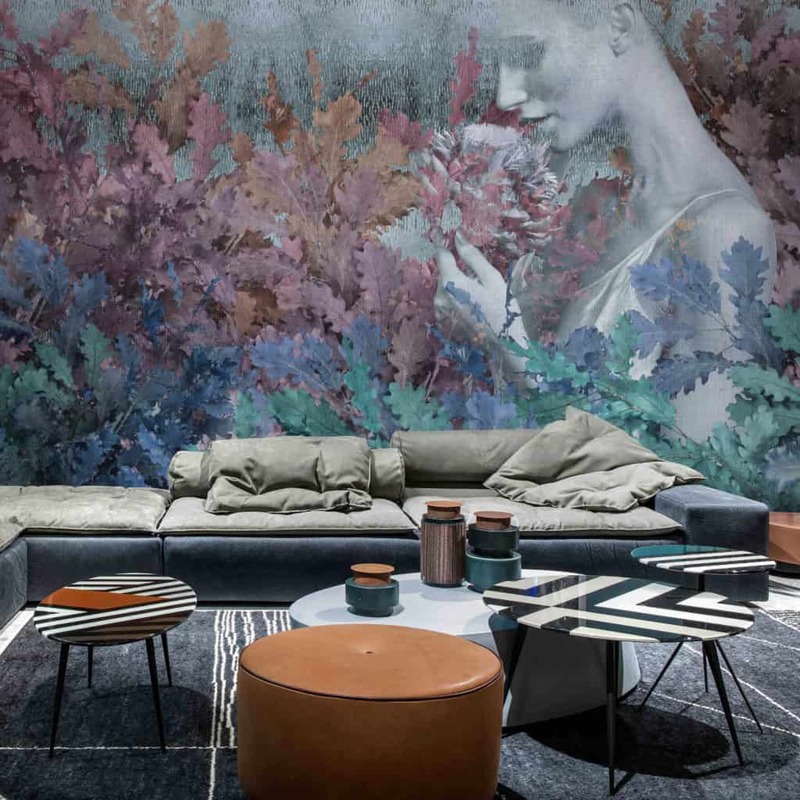 Italian wallpaper house Skinwall is fusing the concepts of pattern and mural to create massive wallscapes in sweeping scenes for feature walls or entire rooms. 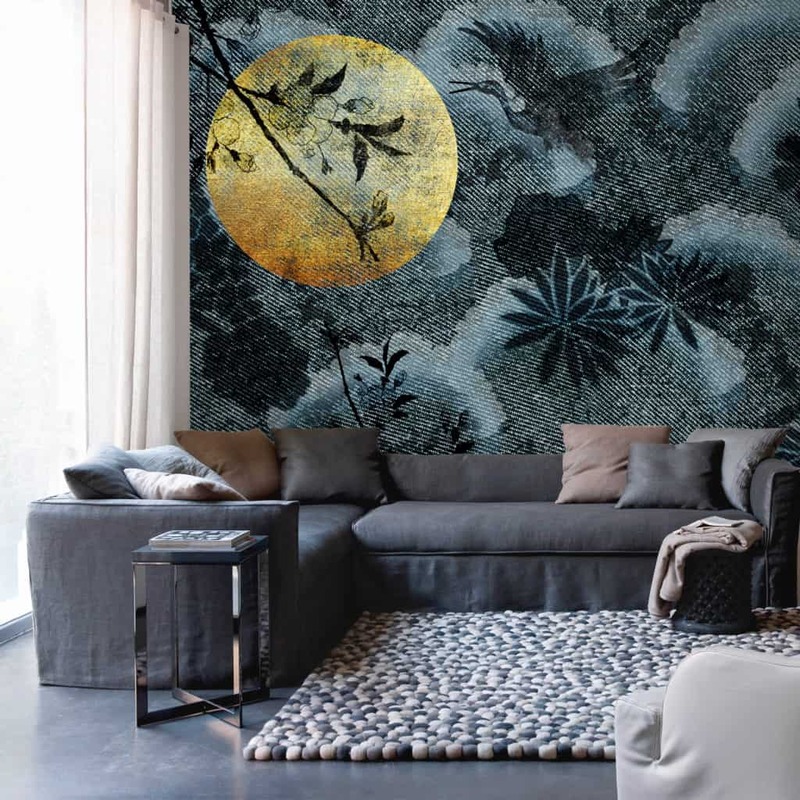 Here’s a look at some of their latest designs in the Palingenesi collection wallpapers by artists/designers Fabio Iemmi, Michelangelo Bonfiglioli and Gloria Zanotti. 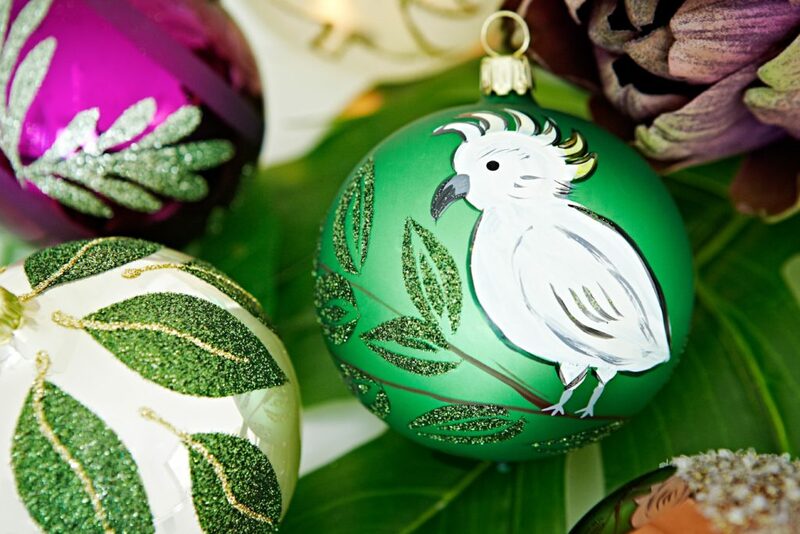 The garden goes indoors with exotic settings evoking wild forests, jungles, lush foliage and exotic birds. Large stylized florals and foliage update a traditional motif with a pop art edge. 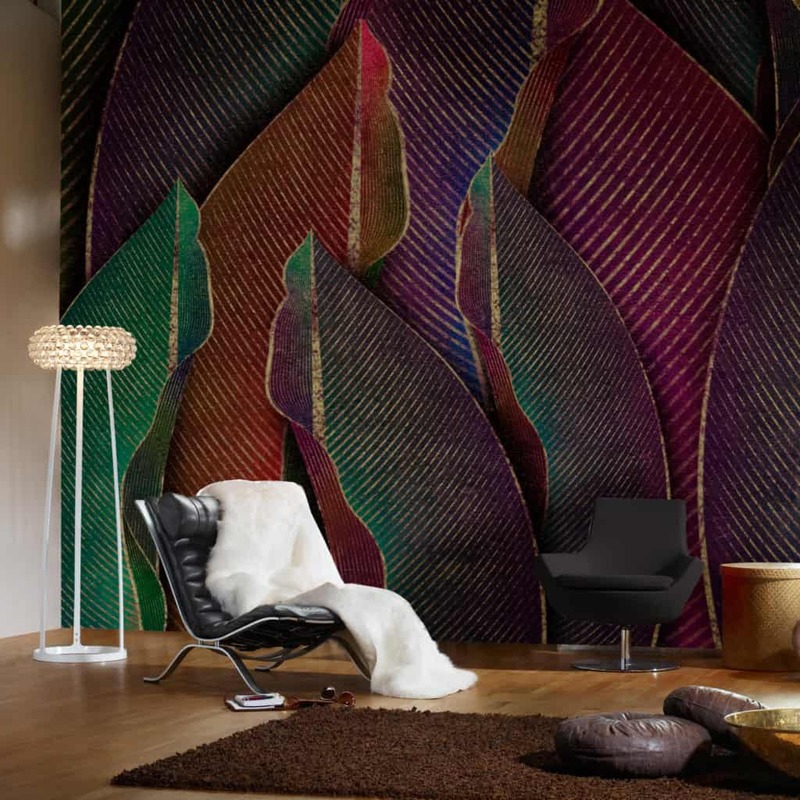 Wallscapes that infuse an ethereal, fantastical ambiance to a living space stir emotions. 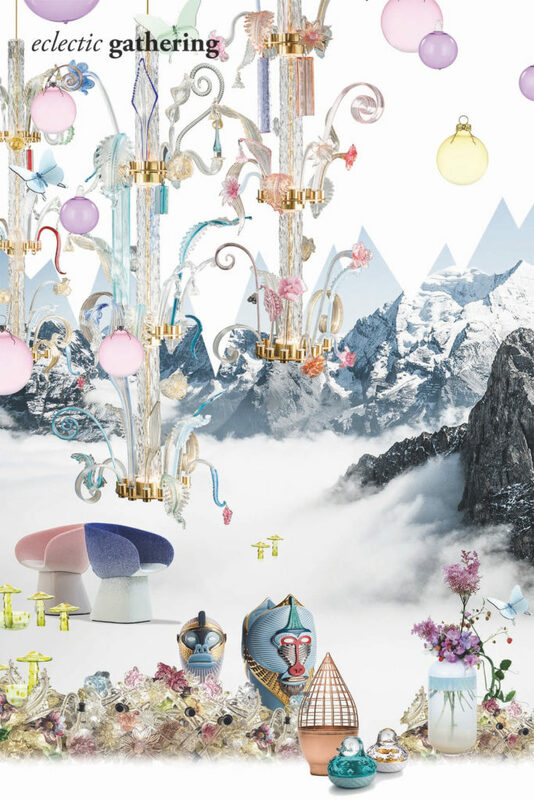 These dreamlike designs feature various muses to create striking, theatrical atmospheres. 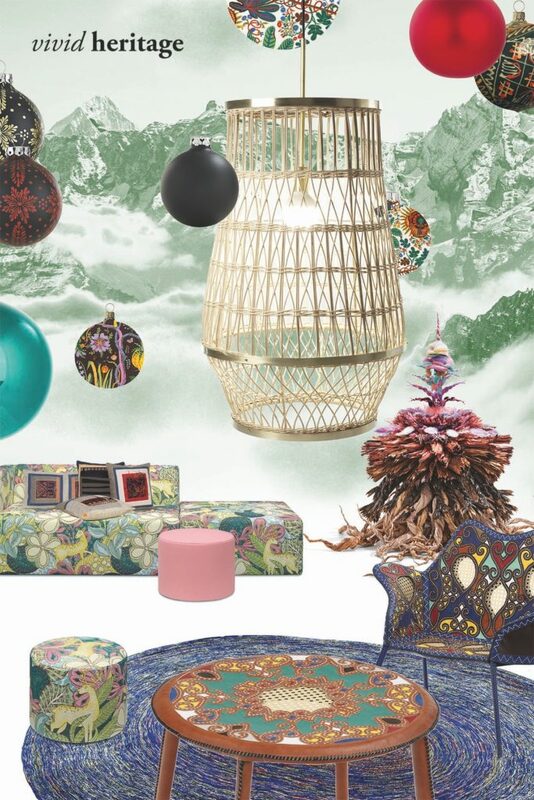 Large Asian inspired motifs create a contemporary take on Chinoiserie style in the home in bold colors. 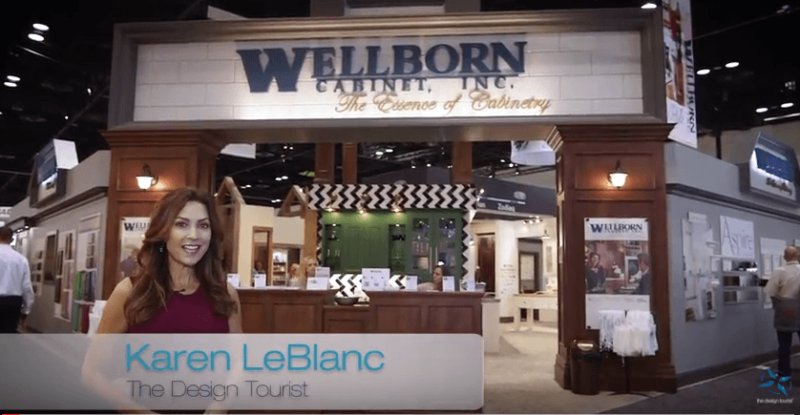 For more design ideas, subscribe to my youtube channel for regular episodes of The Design Tourist for what’s new and next in design. 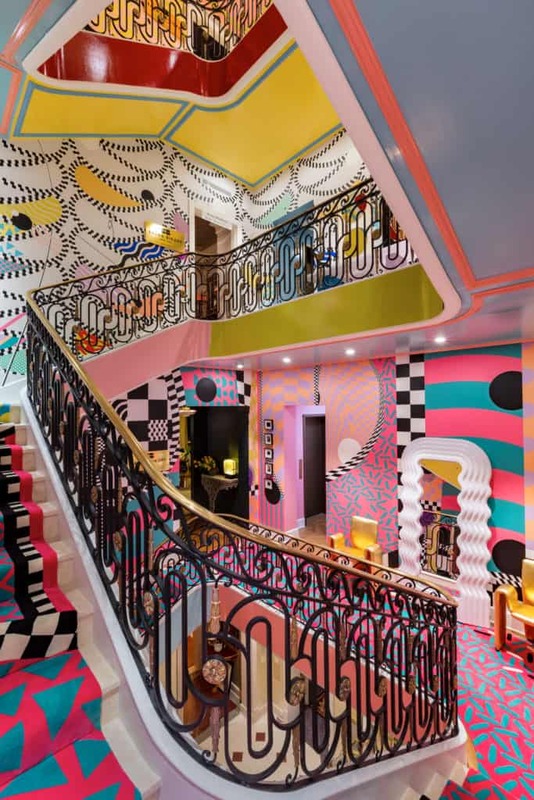 There is nothing worse than running out of inspiration when it comes to your home’s interior design. 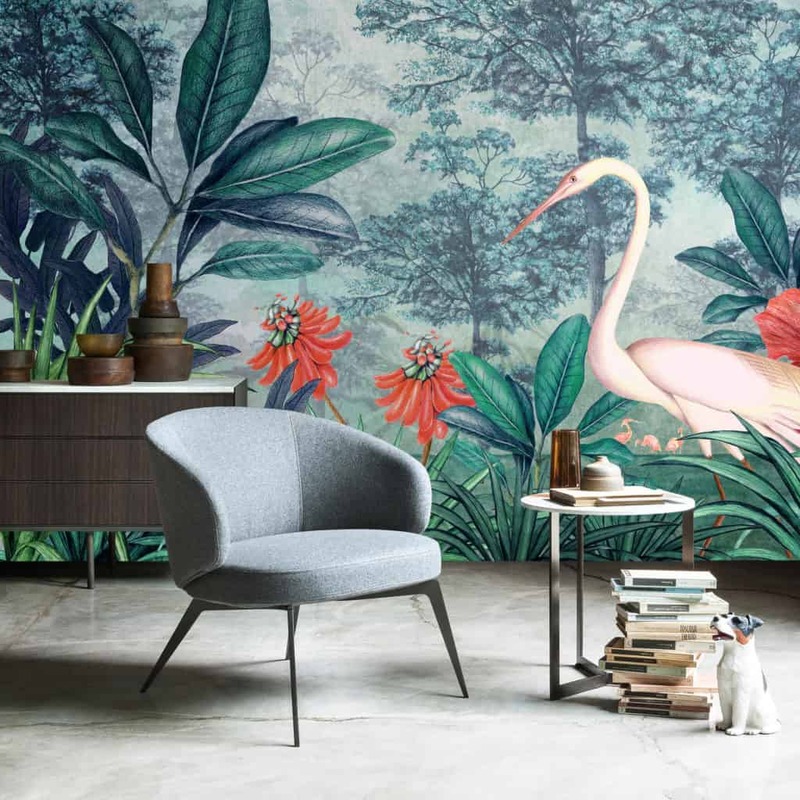 If you think that one of your rooms is looking slightly drab or no longer on-trend, then you will no doubt want to update it as soon as possible. However, if you don’t have any ideas of what you want to do with your new design, then you might end up quite frustrated. There is one way around a creative block such as this, though. 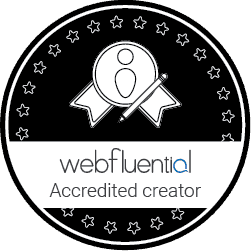 You might just need to look elsewhere for your inspiration! 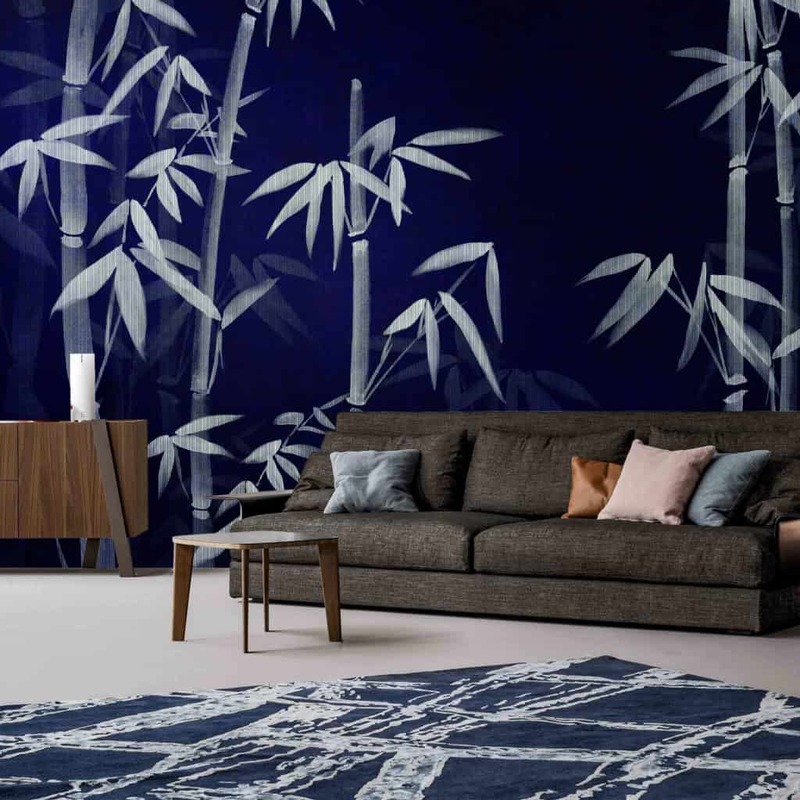 Each country around the world has their own interior design trends and fashions. 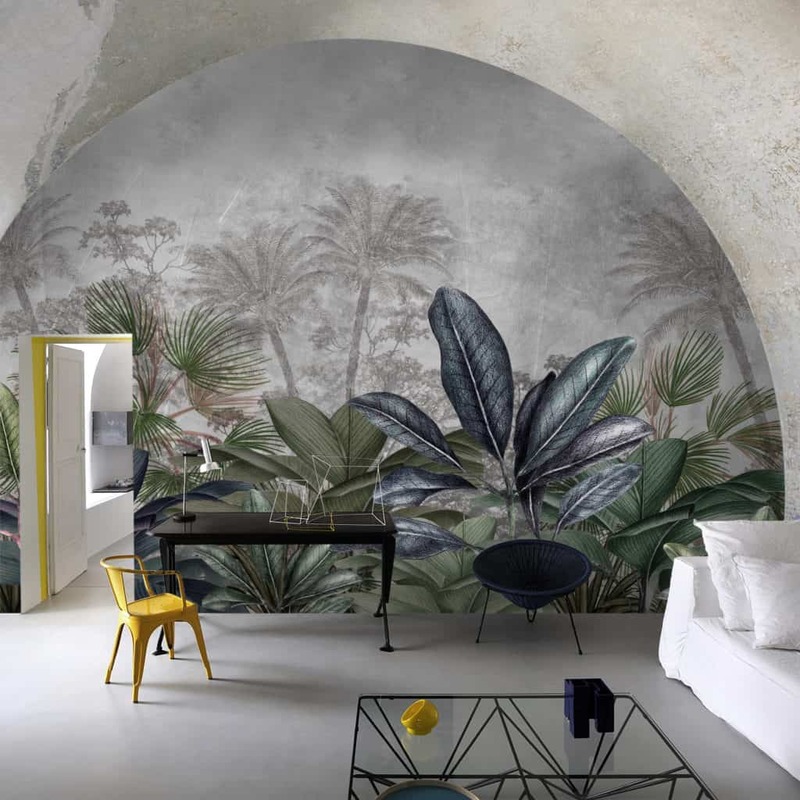 Why not check out some of these great decor inspirations from around the globe and see if anything fills you with some fantastic inspiration? 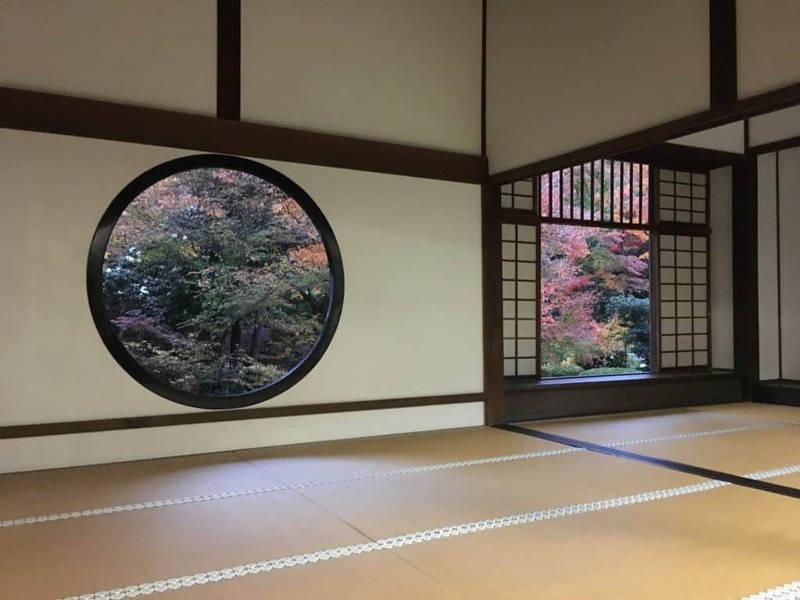 The Japanese are renowned for their minimalist style, and this interior design has started to creep up in popularity over here in the western world as well. 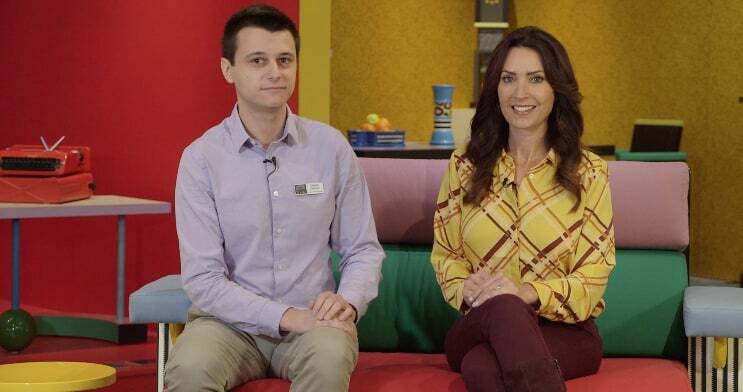 It’s actually quite easy to achieve a minimalistic look in a room. 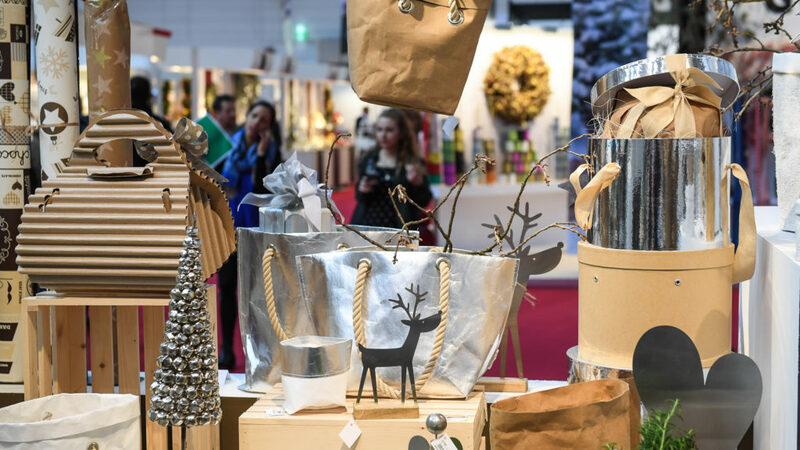 You just need to restrict the number of items of furniture and decorative features that you put in the room so that it doesn’t look too busy. 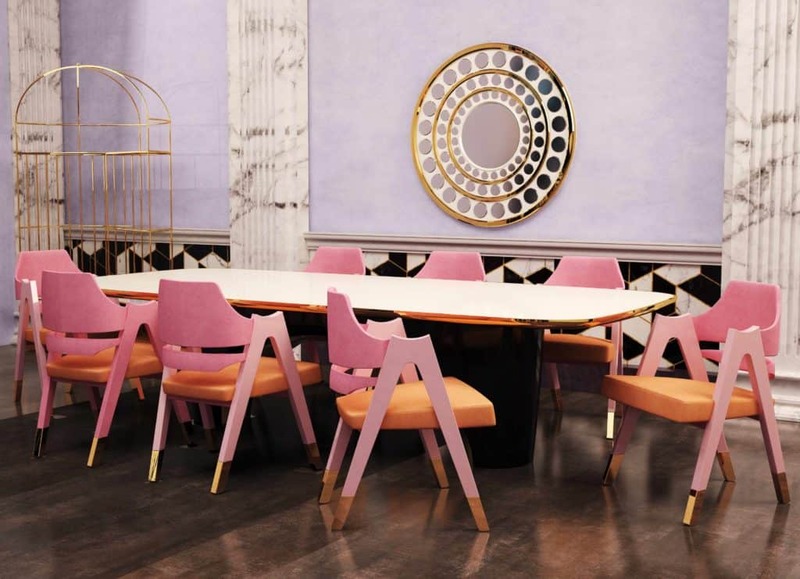 You should also use a neutral color palette, such as pastels, so that the walls don’t feel too overbearing. 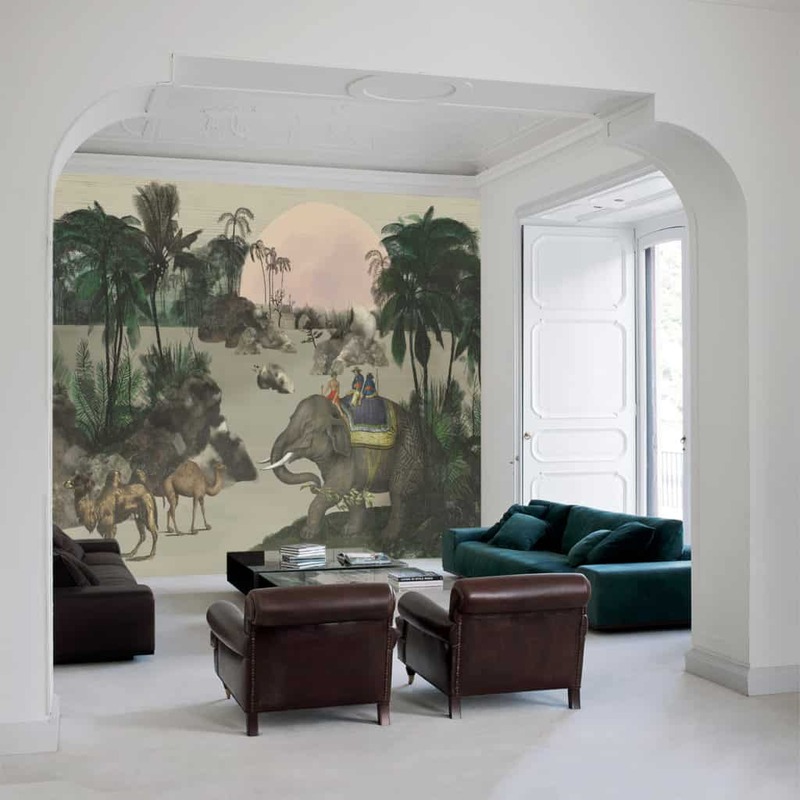 If you are ever in an Indian-inspired home, you will notice that it is very warm and welcoming. This is because of the use of dark colors. All those warm reds, browns, and greens add a lot of comfort to the room. 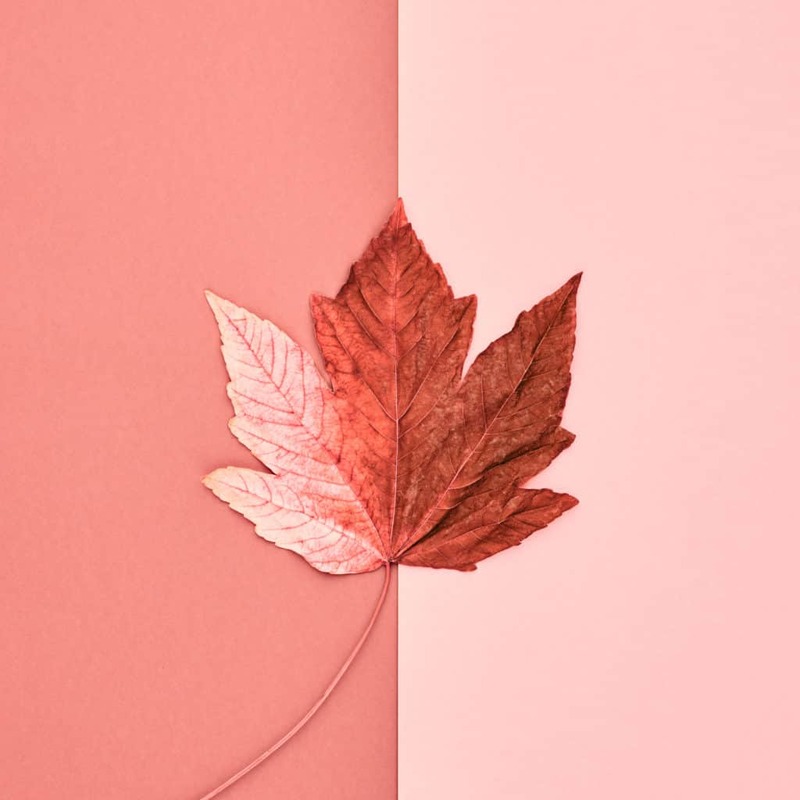 All of the warmth and comfort is often backed up by scent machines that diffuse relaxing fragrances, such as cinnamon and musk, around the rooms. Indians also add intricate decorative features, such as gems and jewels to ensure their rooms look as regal as possible. 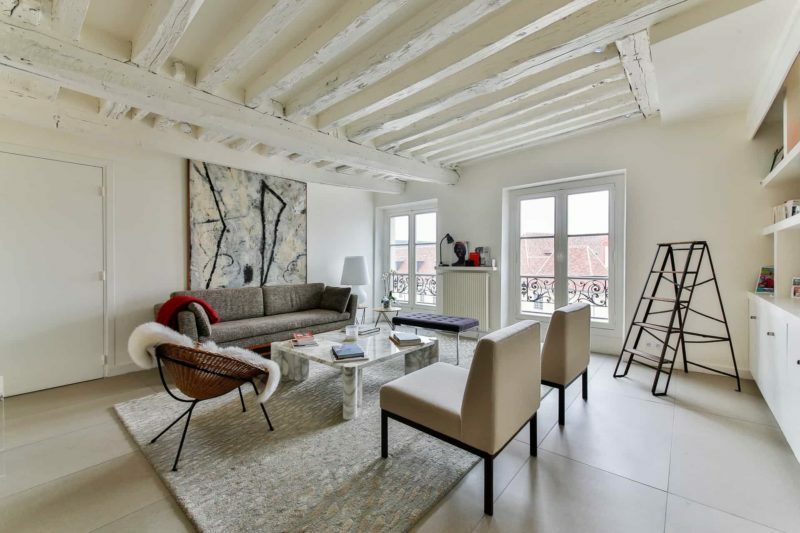 The French are known for their fantastic sense of style in fashion, but this sophistication also pours into their interior design as well. 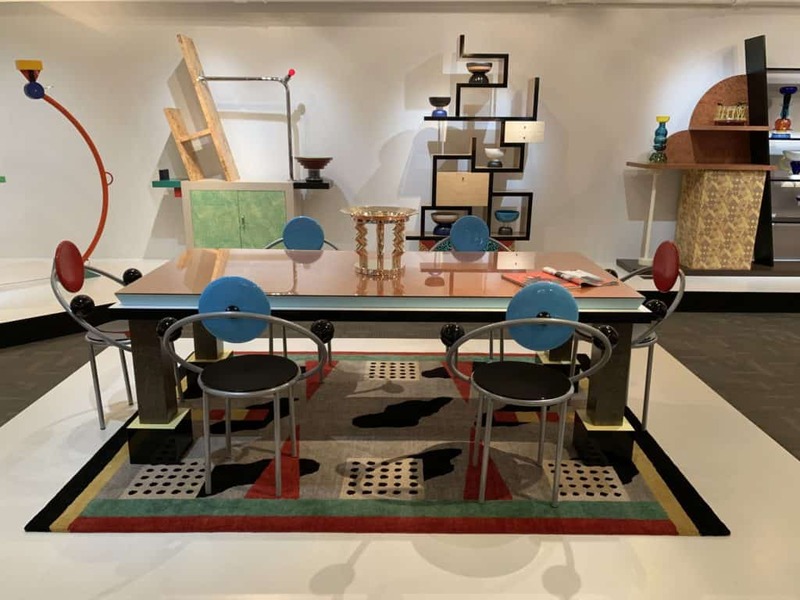 French homeowners will pay for the finest furnishings and works of arts in their rooms to ensure that it looks like it has been decorated with the highest quality. 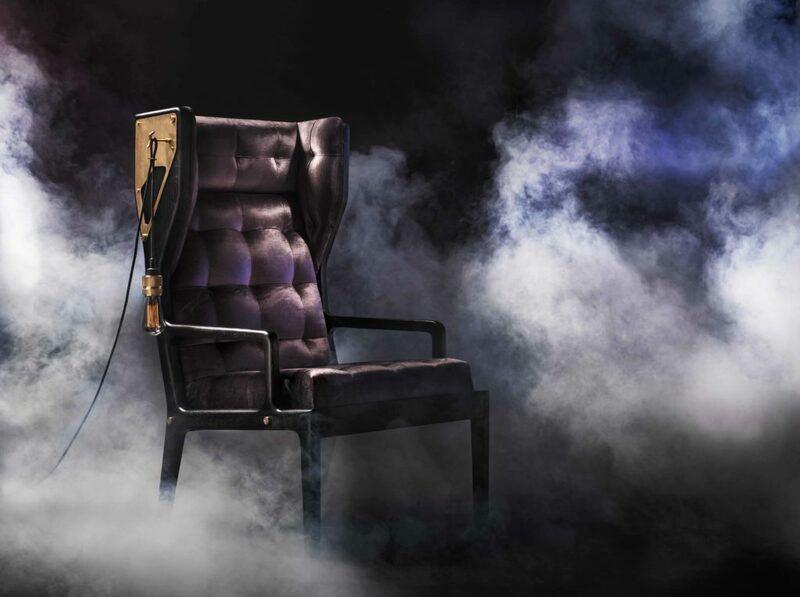 This may be one of the most expensive trends to follow on this list, but it will certainly be the biggest showstopper. 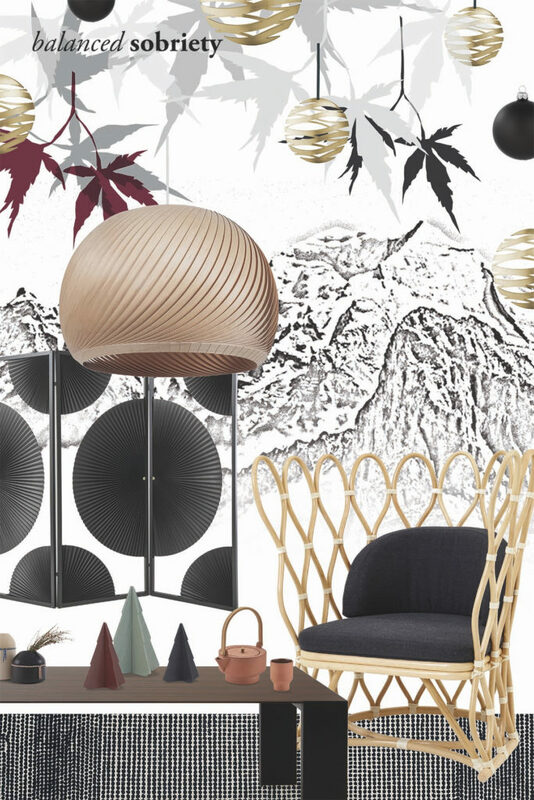 Have you heard of Nordic style already? 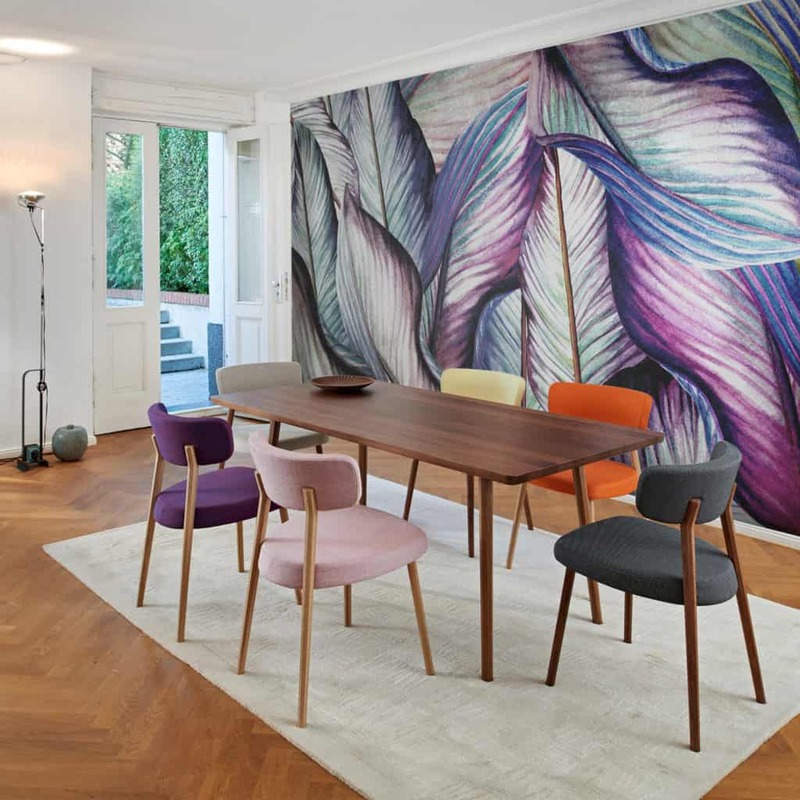 This is the main interior design trend that is currently big in the Scandinavian countries, such as Sweden. If you ever go to Sweden, you will notice that all of the homes appear extremely light, airy, and very spacious. 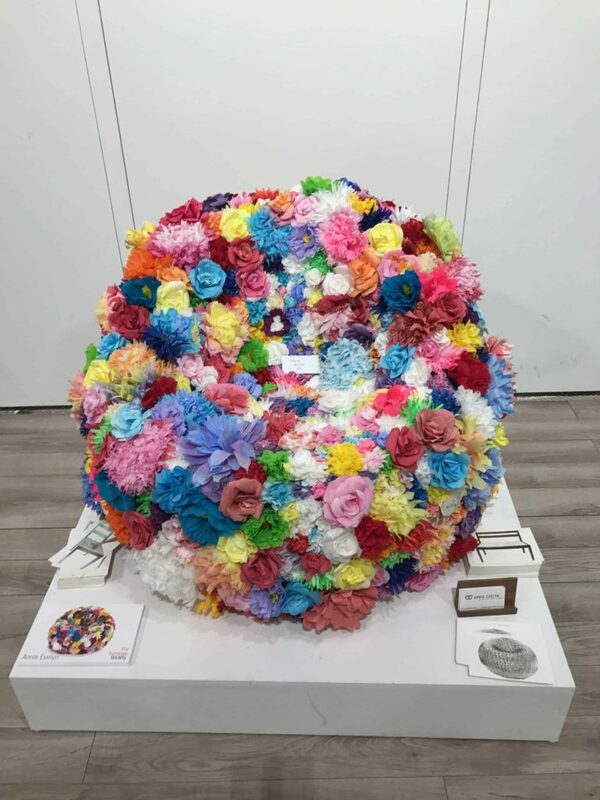 And that is all because of their use of light pastel colors in their designs. Plus, they use a lot of natural materials in their rooms, such as sheep-skin rugs and driftwood. 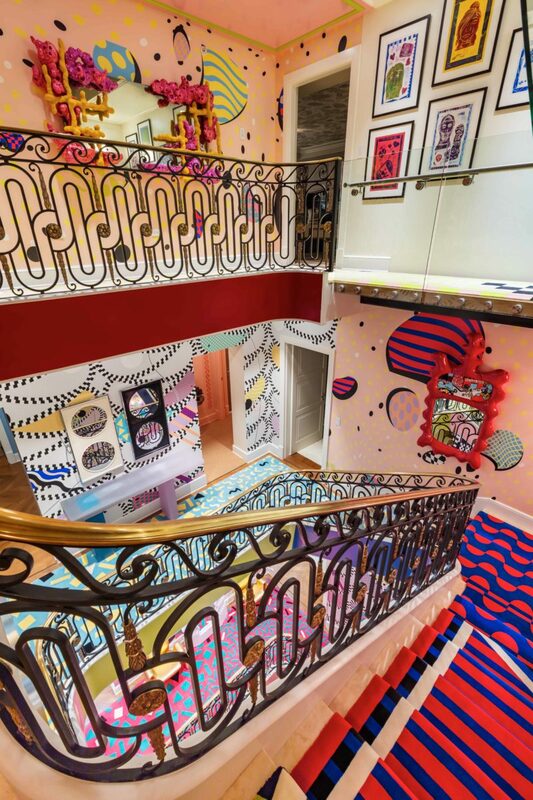 Hopefully, one of the above international design trends has filled you with some great inspiration. Let me know which one you are tempted to use in your own home! We do so much to ensure that our homes look great, but there is often one aspect that many homeowners regularly overlook. And that is how their rooms smell. This is often forgotten about because the only time we really notice any room odors is when they aren’t too pleasant. For instance, you’ll instantly pick up on bad pet smells and burning cooking, but you won’t notice it when your room’s scent is neutral. 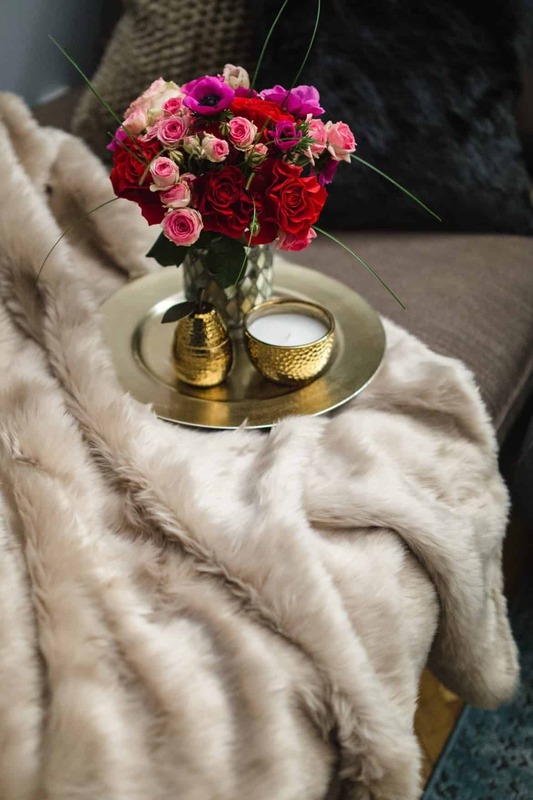 It’s such a great idea to bring in some nice fragrances to your rooms as they can really help set the atmosphere and ambiance. Not sure how to leave your rooms smelling as good as possible? 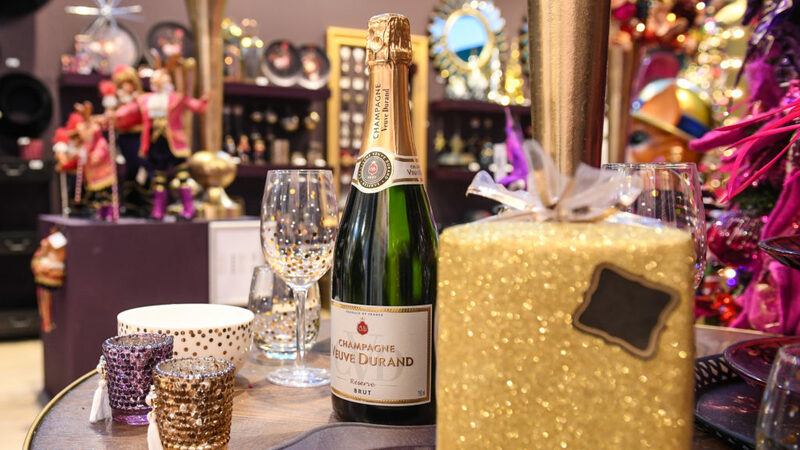 Here are some fab tips from fragrance experts. Fragrant candles and scent machines are both great for bringing in very nice smells into your rooms. 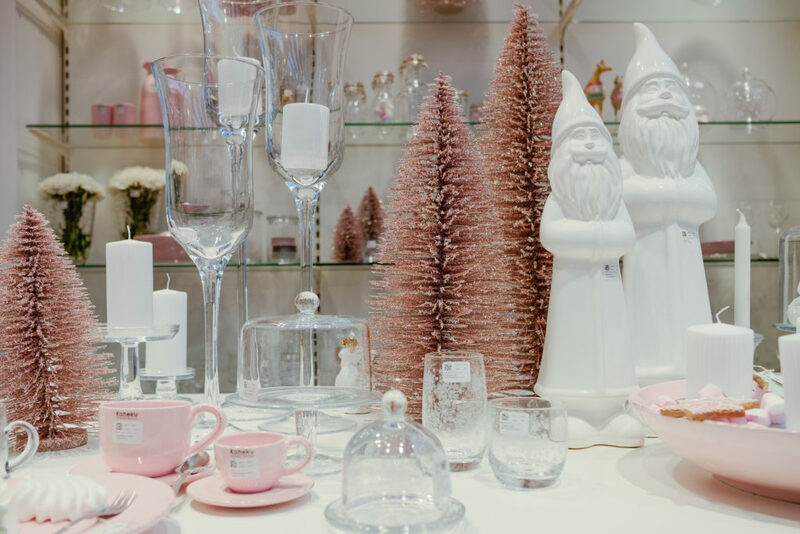 What’s more, you can often buy a wide range of different fragrances, so you should easily be able to find a diffuser or candle that suits your tastes. Just remember that these serve different purposes. For instance, scented candles are great if you have friends over and want to create a cozy ambiance. However, diffusers are a lot better if you want around-the-clock pleasant smells as you don’t have to watch them all the time, unlike candles. 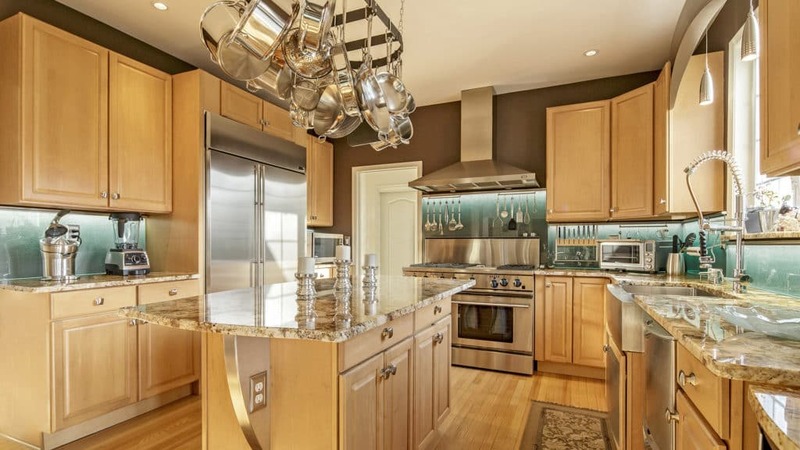 Do you find that it is often difficult to shift cooking odors from your kitchen? Or perhaps your bathroom always smells really stuffy because of all the use it gets from your family? 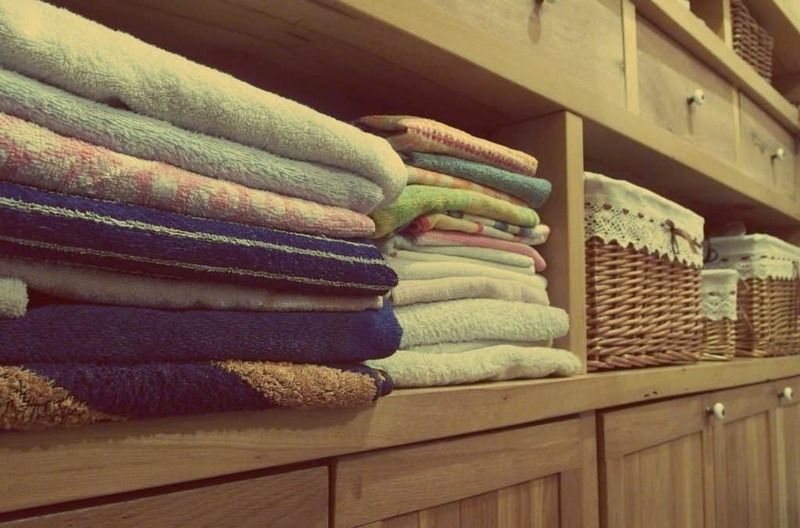 We all have problem areas in our homes that can often smell quite bad. 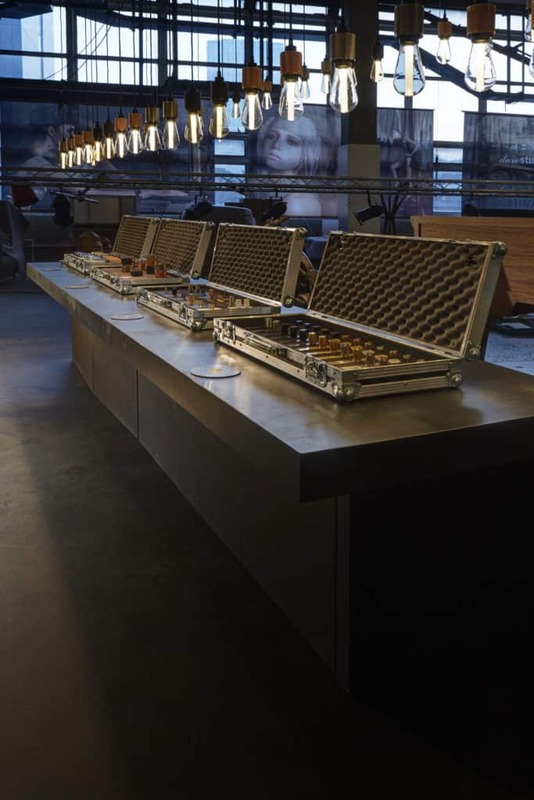 Thankfully, there is something you can do about them – you just need to add some extractor fans. 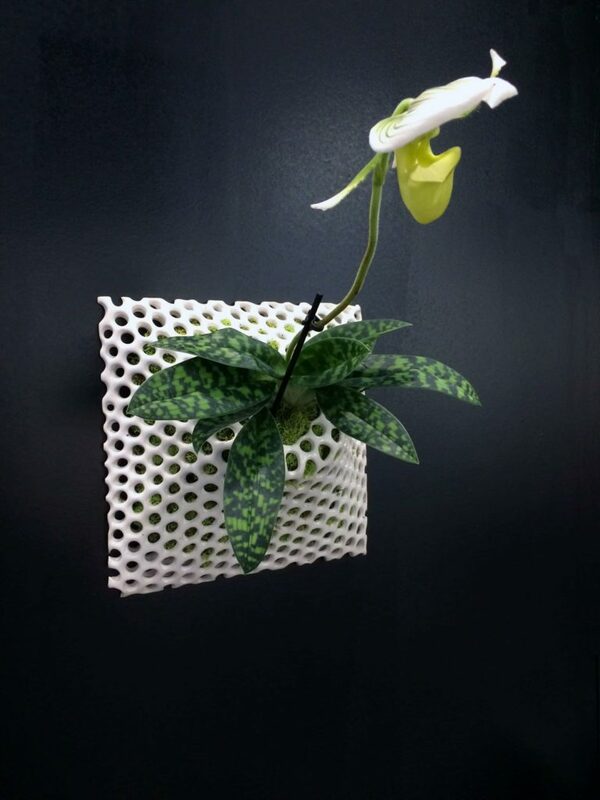 These will remove any bad odors from the air and will quickly freshen up the room. 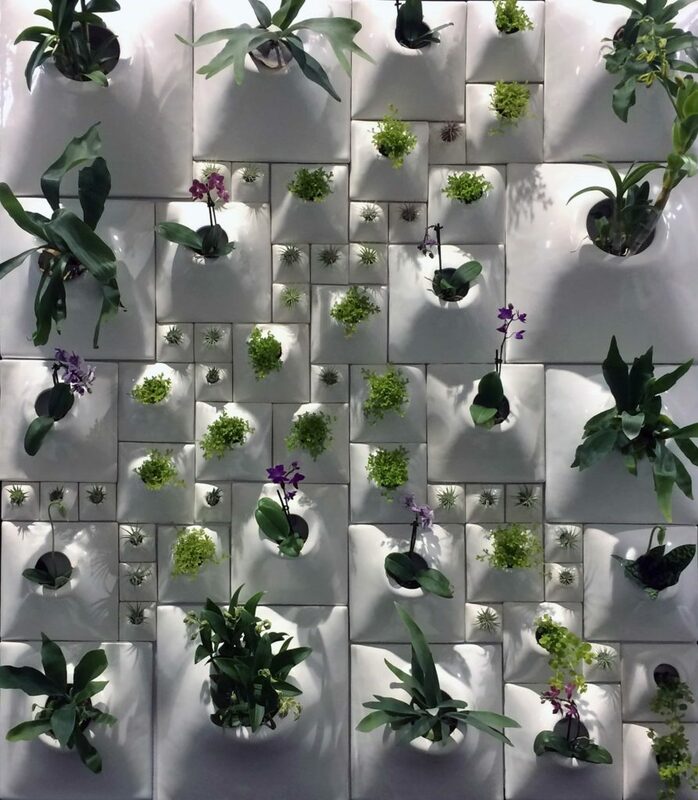 If you don’t want to buy any diffusers or scented candles, you can always bring some more houseplants and flowers into your rooms. 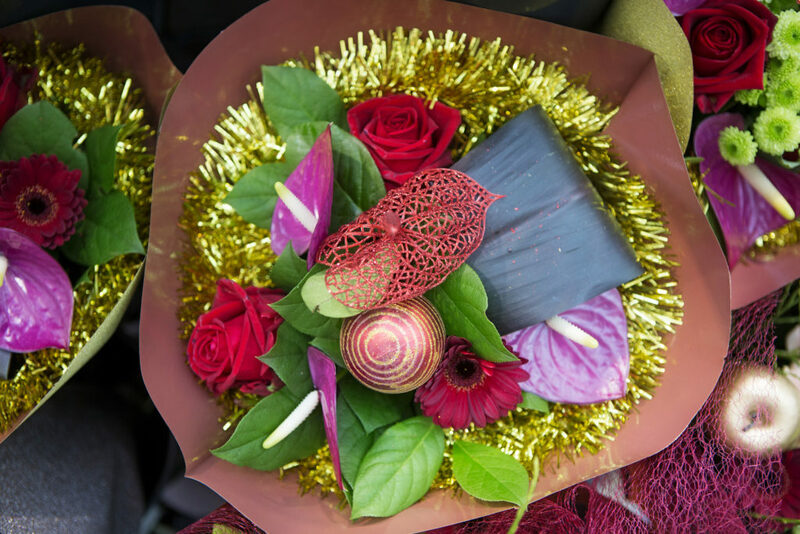 These will help keep your rooms smelling fresh and fragrant around the clock. Not only that, though, but some plants can even take some common toxins out of the air. That means you can be safe in the knowledge that your whole family is breathing the freshest of air at home. Some of the best houseplants that can improve your home’s air include peace lilies and bamboo palms. 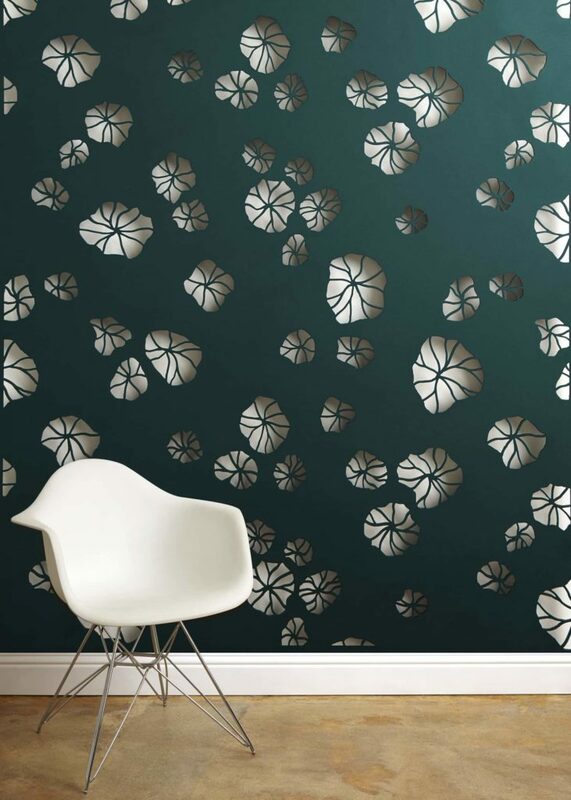 Plants aren’t the only natural scents that you can use in your home. You can also utilize the powers of lemons and limes. All you need to do is slice some citrus fruit and leave it in a bowl in the room that you want to freshen up. Their zesty fragrance will eventually fill the whole room! Herbs can also help, especially in the kitchen. A small indoor herb garden will fill your kitchen with lots of fresh fragrances! Plus, they’ll taste excellent in your cooking! 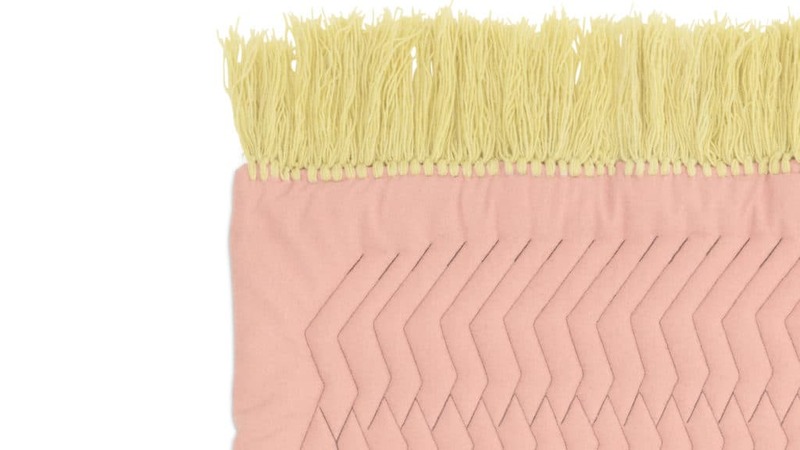 Once you use these tips, your home will never have smelt so great! 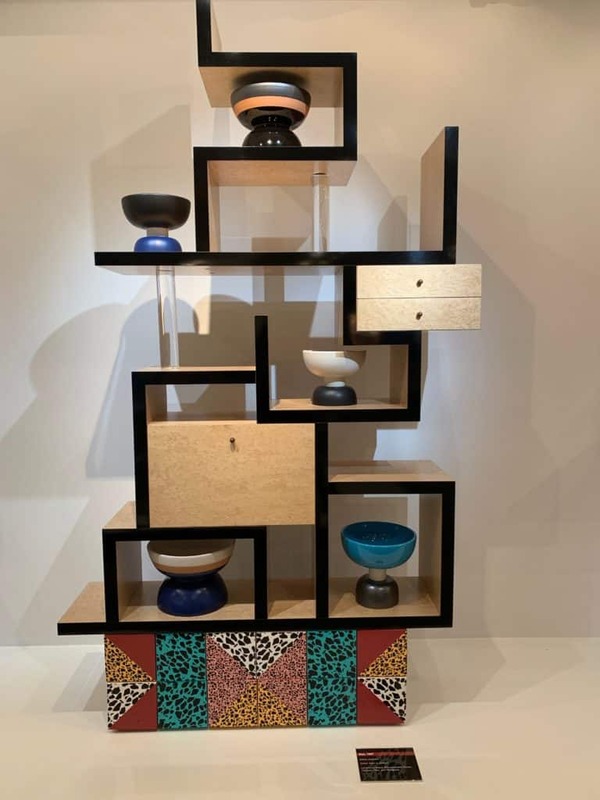 Learn how to make the most of your storage space in this article written by Karen LeBlanc for Interior Appeal Magazine. Click on the link below to read the full article. Note To Success, How Pretty Paper and the Handwritten Letter is Making a Comeback. 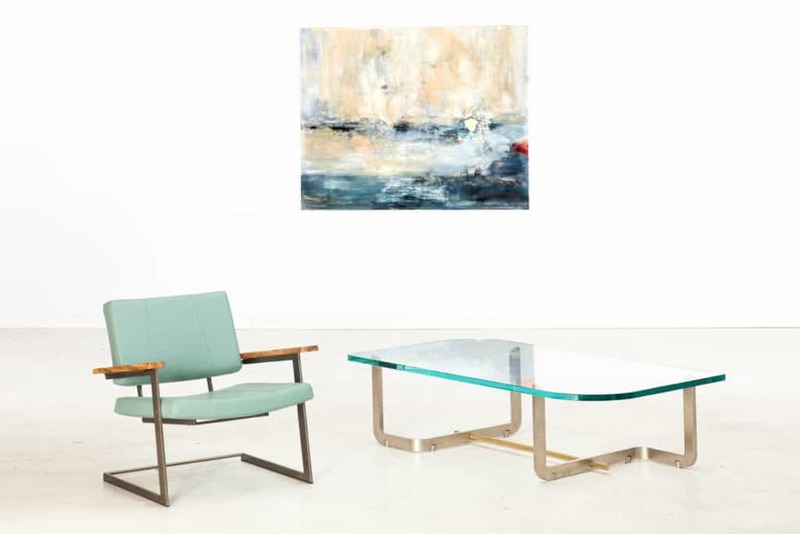 Click on the link below to read the full article by Karen LeBlanc appearing in Interior Appeal Magazine. My new contemporary kitchen gets its surface style from natural stone. 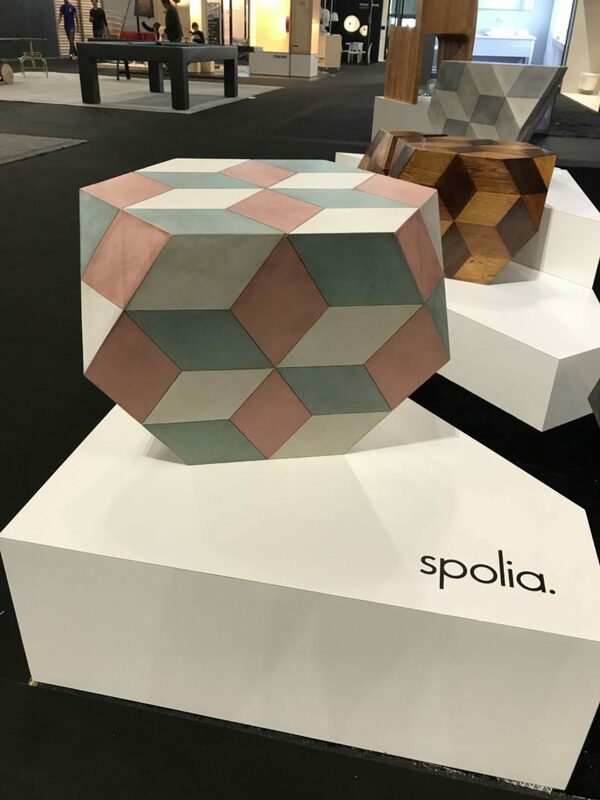 As a decorator, stone is my go-to material for its one-of-a-kind design— its unique colorations, patterns, timeless appeal and durability. My kitchen color palette is gray and white, so I naturally gravitate towards marble; however, the countertops, in particular the island top, are both workhorses and showpieces so I needed to select a stone that can stand up to food prep and daily dining. Madreperola quartzite from Brazil is a creamy and gray slab. Photo credit: MS International Inc. Quartzite is a very hard metamorphic rock that originated as sandstone. 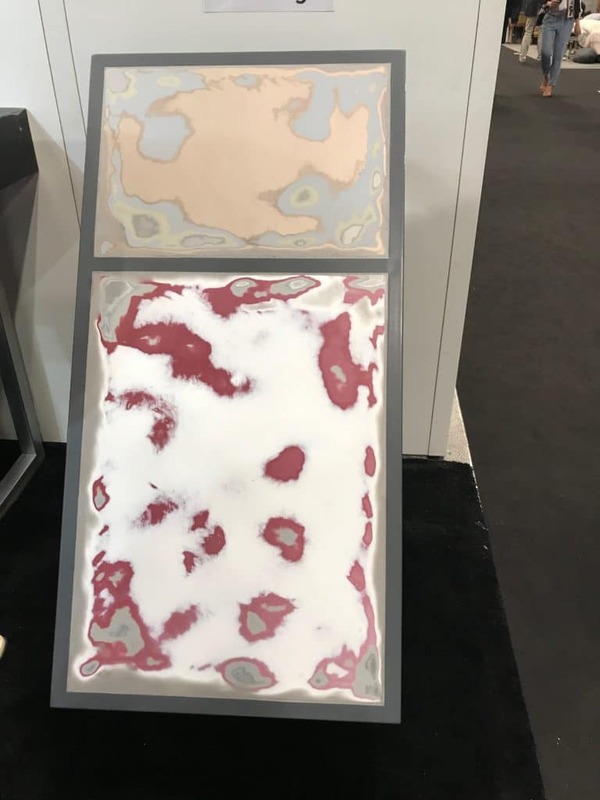 Through a process of high heating and pressurization sandstone is transformed into quartzite, an extremely strong and durable natural stone. 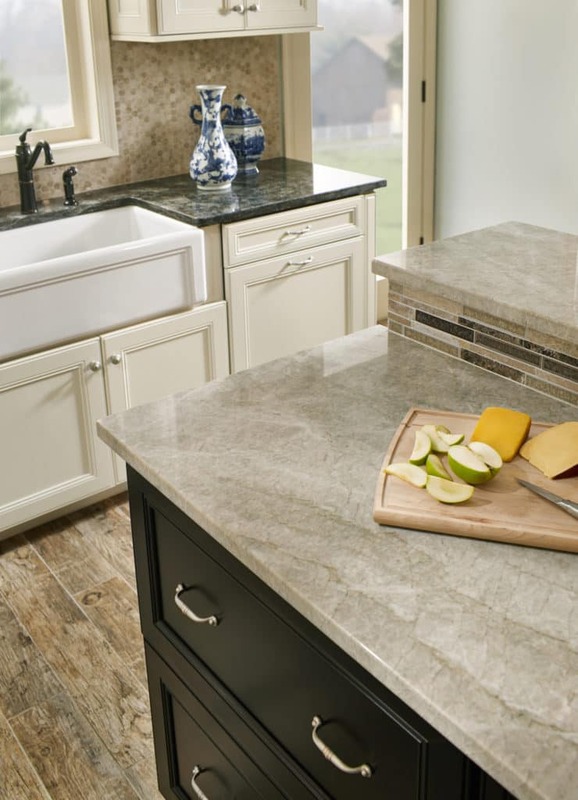 Quartzite is ideal for any countertop surface due to its strength and long-lasting composition. 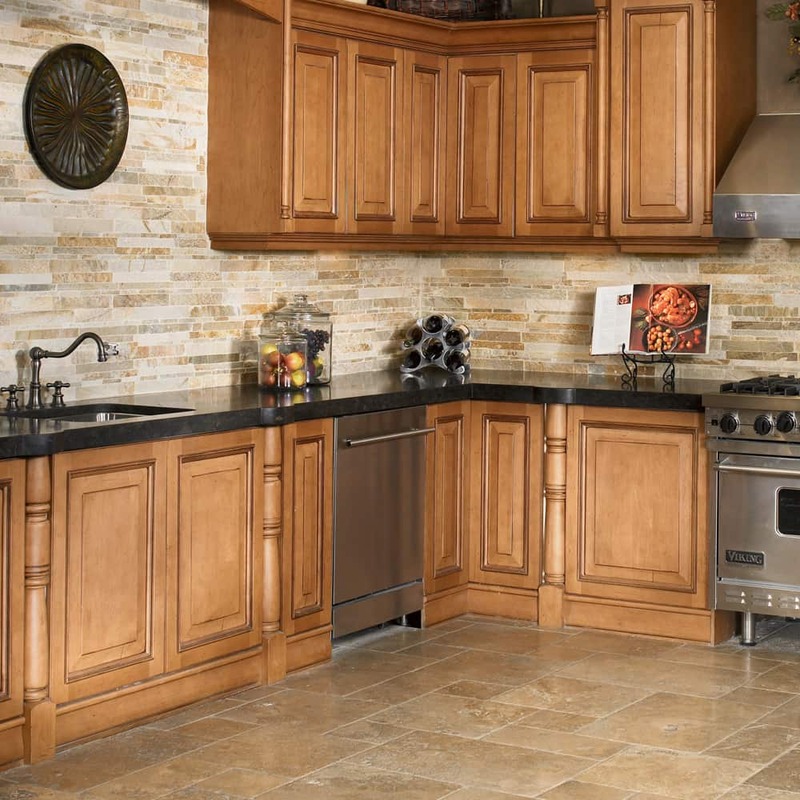 Consider quartzite countertops for their strength, beauty, and overall durability. 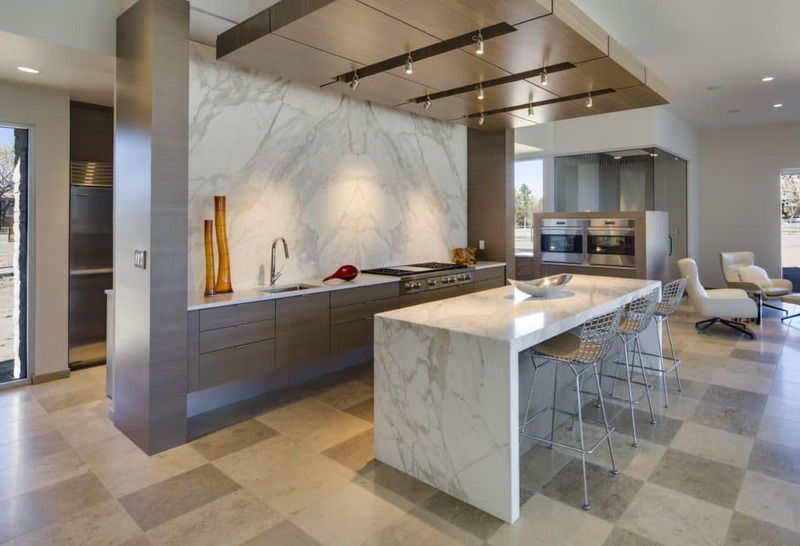 I was able to render the look of marble with the durability of granite by choosing quartzite. 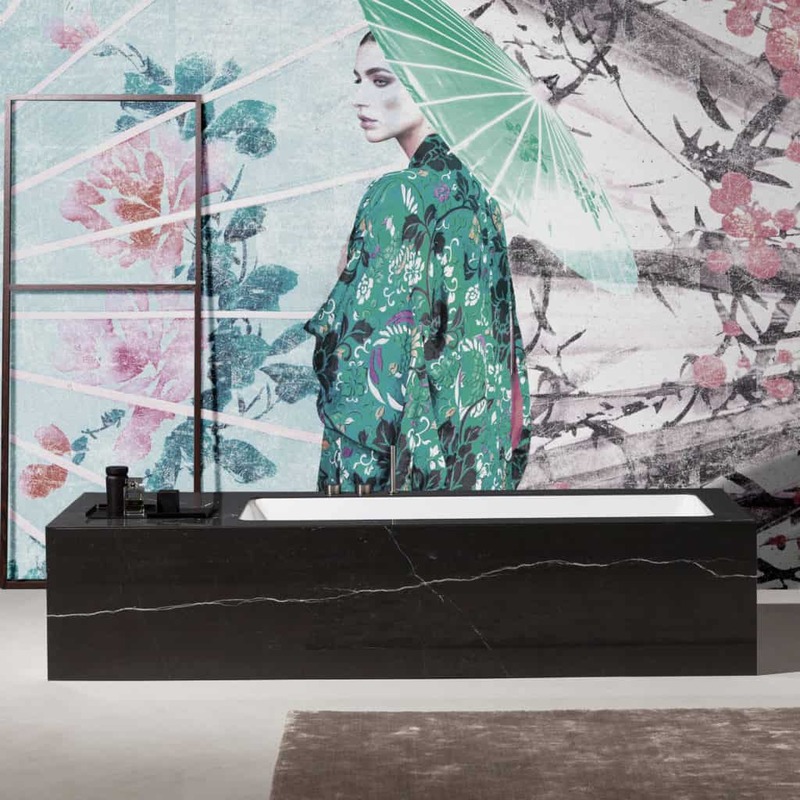 Quartzite is generally harder and denser with the classic marble veining. 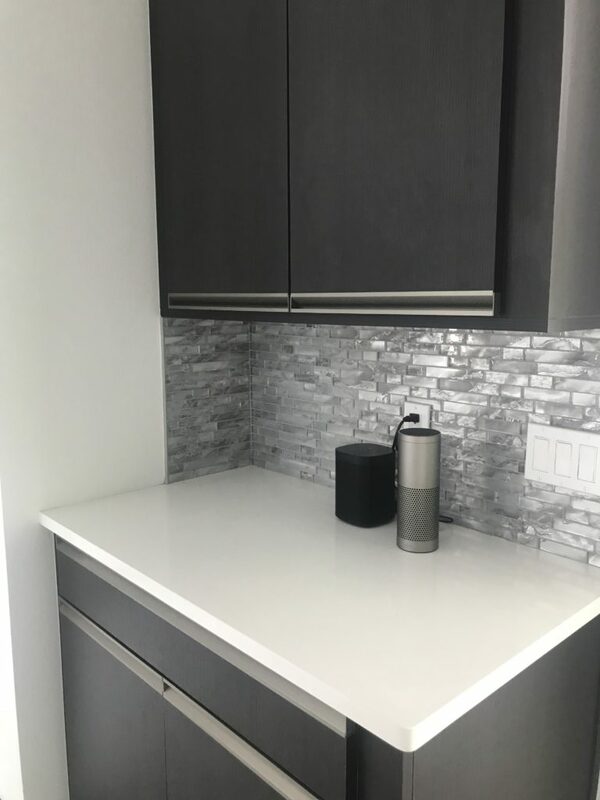 My kitchen floors are marble tile in a classic white with gray veining conveying a crisp, airy, contemporary style that compliments the rest of my interior design choices. My signature decor style tends to mix different types of stone in living spaces from flooring to fireplace surrounds and wall inserts. 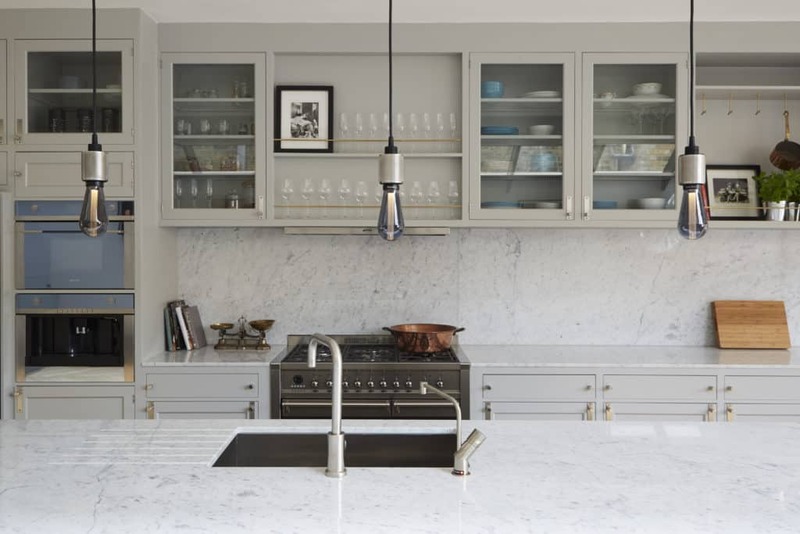 Natural stone works well with any kitchen—traditional, modern, rustic, transitional, industrial, and all the stylistic iterations in between, making it an ideal choice for a kitchen makeover. 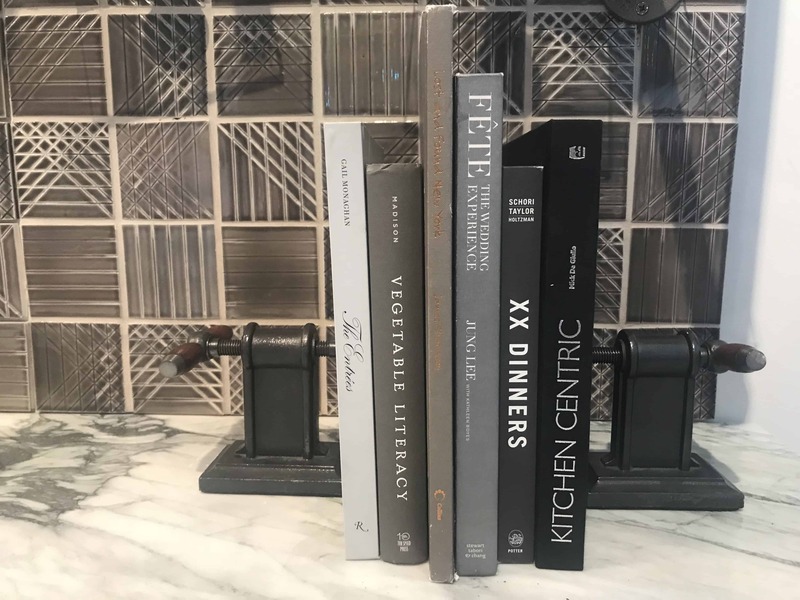 Here’s how I use natural stone as my creative muse in home decor and design for surface style in the kitchen. 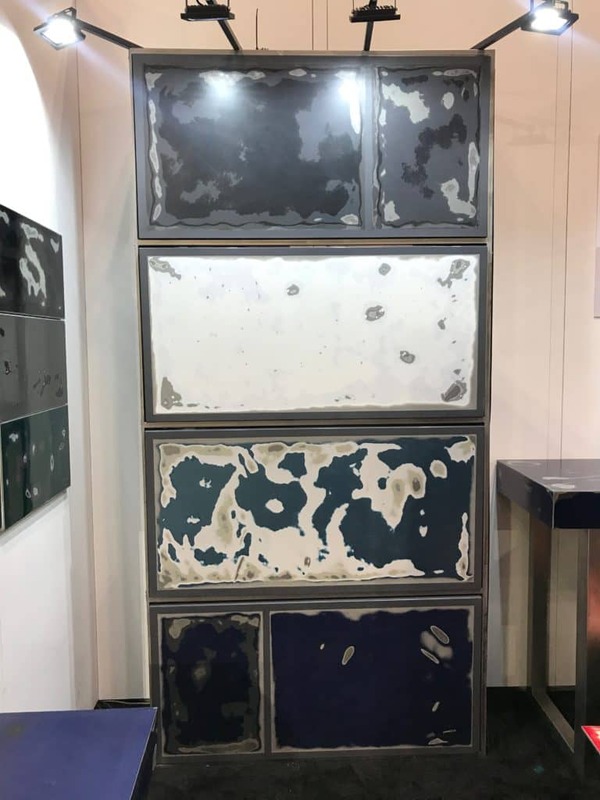 I like to create a focal point in the kitchen with a stone clad wall and niche that frames the range hood as a functional and sculptural element. 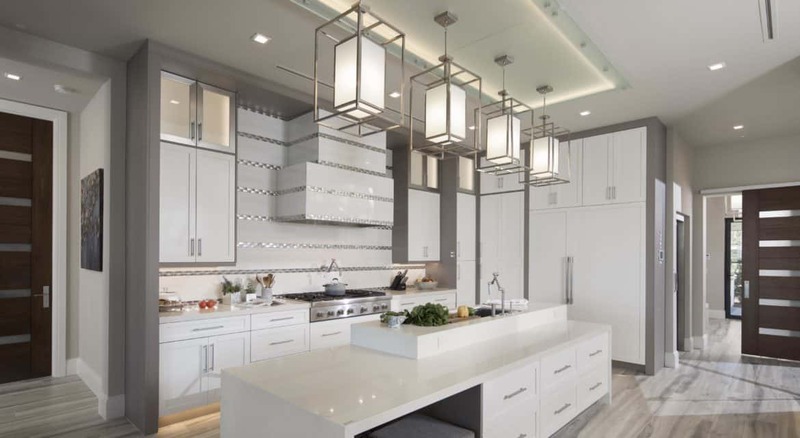 In this kitchen by Artistic Tile, the niche wall framing a stainless steel range hood is crafted of Calacatta Gold marble subway tile that complements the Calacatta Gold marble slab of the island top. The flooring is Ash limestone. 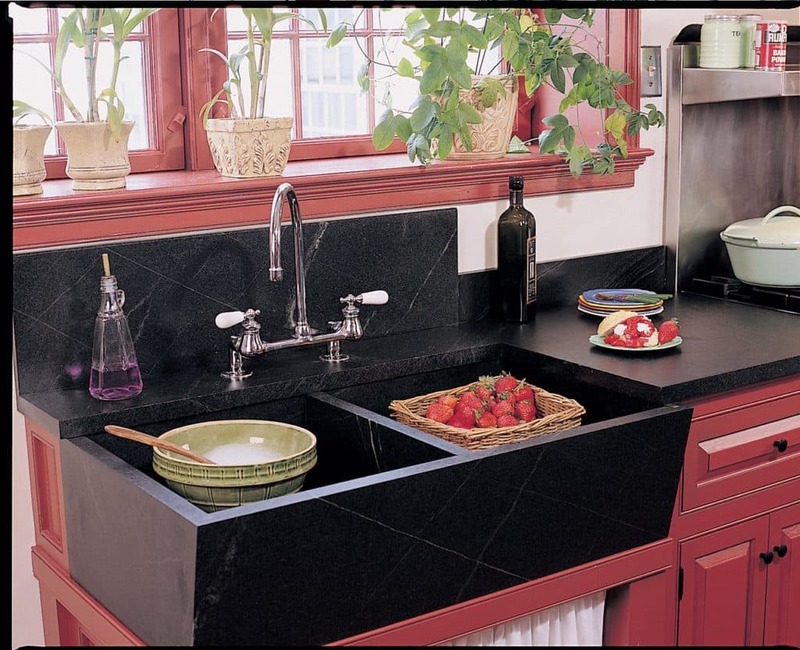 Natural stone such as soapstone is a sanitary choice for kitchen sinks because it’s non-porous so it doesn’t trap bacteria and it never stains. 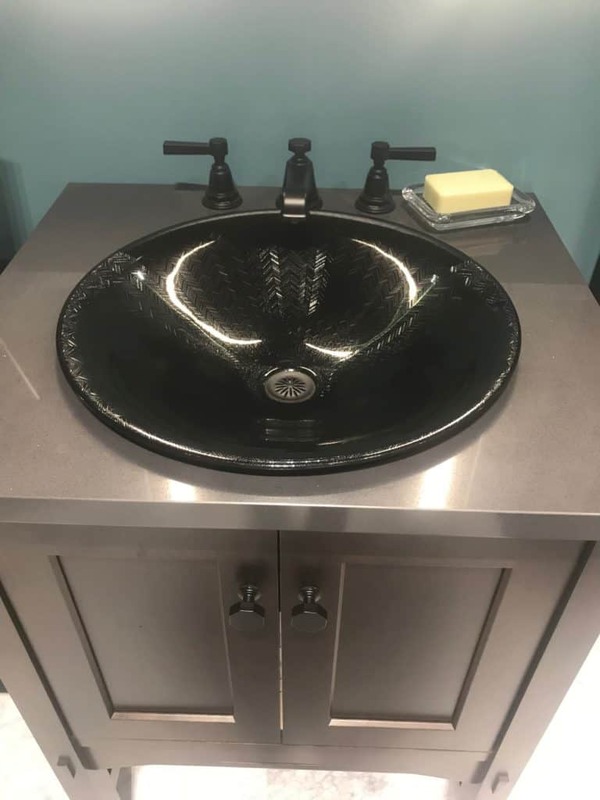 This Soapstone sink crafted by Vermont Soapstone, seamlessly blends with the adjacent countertops for a monolithic look. 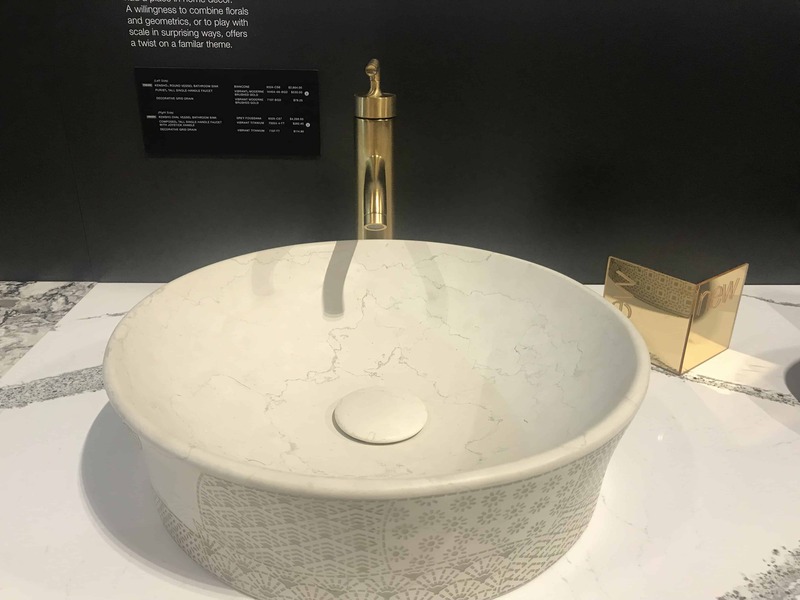 This deep sink’s apron front showcases the veining and colorations. 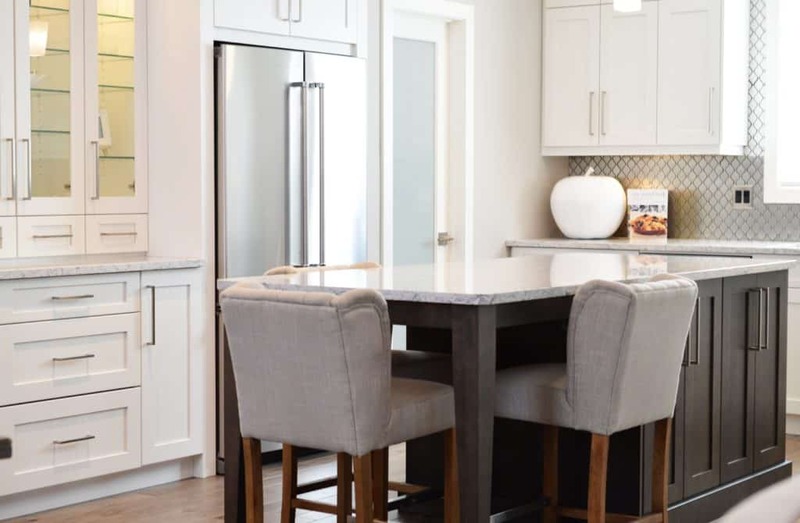 A built-in niche to charge cellphones, accommodate a laptop or other smart device is on the must-have list of today’s kitchen renovations and new construction. 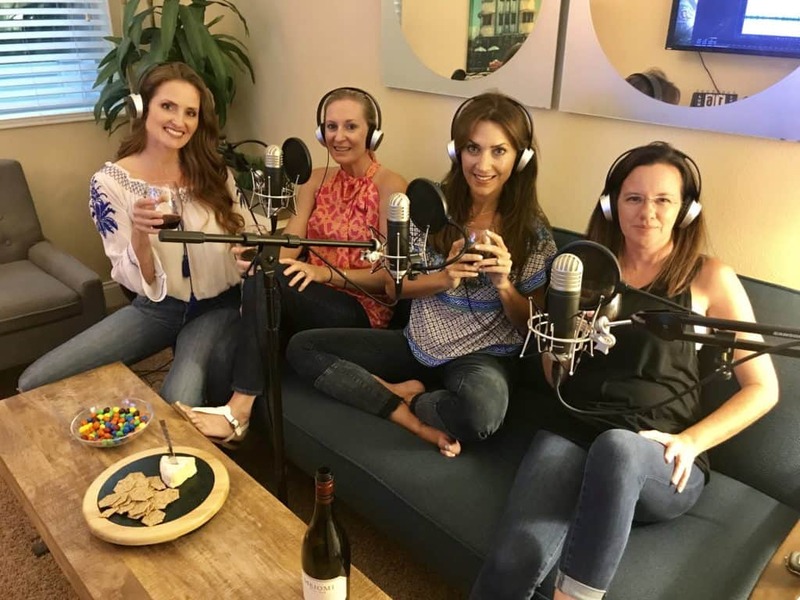 Now more than ever, the cook is connected to technology, consulting smart devices for recipes and in need of a place to organize household paraphernalia. 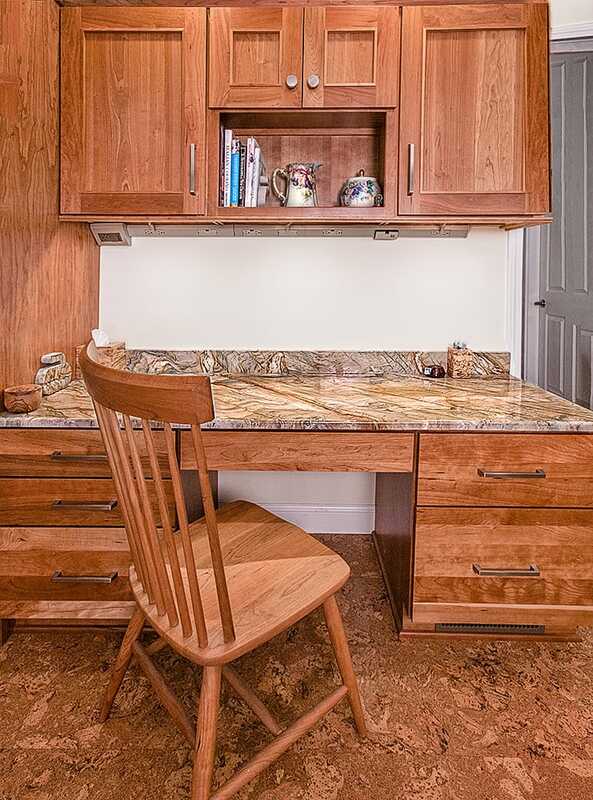 Ripano Stoneworks designed a pocket office in this kitchen with a granite desk top that matches the perimeter counters for style and function. 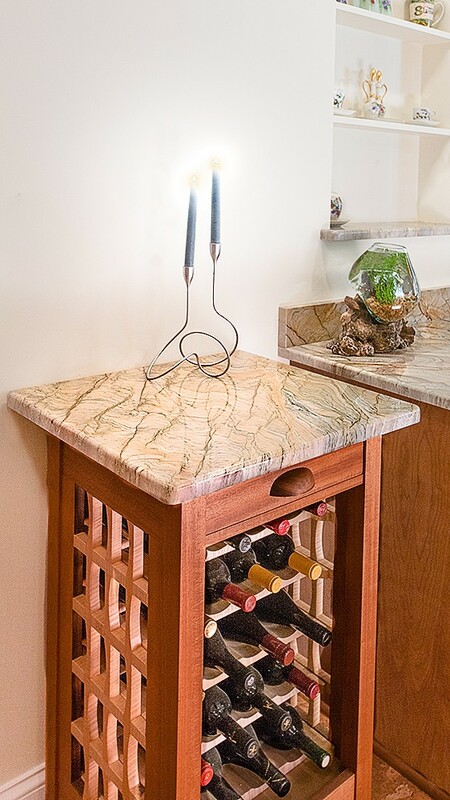 A wine rack designed to match kitchen counters and cabinets adds a custom touch with natural stone. 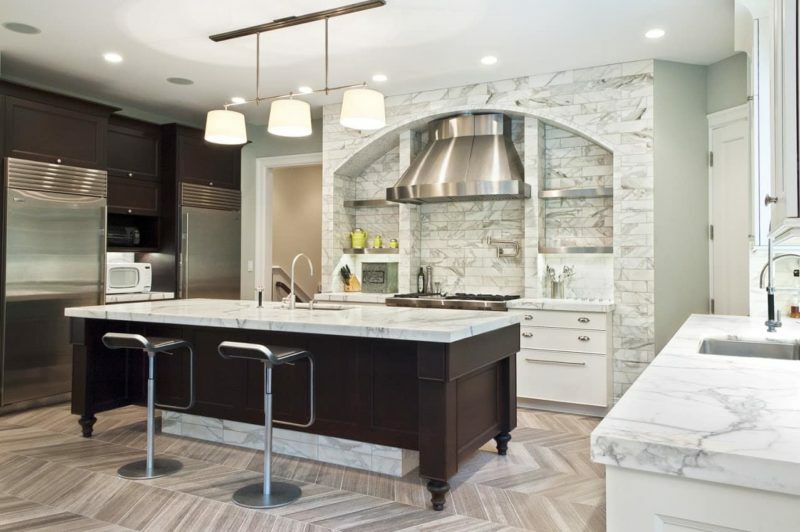 This one from Ripano Stoneworks showcases a quartzite top and wood storage rack that looks as if it’s an extension of the adjacent countertop and base cabinets. 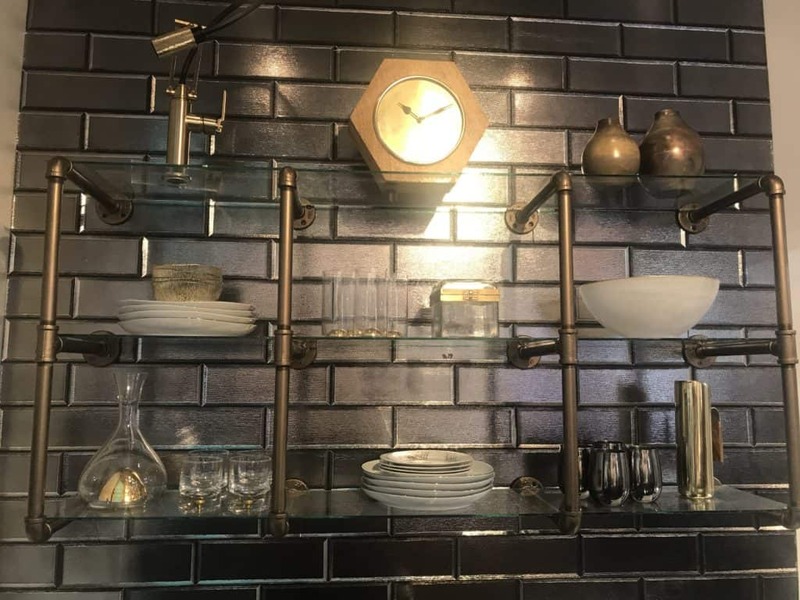 This wine storage rack showcases a quartzite top that matches the kitchen counters. 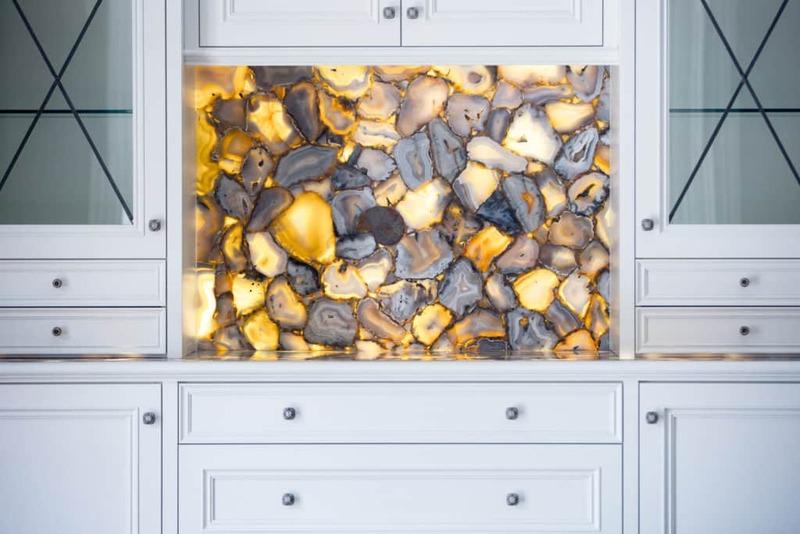 Natural stone has many uses as design features including fireplace surrounds, bar tops, desk tops, fireplace surrounds. Photo credit: Ripano Stoneworks. 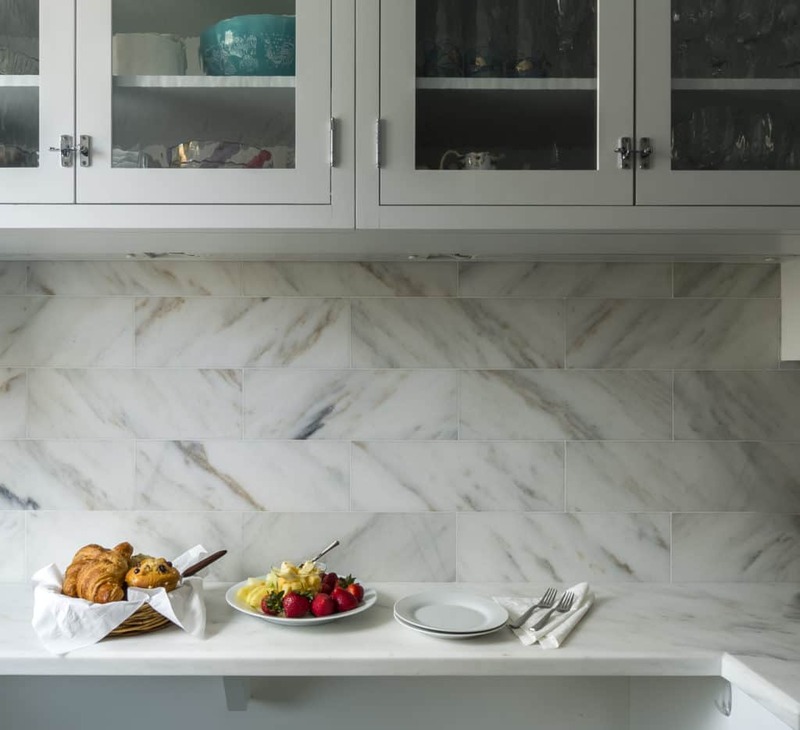 Kitchen backsplash crafted of Danby Imperial marble with matching counters cues a crisp, clean, elegant look. 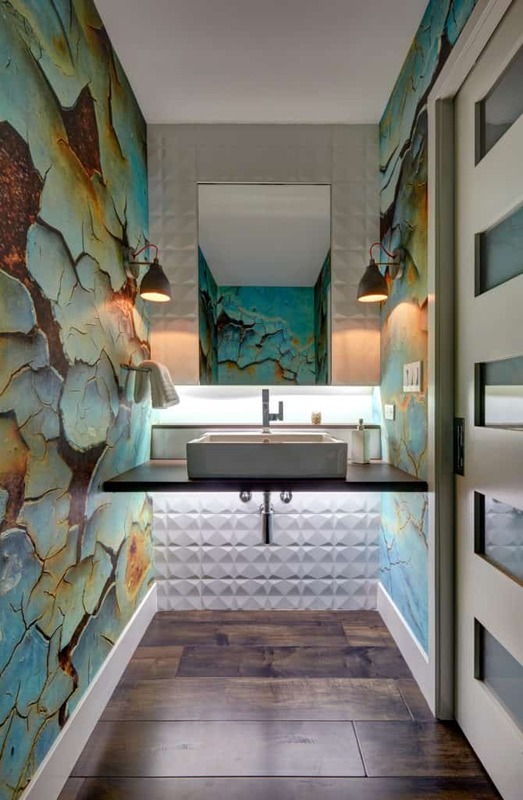 Photo credit: Artistic Tile. 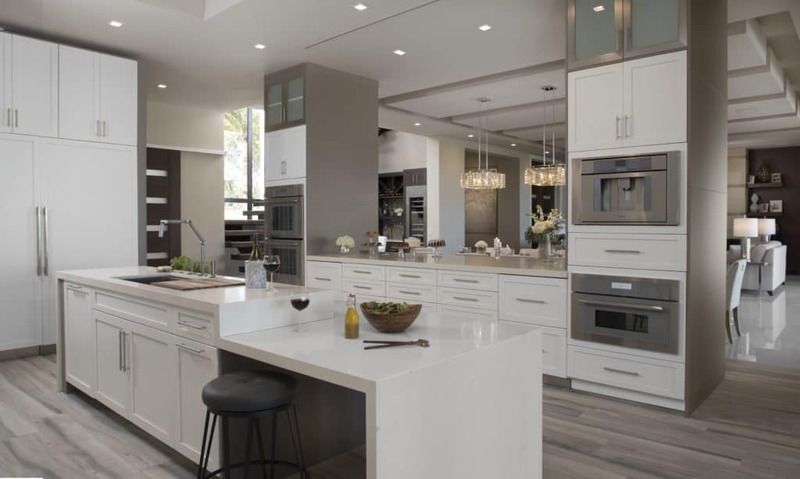 Natural stone is a popular choice for the island countertop tying together the look as a focal point and command central for the cook. 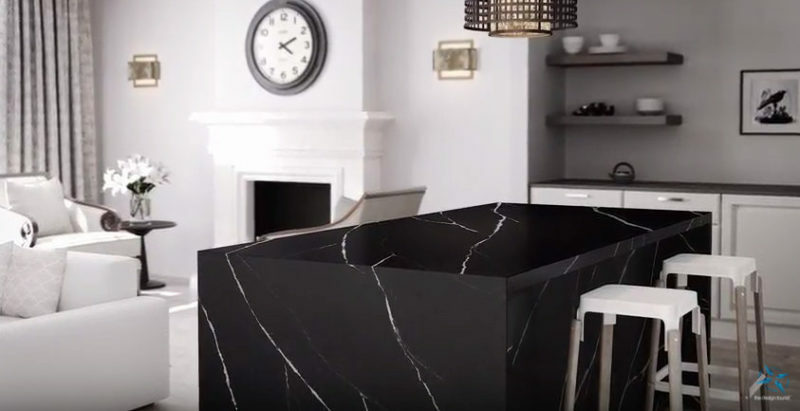 The latest kitchen island designs incorporate a countertop with an overhang for seating, a sink, dishwasher and/or a cooktop. 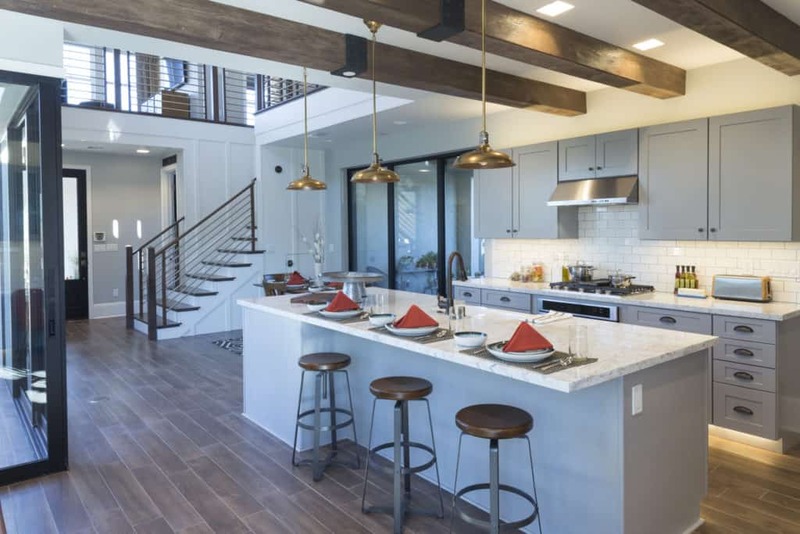 The island countertop can either match or contrast with the perimeter counters. 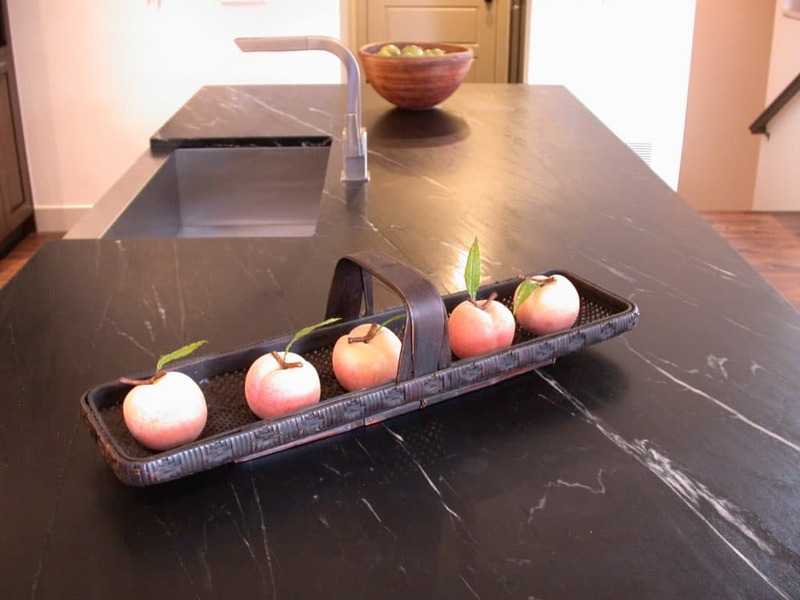 Island countertop crafted of soapstone from Dorado Soapstone. 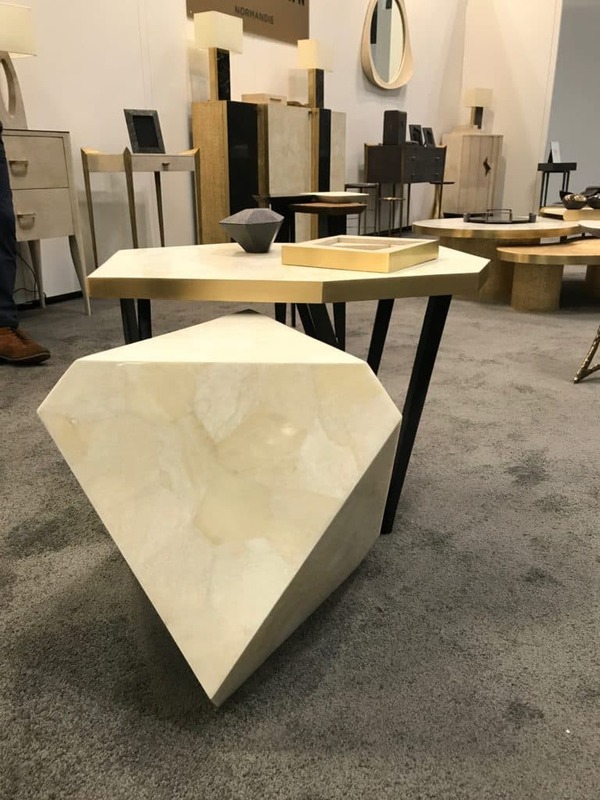 This natural stone is siliceous – nonporous so it is unaffected and unharmed by acids contained in everyday substances like wine, lemon, and vinegar making it an ideal choice for food prep areas. Photo credit: Dorado Soapstone. 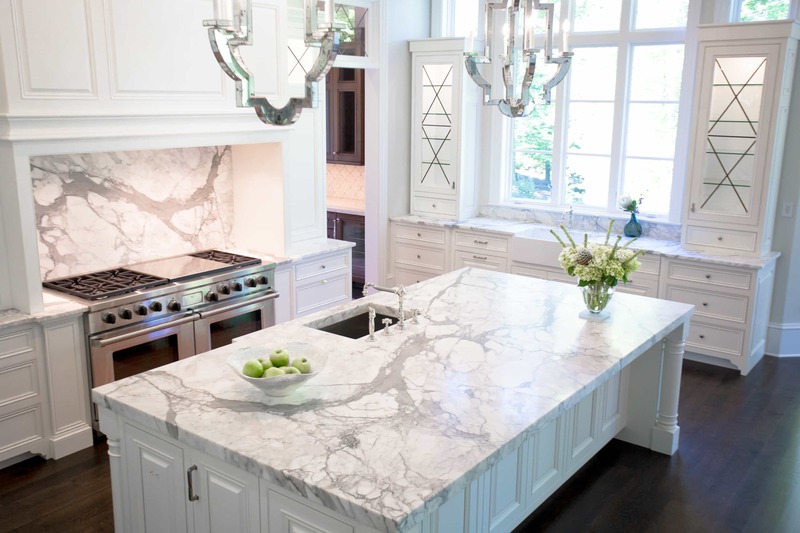 Calacatta Gold marble creates a wraparound kitchen island top and oversized backsplash in this contemporary kitchen. Photo credit: Rocky Mountain Stone. 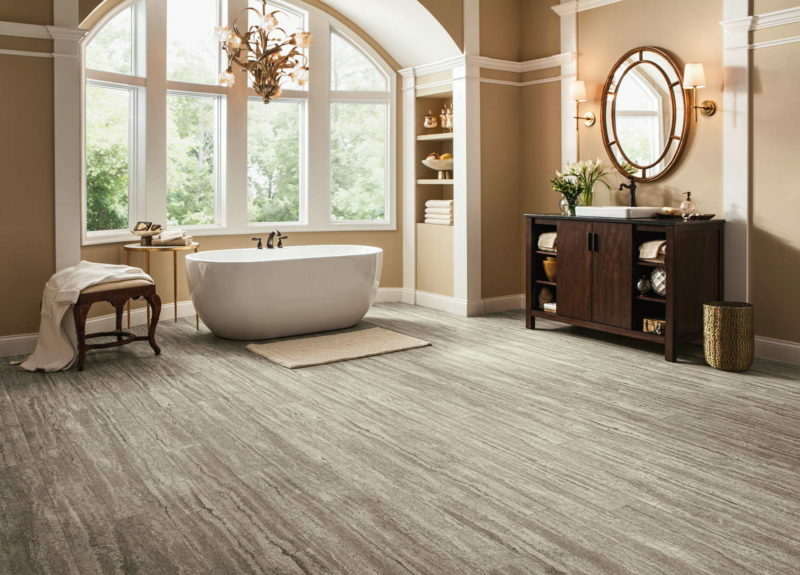 Natural stone is a timeless, trend-proof choice for flooring and provides the durability to endure high traffic areas. 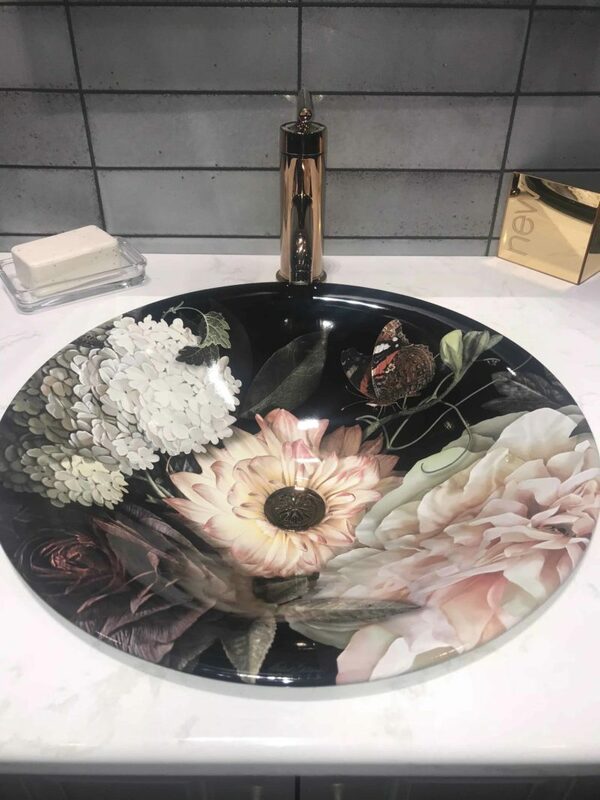 To preserve its look and luster, natural stone, unlike porcelain and ceramic tile floors, can be polished, resurfaced and resealed extending its life. 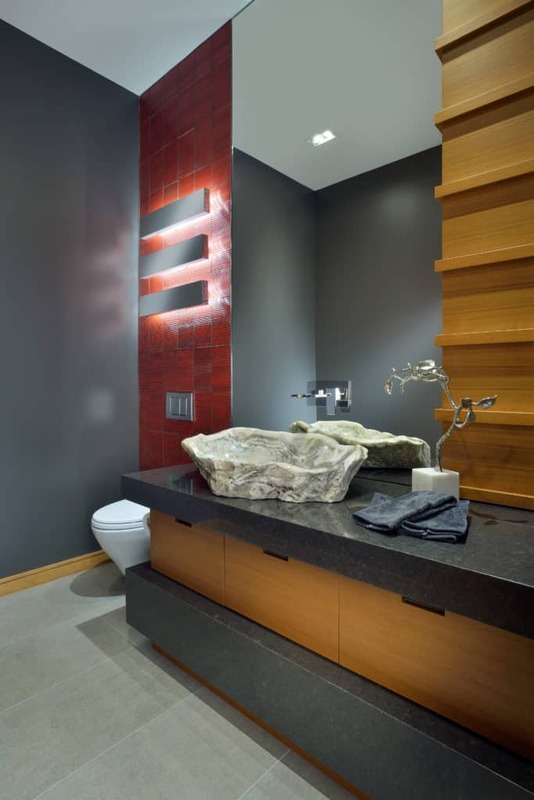 There are many different finishes for stone flooring to choose from. 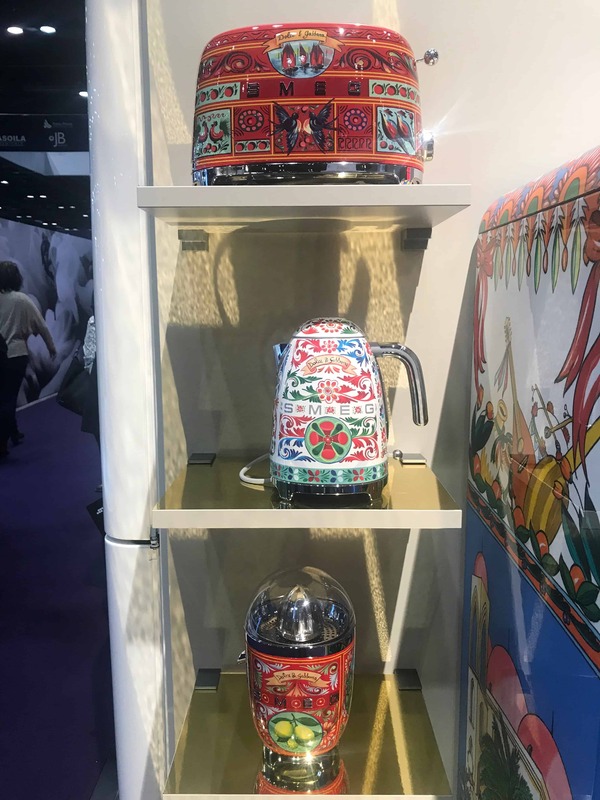 Polished is a smooth, glossy, highly reflective surface. Honed is a smooth, satin-like matte finish. Brushed is a slightly rough surface with an aged or antique look. 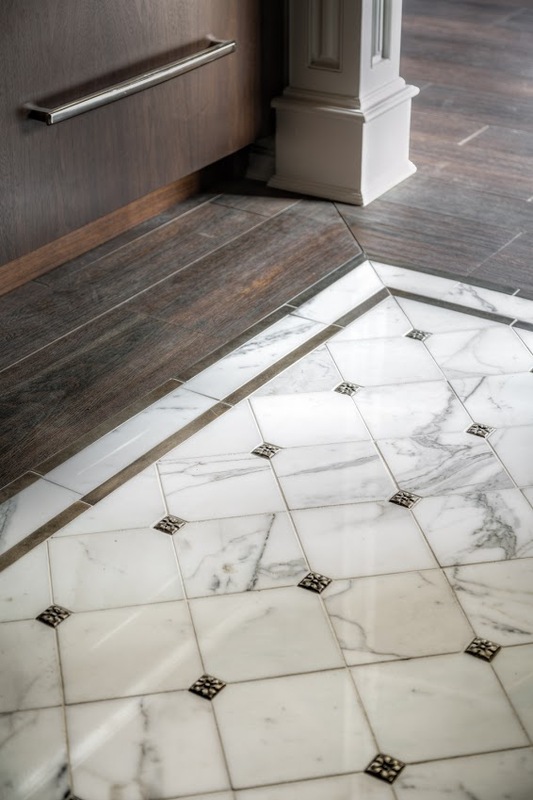 Tumbled is a smooth surface that looks weathered and scuffed. 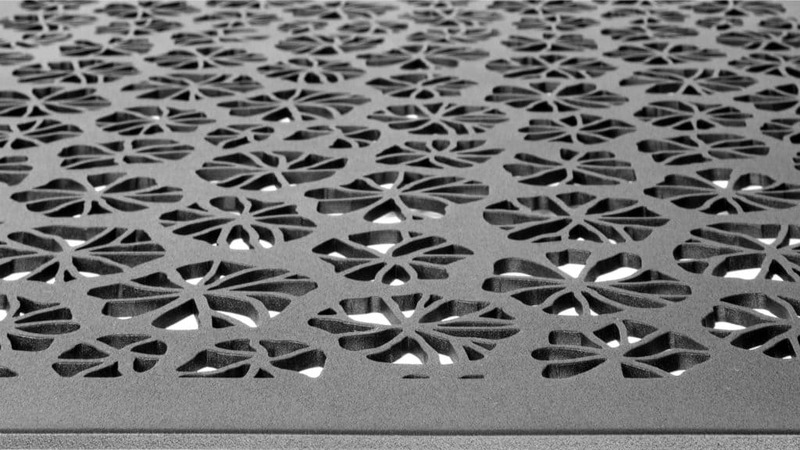 Bush-hammered is a fairly smooth, non-slippery surface ideal for outdoor applications. 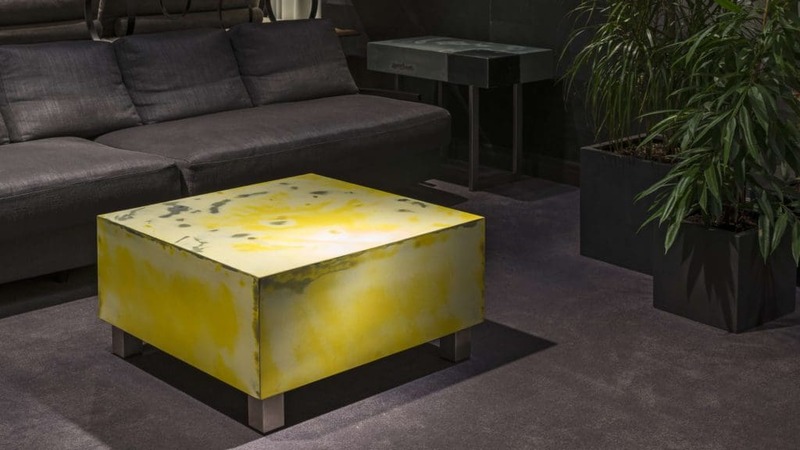 Leathered is a suede-like appearance and feel with a soft non-reflective shine. 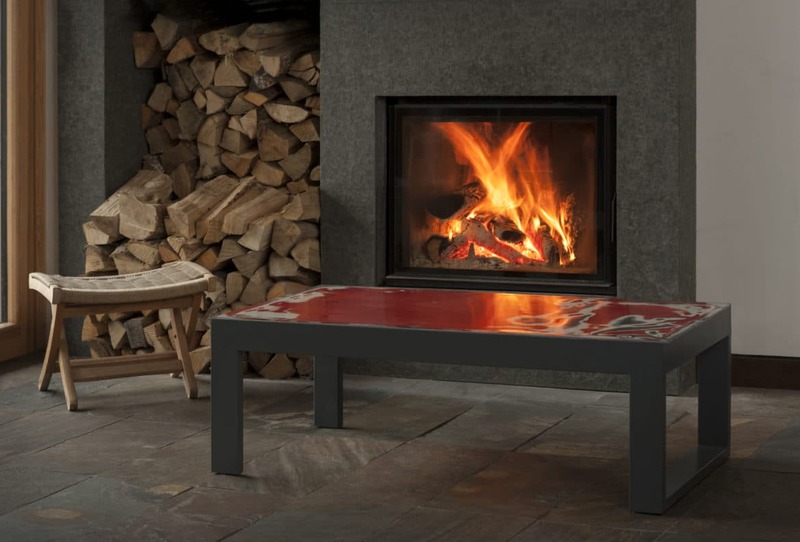 Flamed is a rough texture and relief with a non-slippery surface ideal for outdoor applications. Sandblasted is a textured surface with a matte gloss so the stone looks weathered. 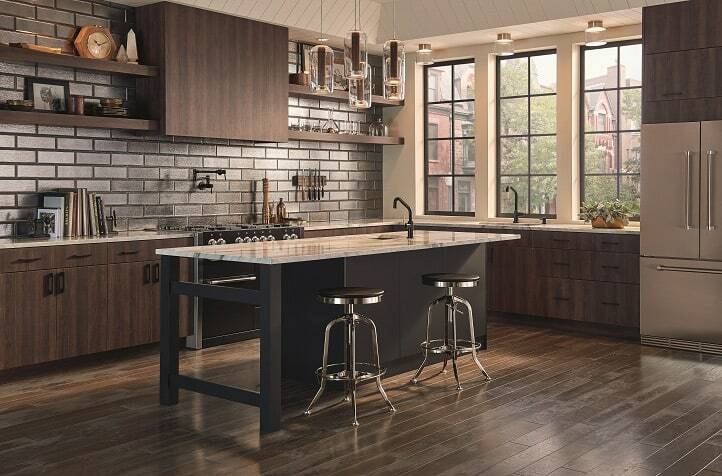 The latest kitchen styles mix stone materials, colors and patterns in counters and island tops. This kitchen by Stoneshop pairs Silver Pearl leathered granite on the perimeter counters with Mont Blanc honed quartzite on the island top. 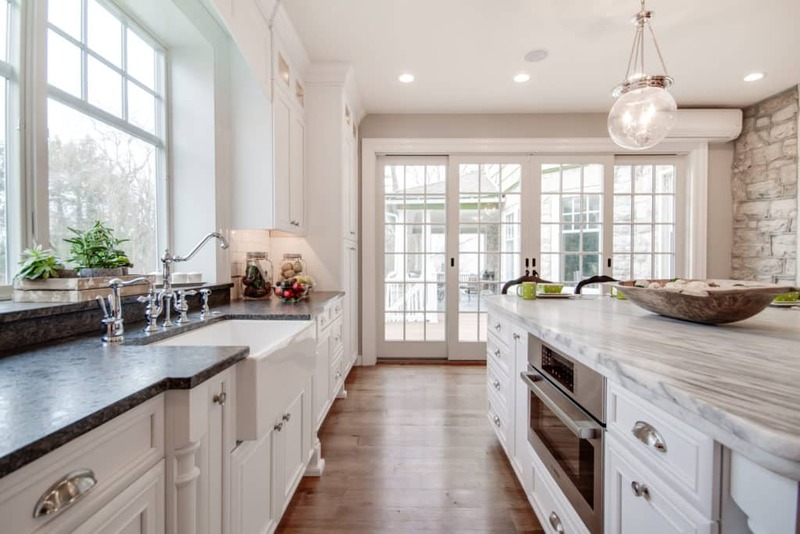 Matching island top and perimeter counters cue a transitional look in this kitchen. Photo credit: Flemington Granite & Architectural Supply. Thanks in part to MIA+BSI: TheNatural Stone Institute for sponsoring this post. 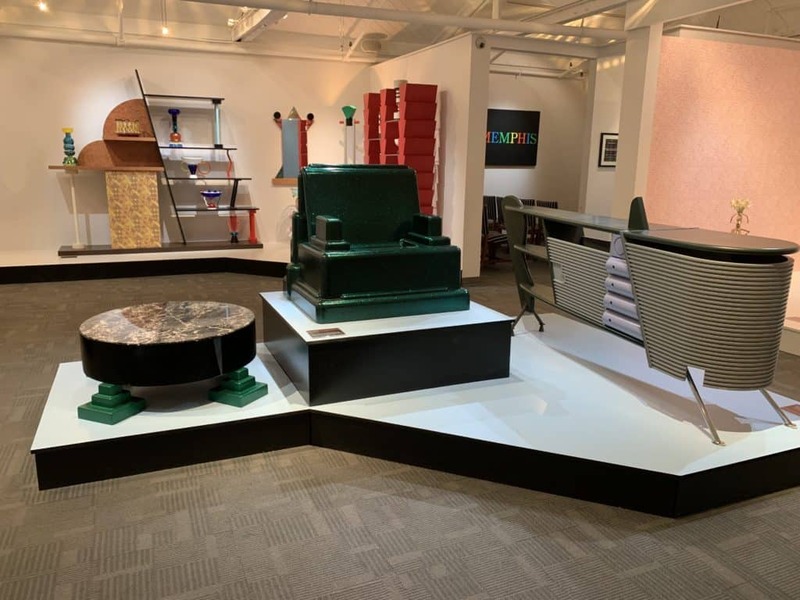 The word “green” as it relates to the home, typically signifies environmentally-friendly features as opposed to its literal meaning as a color. 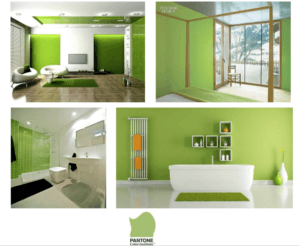 In 2017, green returns to its literal roots in home interiors as Pantone’s Color of the Year—Greenery 15-0343 to be precise. Pantone describes “Greenery” as a fresh and zesty yellow-green shade that evokes the first days of spring, the flourishing foliage and the lushness of the outdoors with fortifying attributes that signal consumers to take a deep breath, oxygenate and reinvigorate. 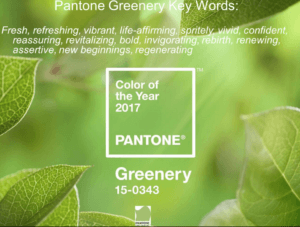 This hippy vibe and holistic, new age sounding rhetoric surrounding Pantone’s 2017 Color of the Year as “symbolic of new beginnings” and “a life-affirming shade,” (Pantone’s own words) is enough to make more mainstream tastes shy away from the shade. 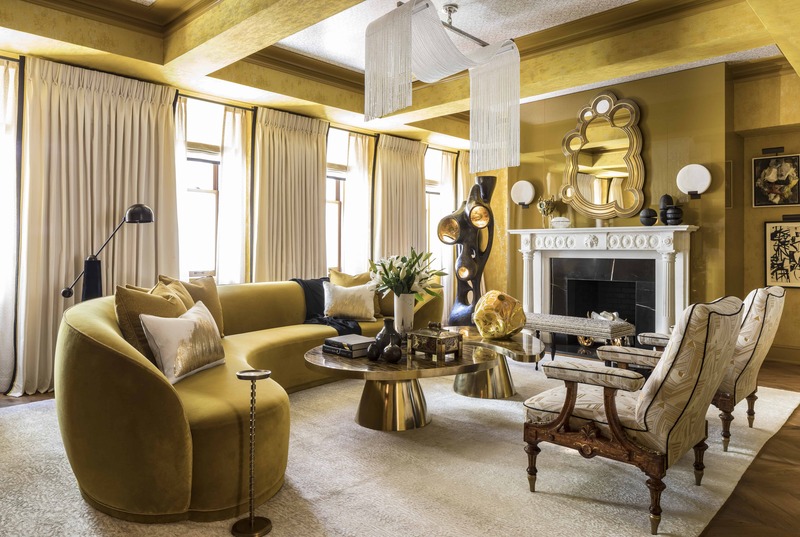 Since the 1920s, yellowish green has cycled in and out of style in fashion and home interiors. 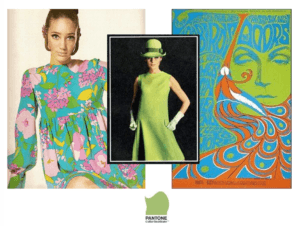 In the 1960s, consumers embraced psychedelic yellows and bright greens inspired by pop art. 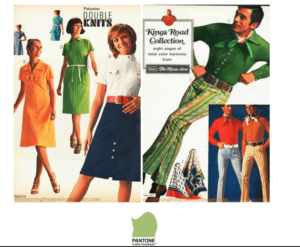 The 70s popularized yellow greens in day glo colors. The recent Spring 2017 fashion runways debuted plenty of bright yellow-green couture. 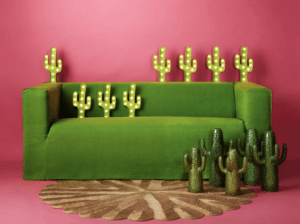 We can reminisce and wax poetic about the color green, but in reality does it translate to walls, furniture, fabrics and decorative accents in today’s home? The answer is yes, but not in ways you would expect. 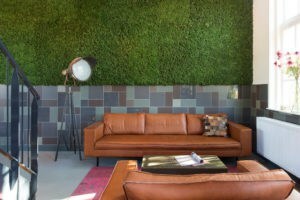 Instead of green painted walls, homes are integrating living walls and moss walls as design elements. 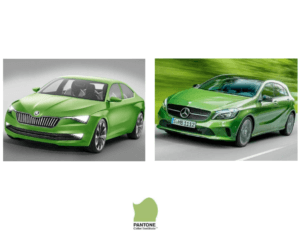 People also are getting their green fix from consumer products in shades of green ranging from coffee makers to luxury cars. 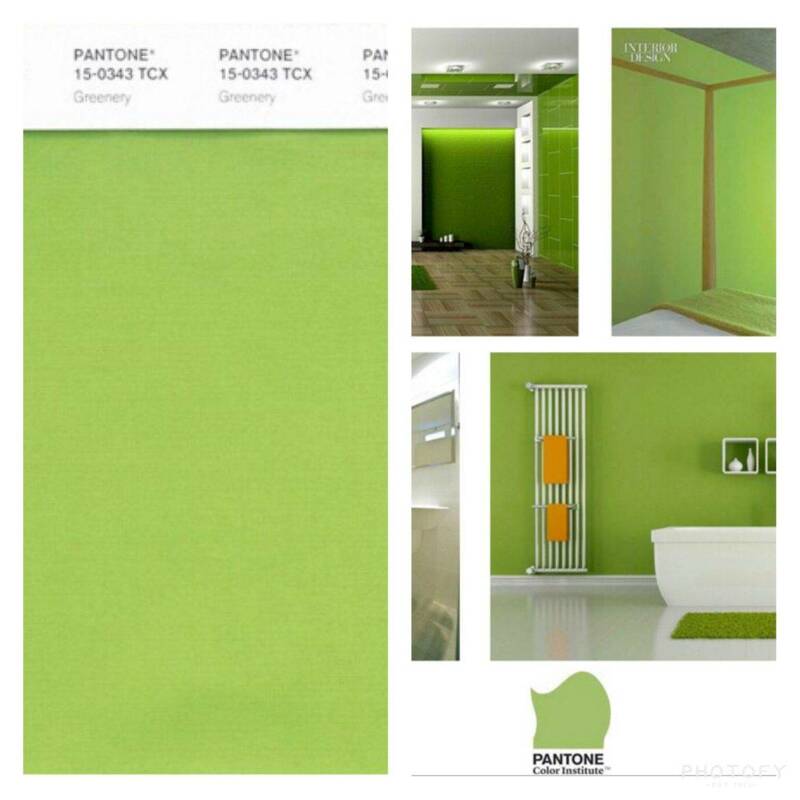 “Green is emblematic of its time, crossing all areas of design to express the mood and attitude of consumers. 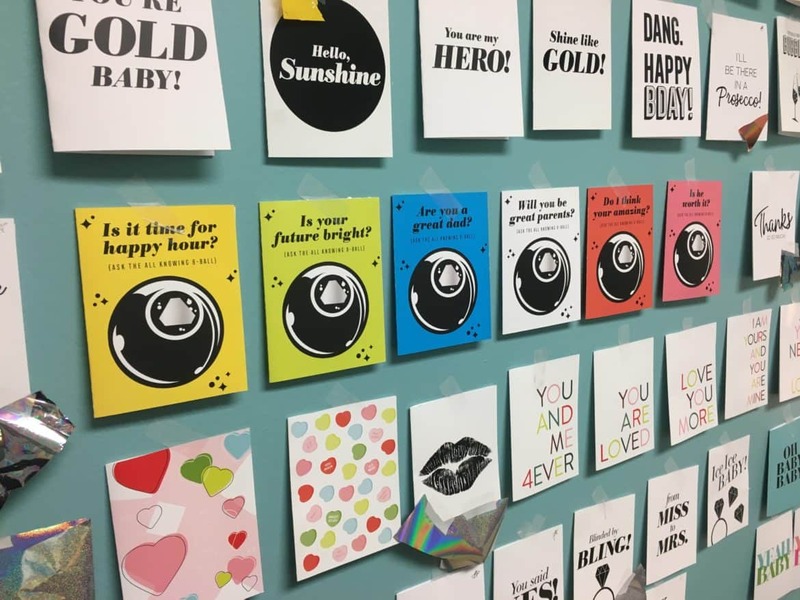 It gives us the confidence to take bold steps to find purpose and passion and redefine success and what makes us happy,” says Pressman. 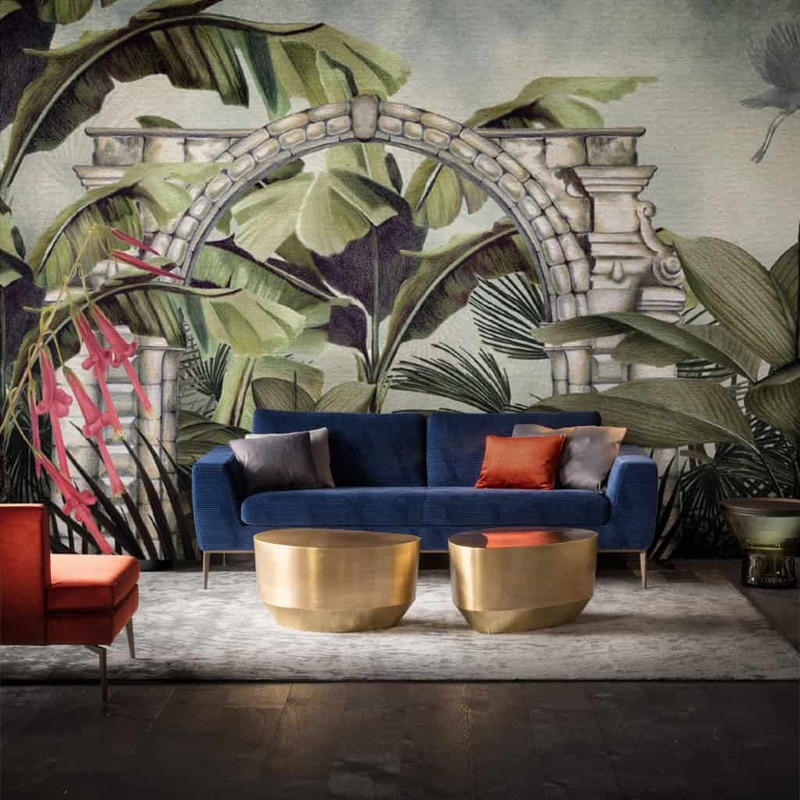 Fresh off the heels of Pantone’s 2017 Color of the Year announcement, upholstery and occasional furniture manufacturer Hancock & Moore unveils their array of sofas and accent seating in Greenery. Dubbed as fresh and revitalizing, the zesty green color is shown in different fabrics and leathers for an eclectic look. 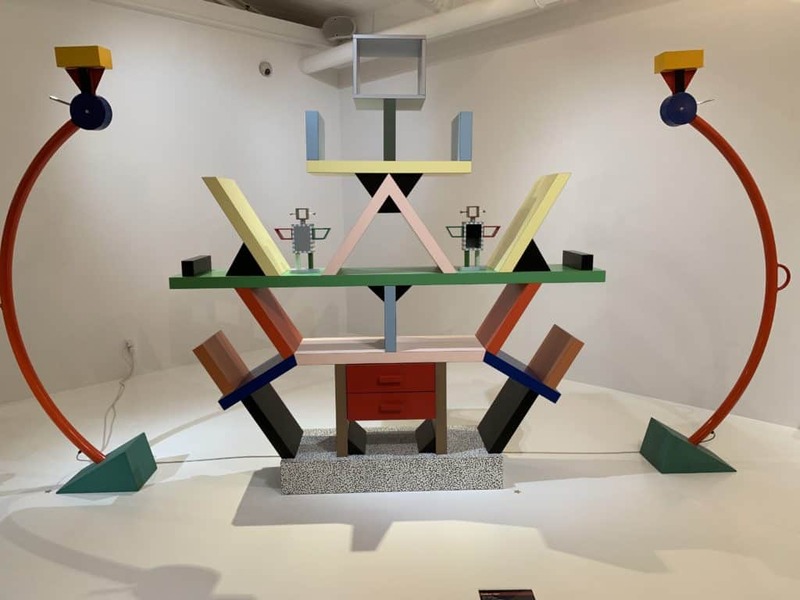 Meet Lady Gaga’s furniture maker muse, globally recognized artist and TEDx Speaker Benjamin Rollins Caldwell repurposes items from our throwaway culture into sculptural furniture. 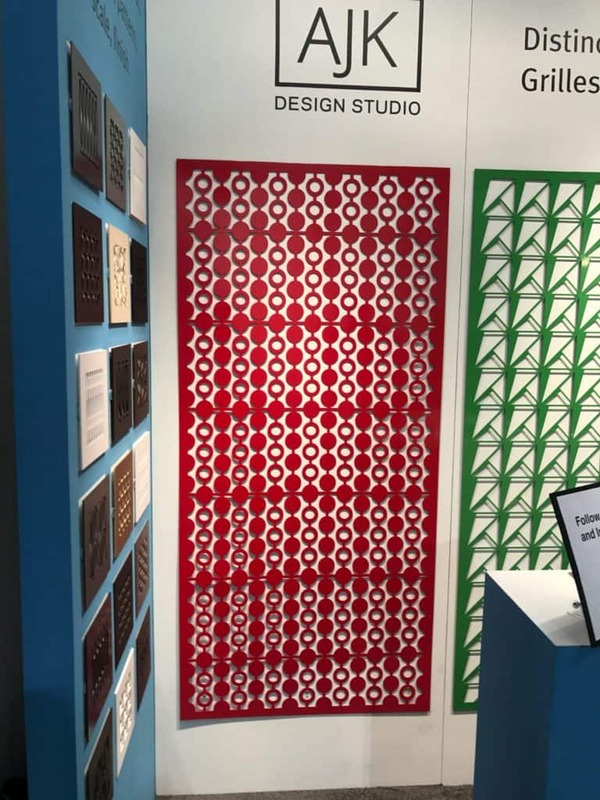 I met Caldwell during Art Basel where he was showcasing his Binary Collection of sculptural ‪furniture made from pallets of obsolete computers. 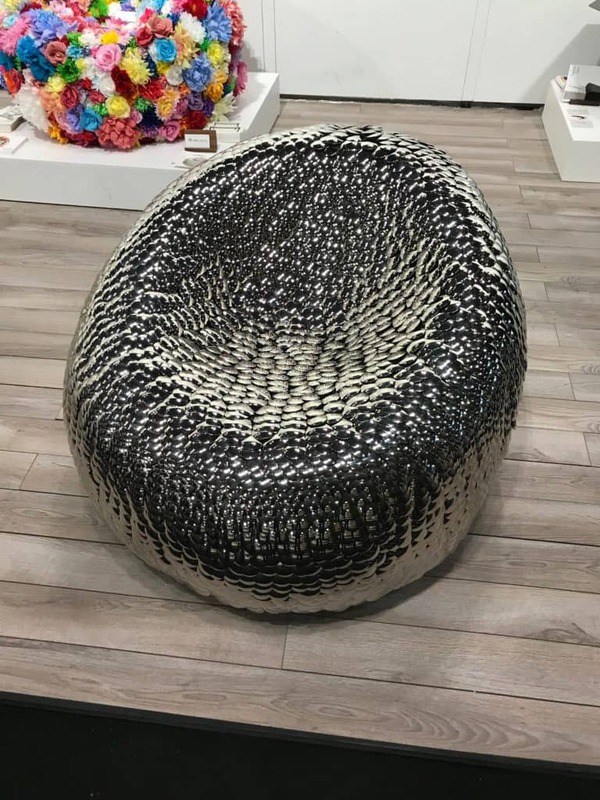 His BinaryChair is featured on a Lady Gaga’s album cover. 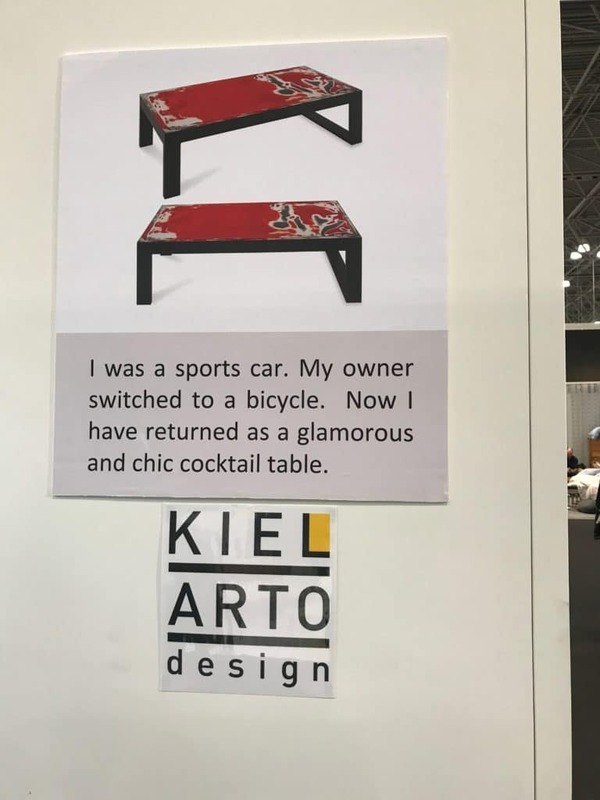 The Design Tourist Karen LeBlanc goes on location at the International Contemporary Furniture Fair (ICFF) scouting unique design finds and discovers a new company Twist Modern offering the design freedom to customize your furniture without the custom price tag or long wait time. 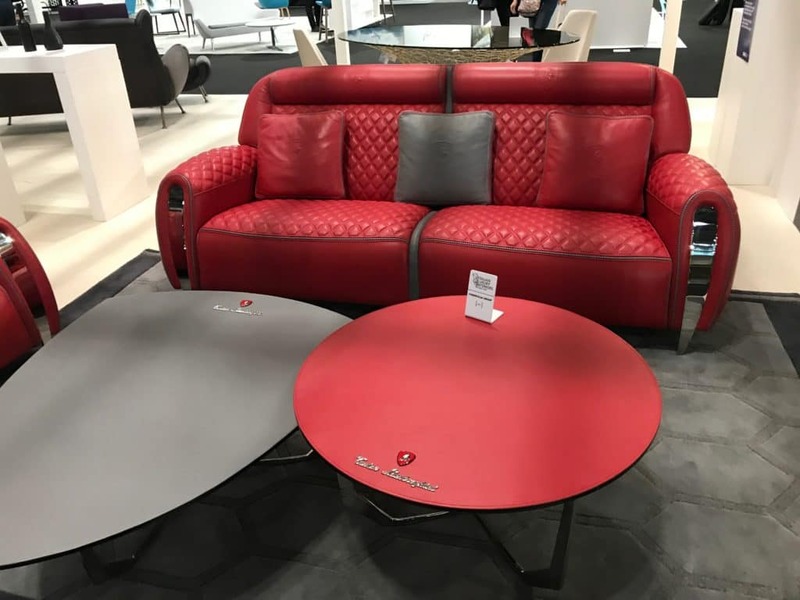 The concept is revolutionary and completely relevant since the latest looks in home decor are all about personalizing your living space. 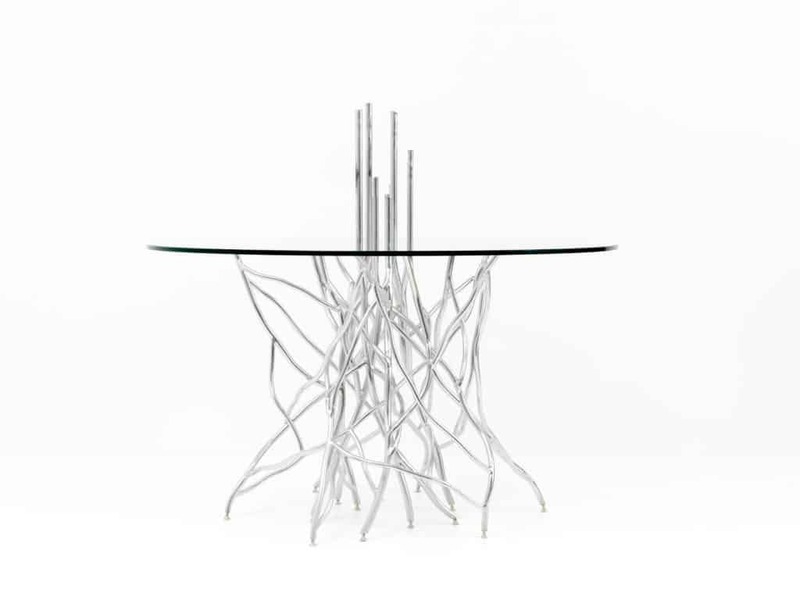 Check out the endless style options of Twist Modern’s Mix and Match Collections.